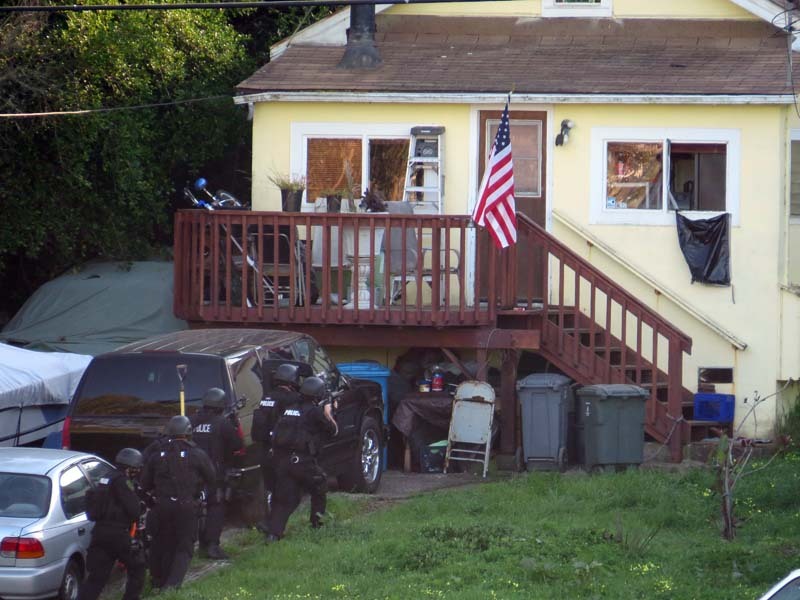 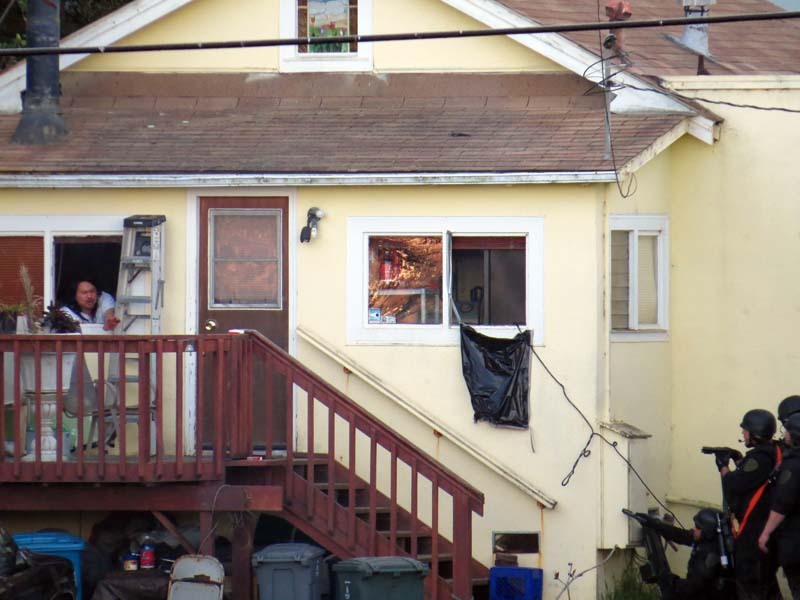 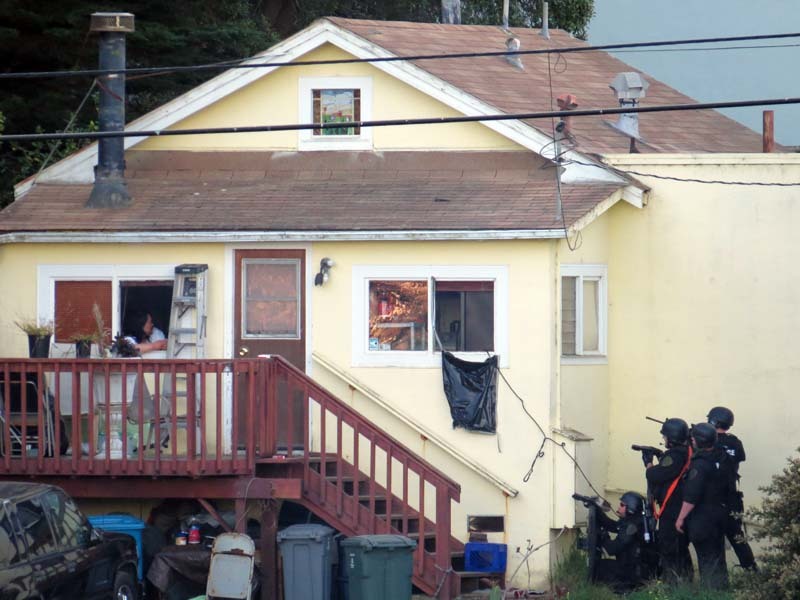 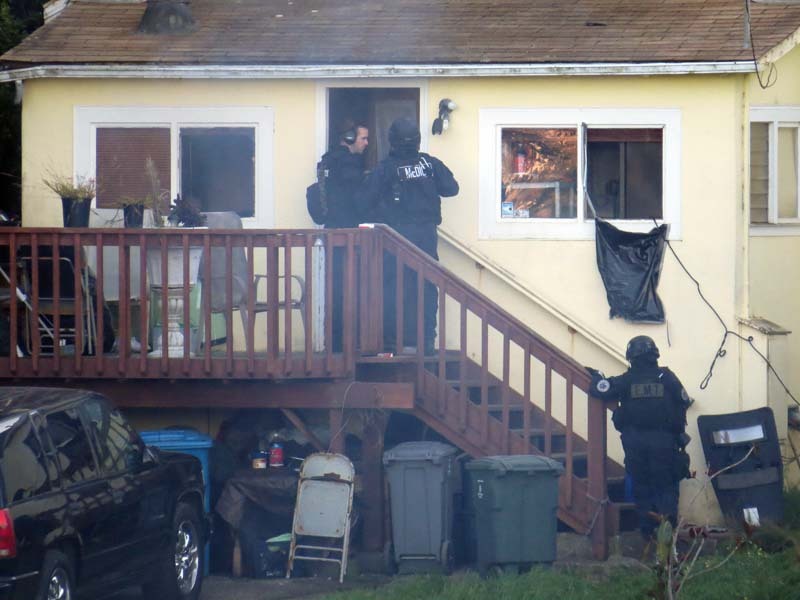 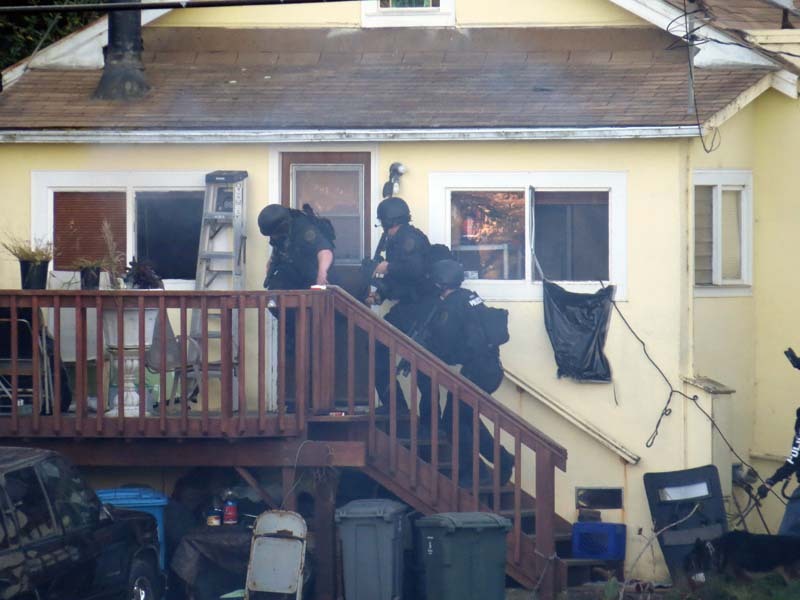 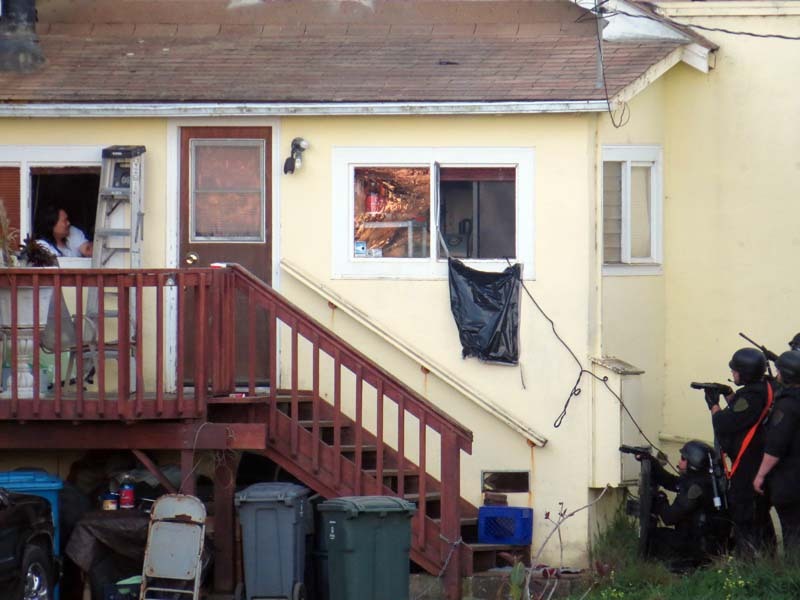 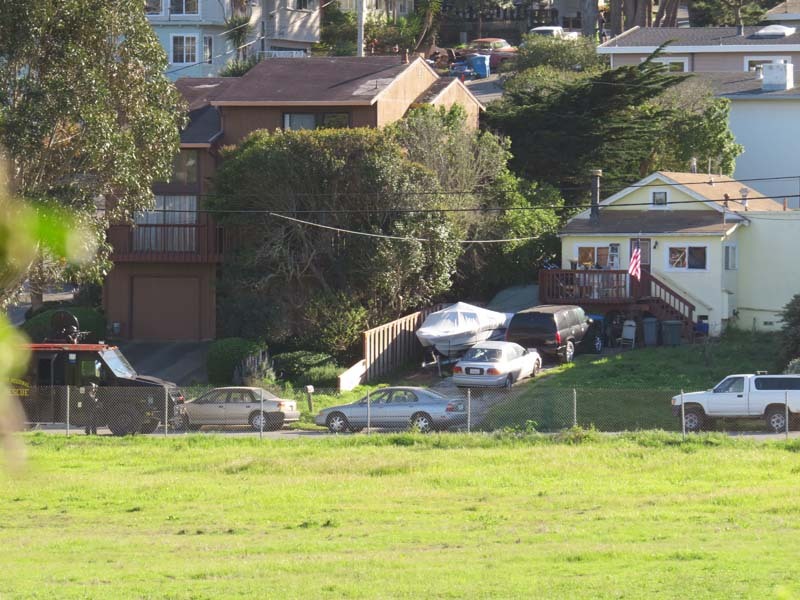 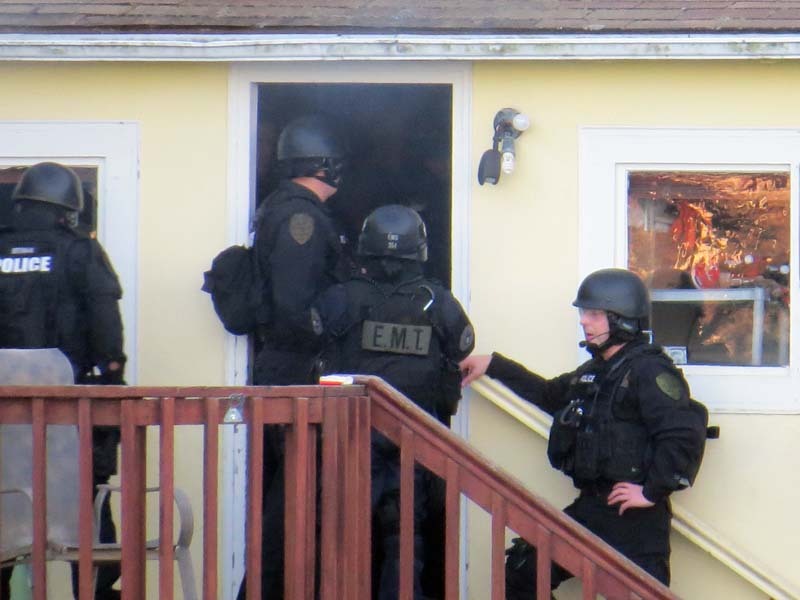 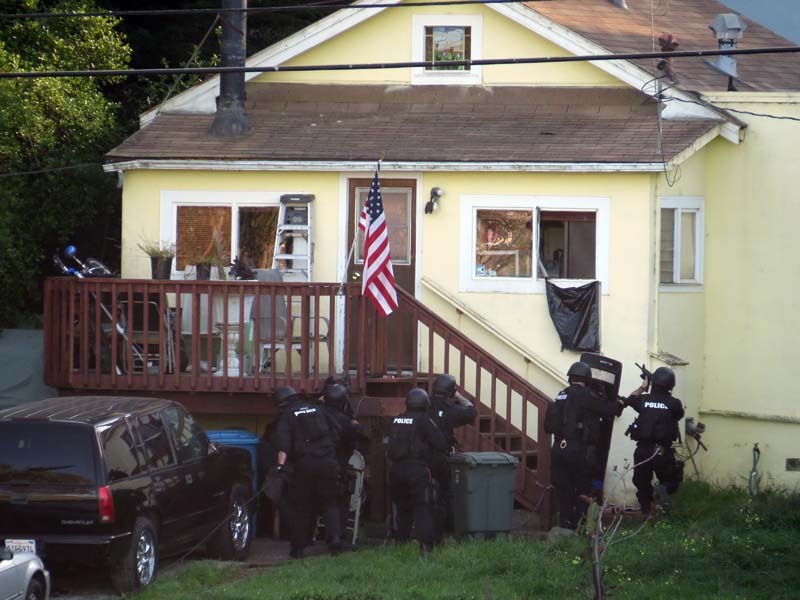 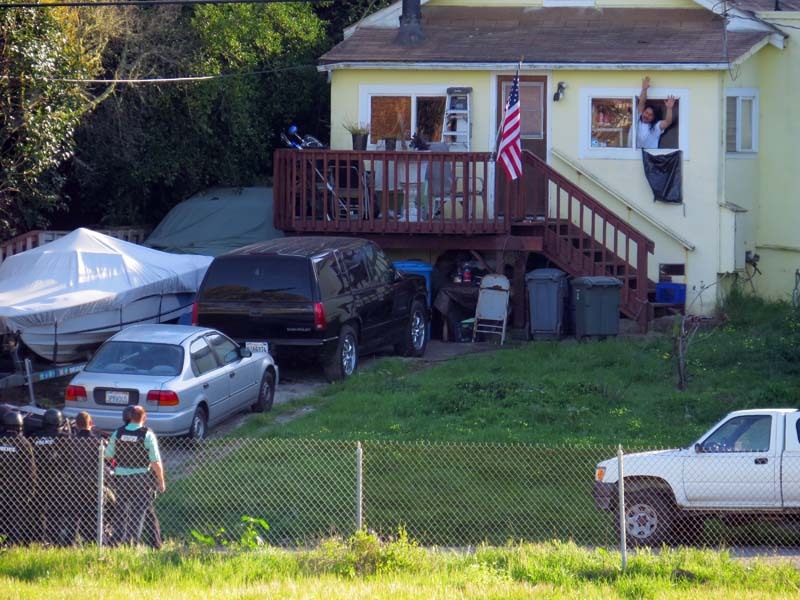 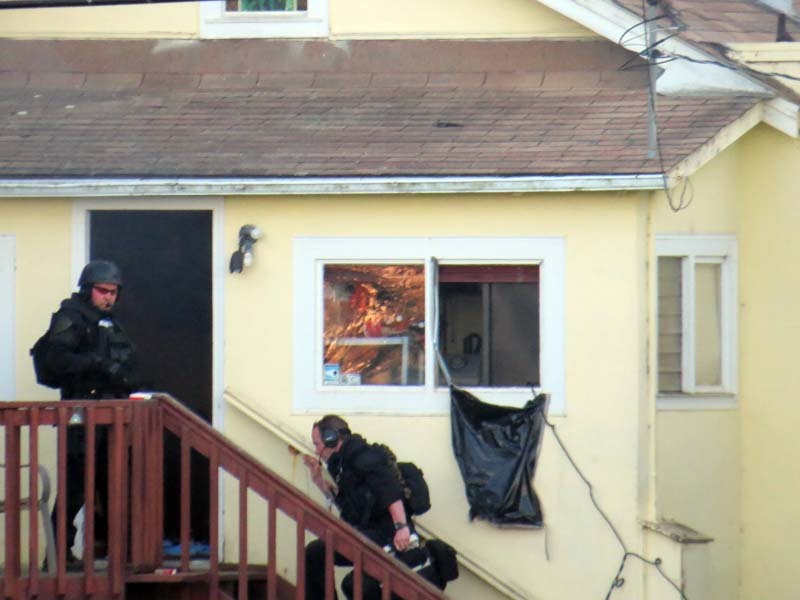 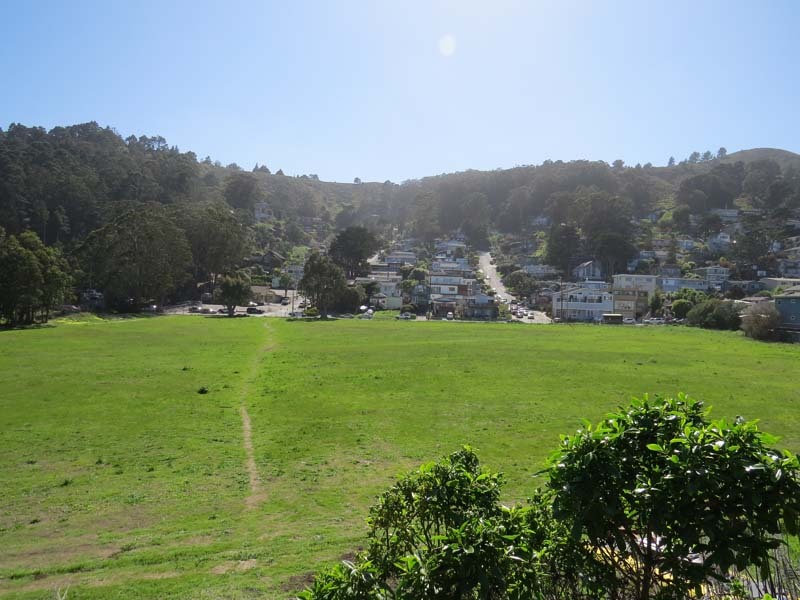 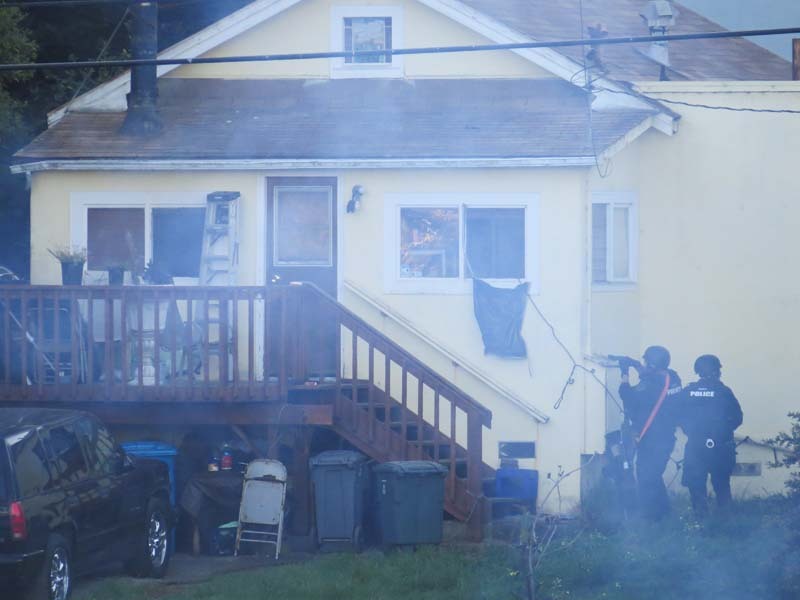 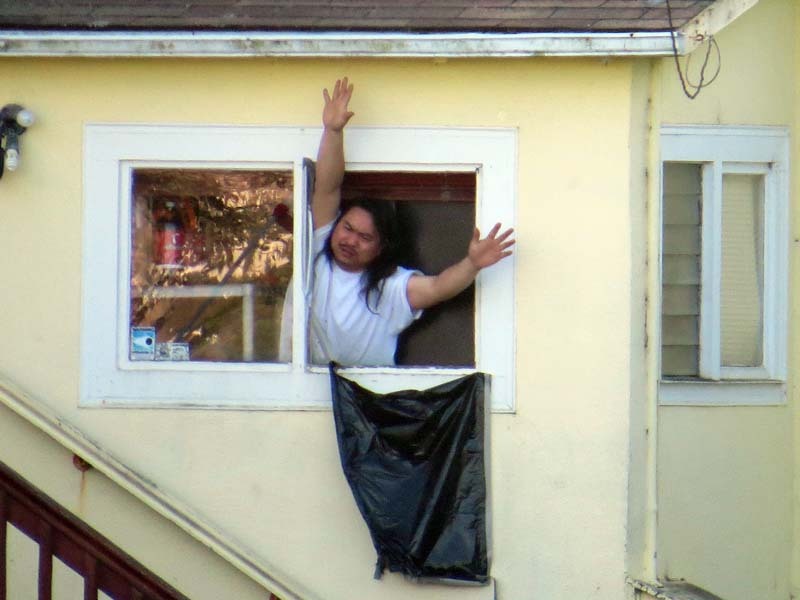 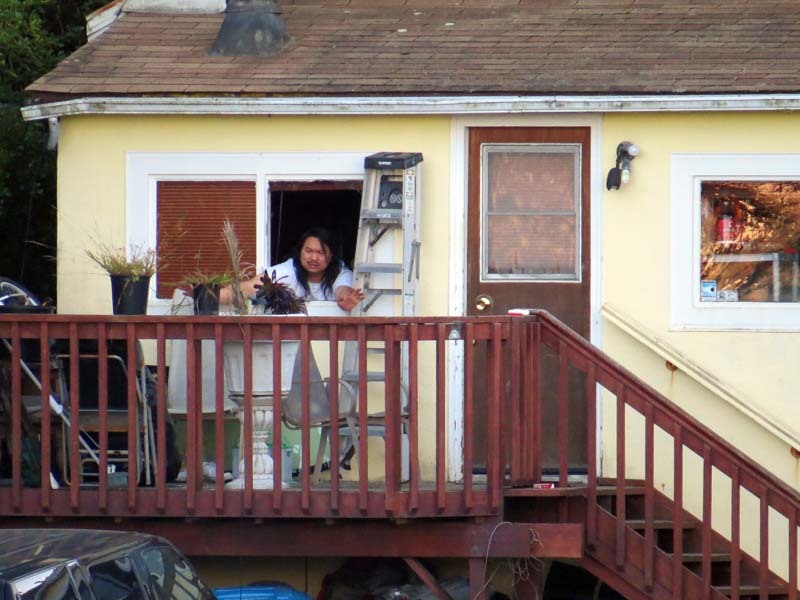 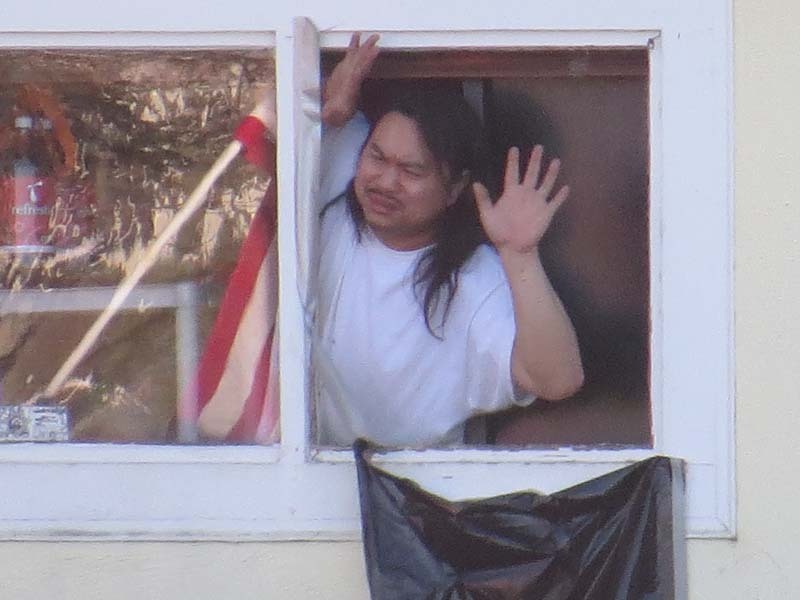 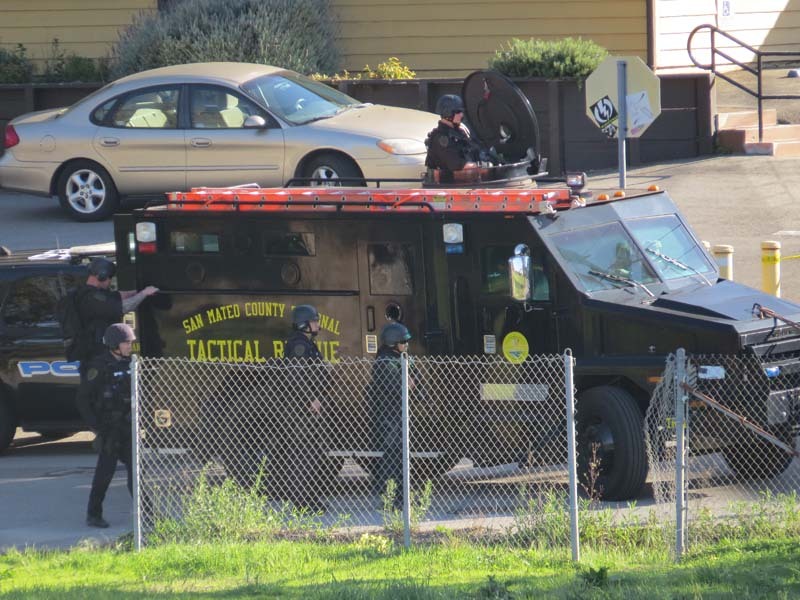 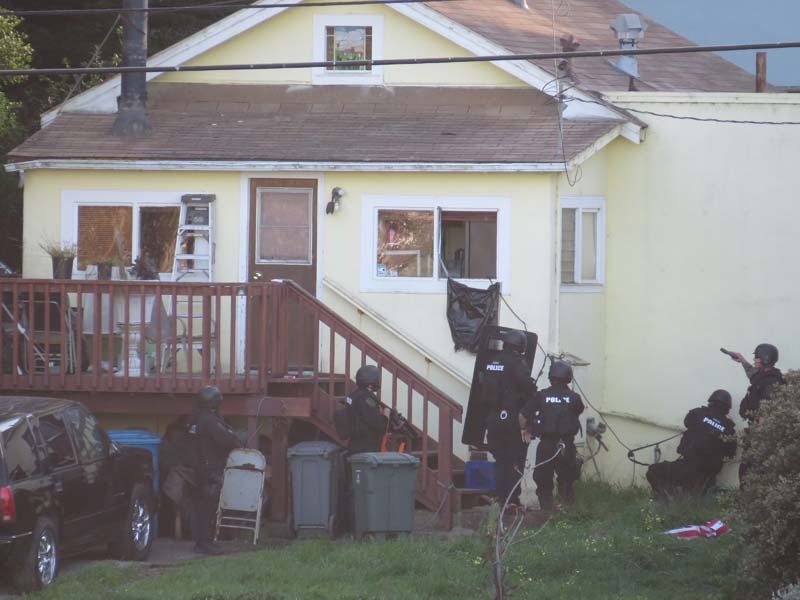 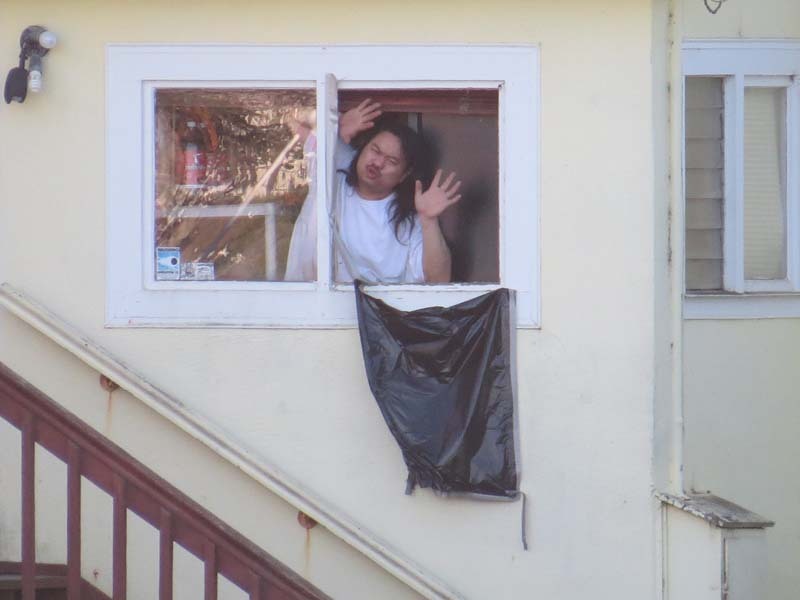 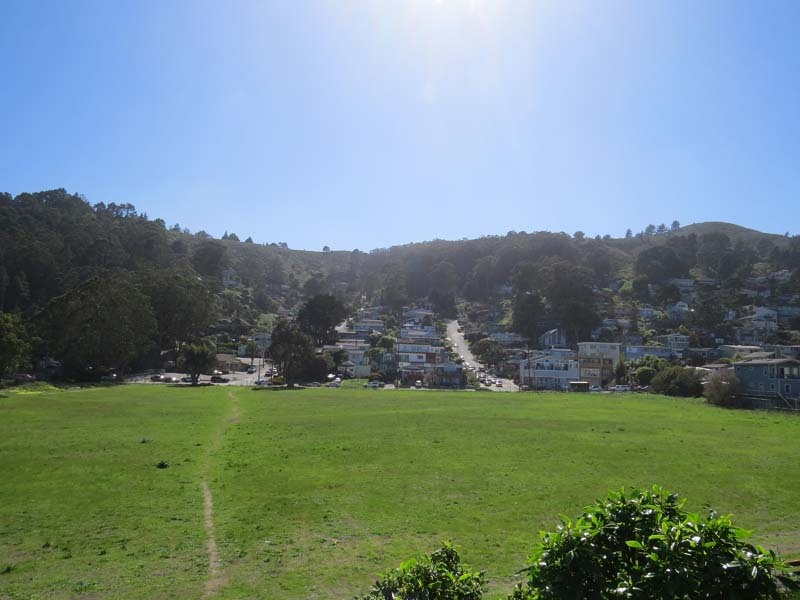 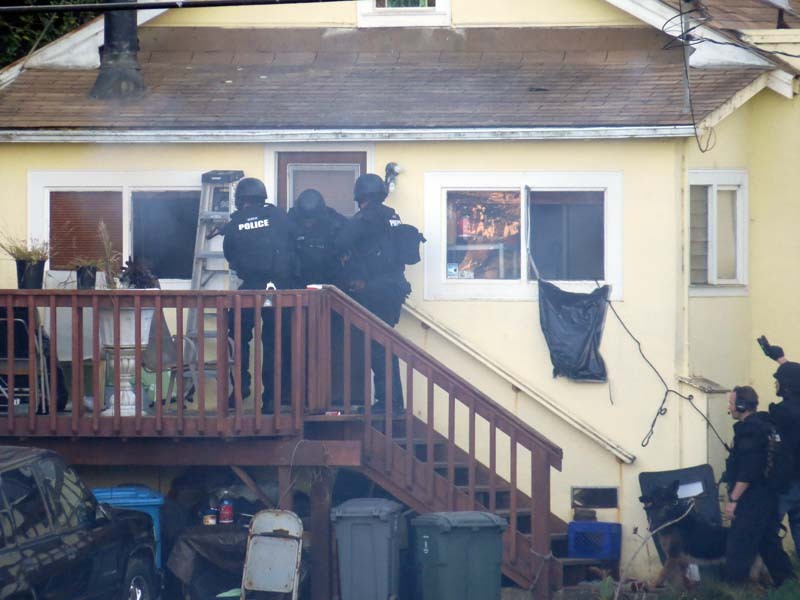 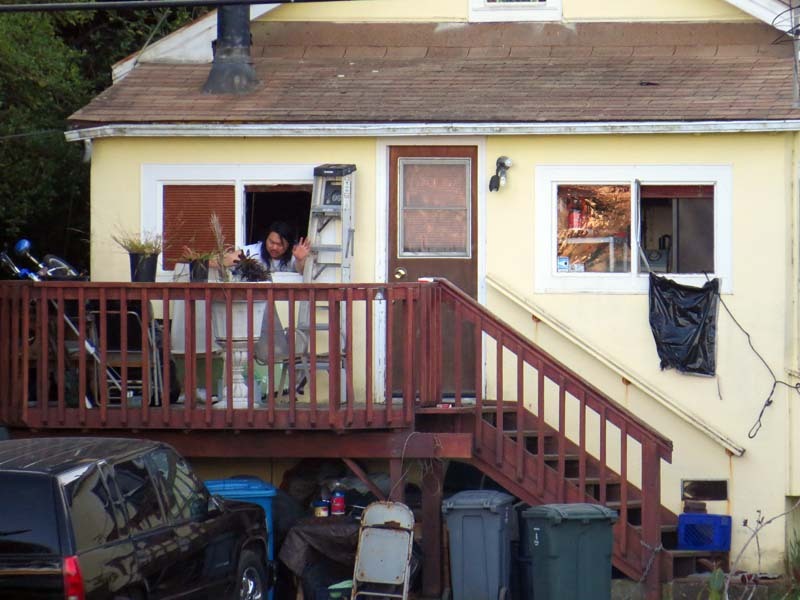 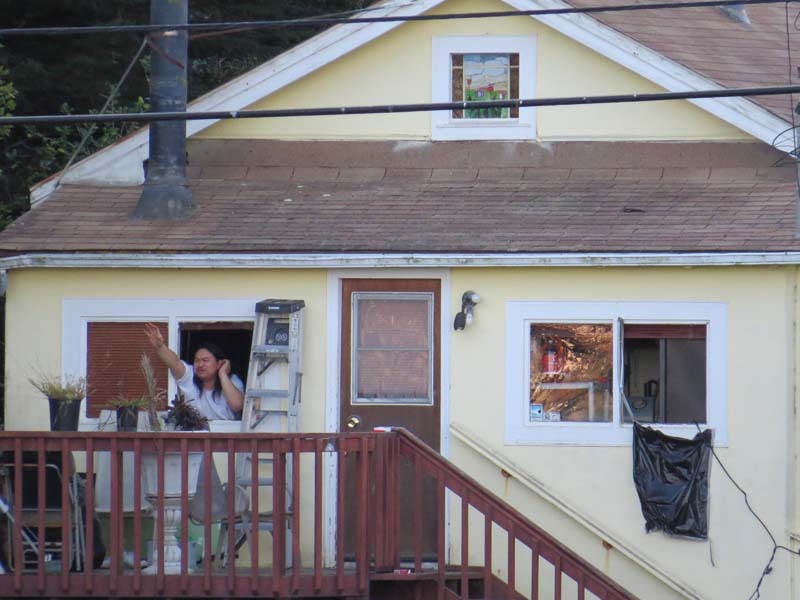 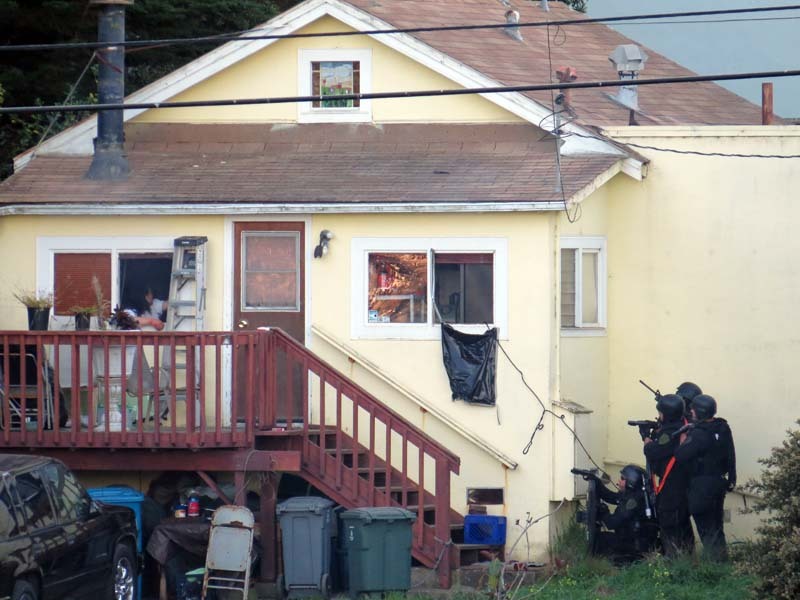 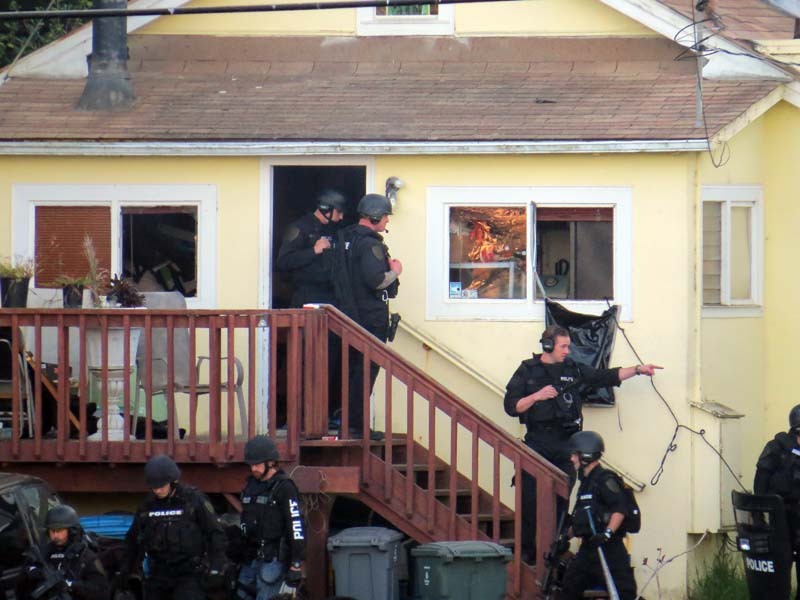 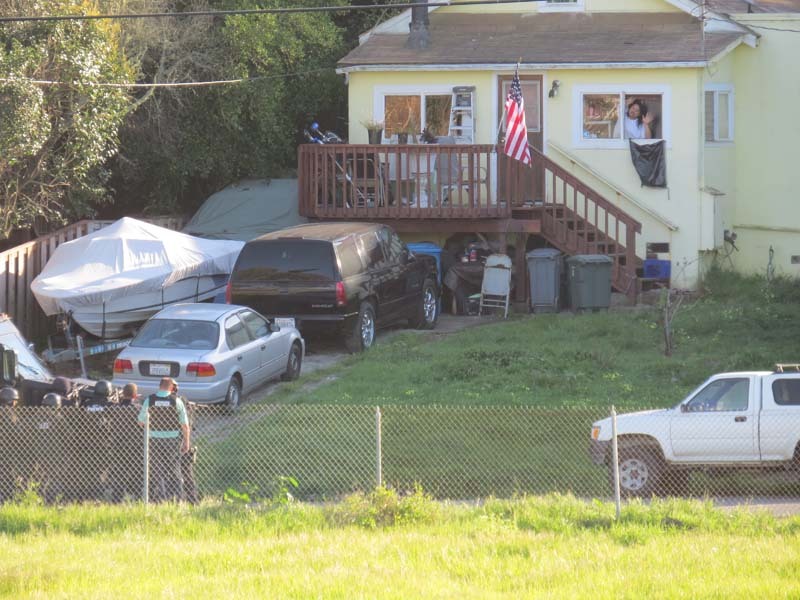 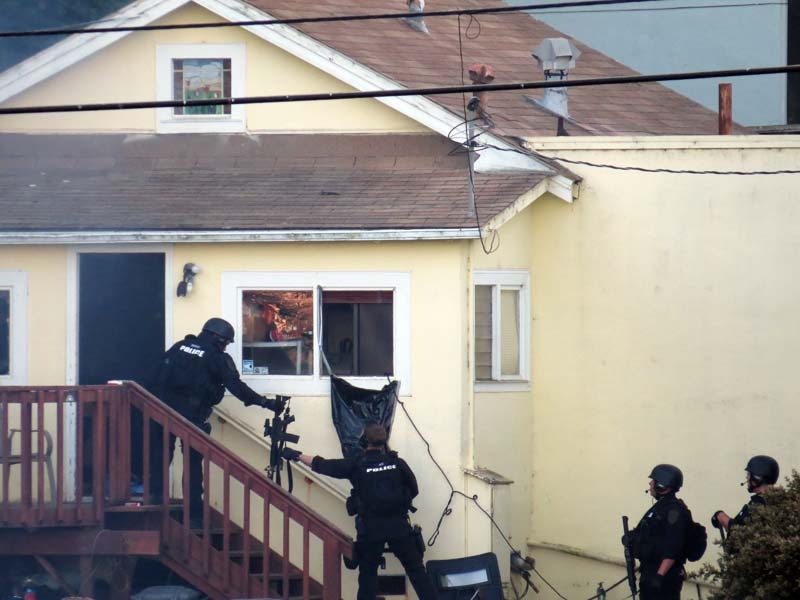 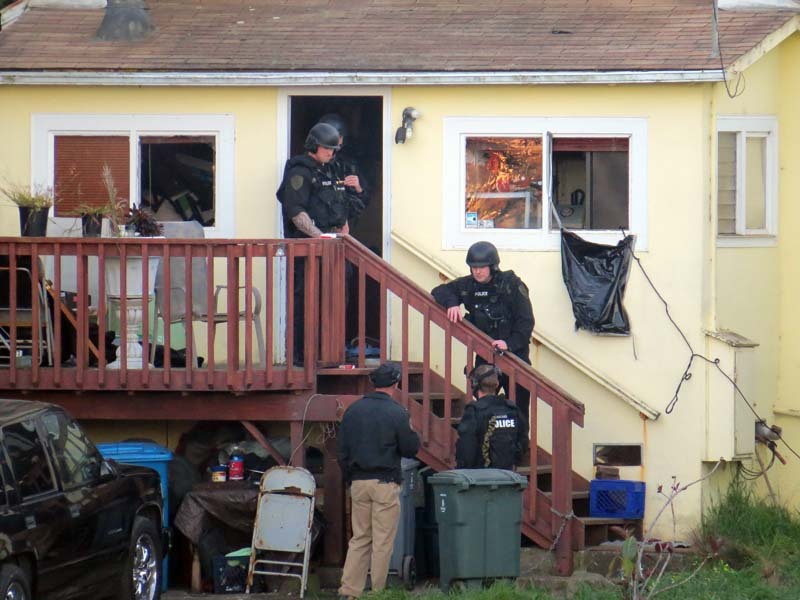 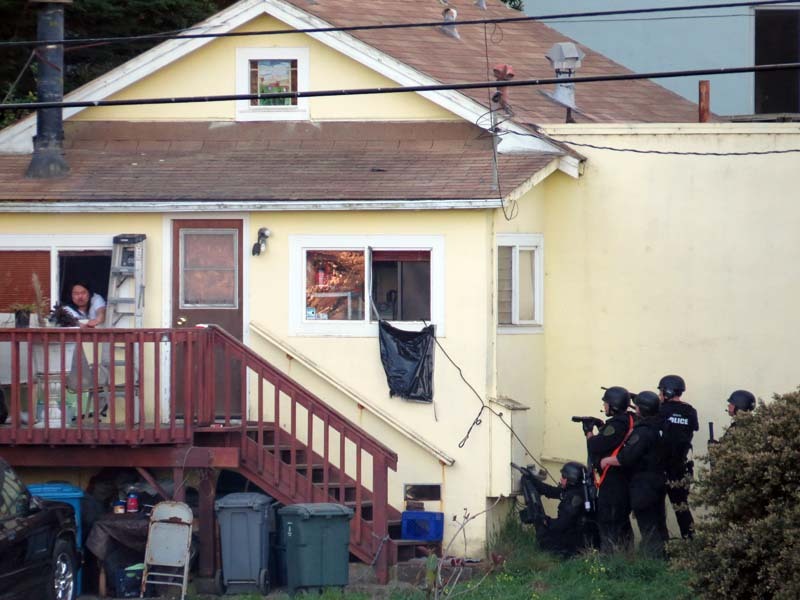 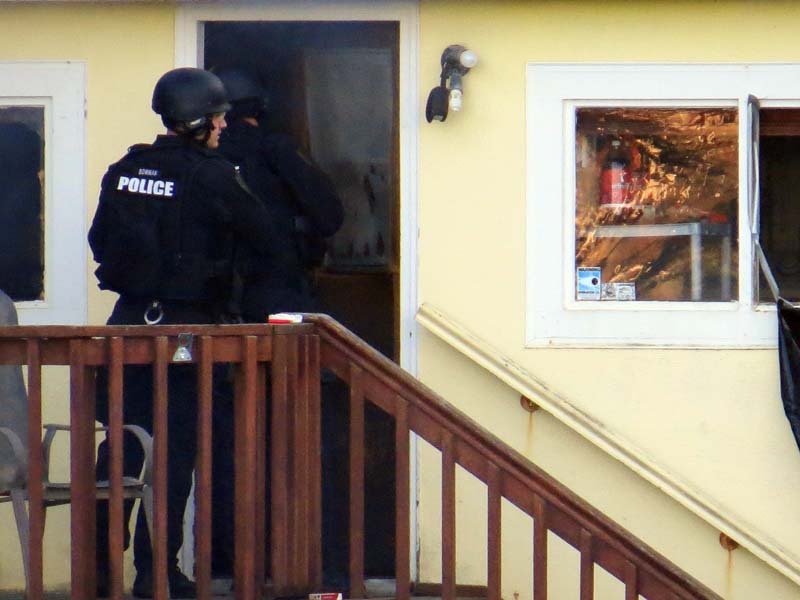 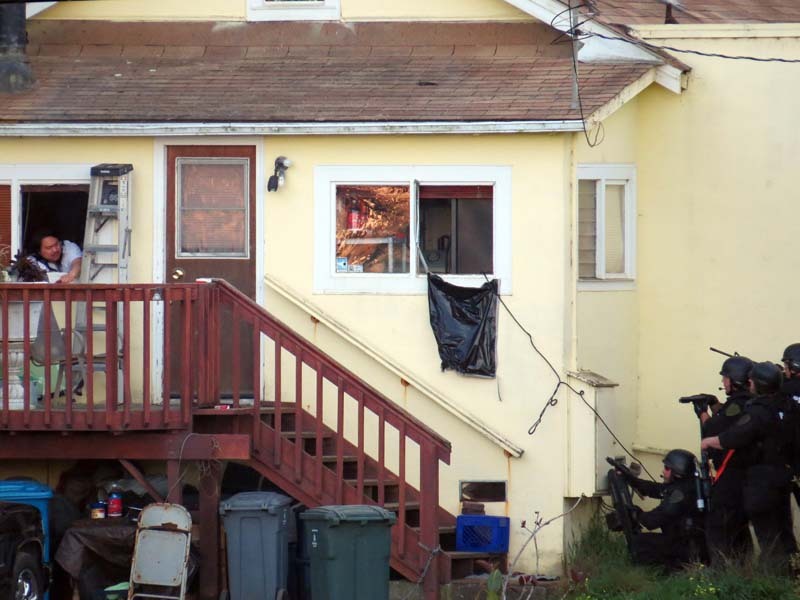 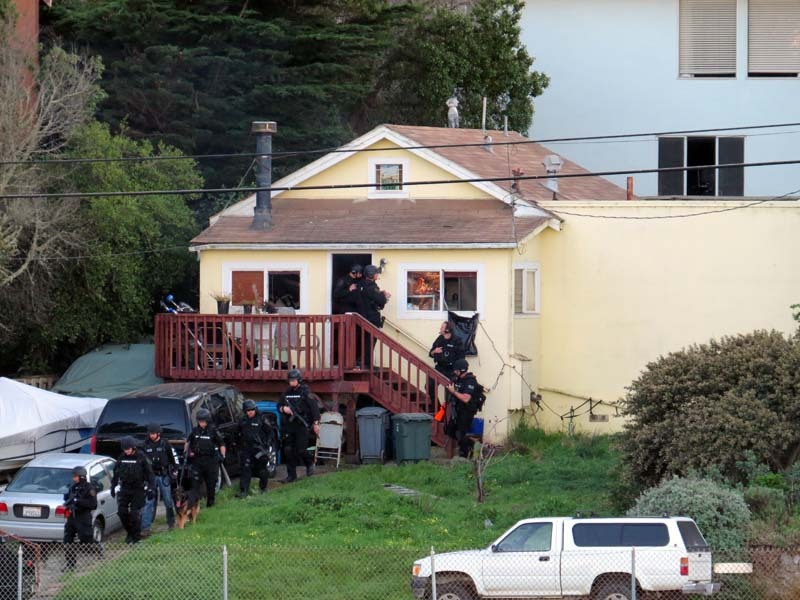 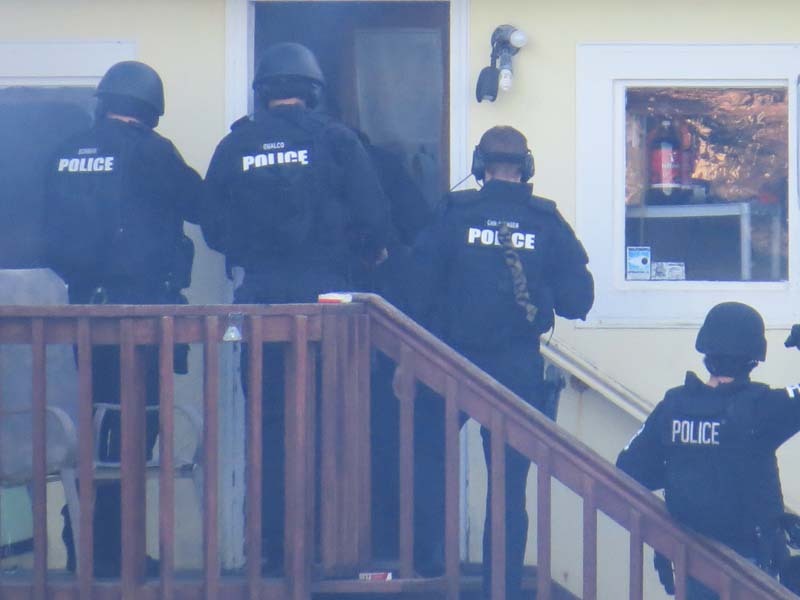 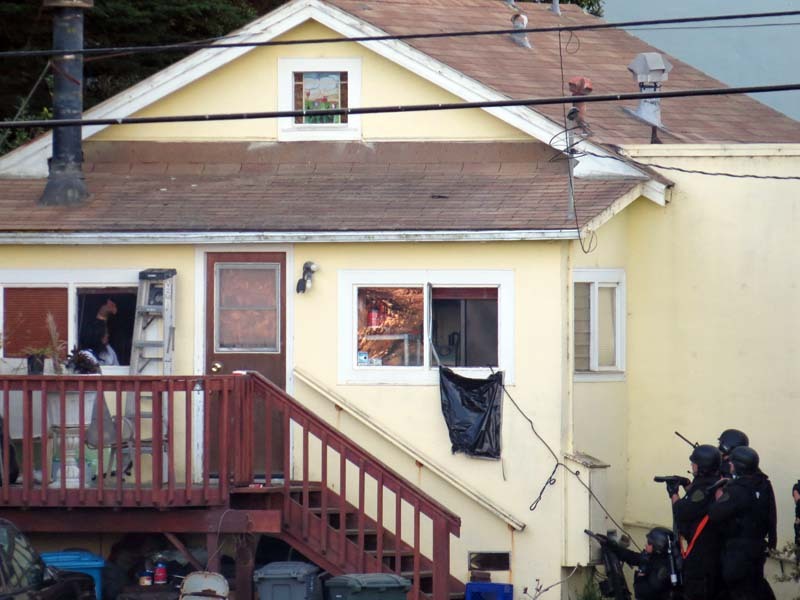 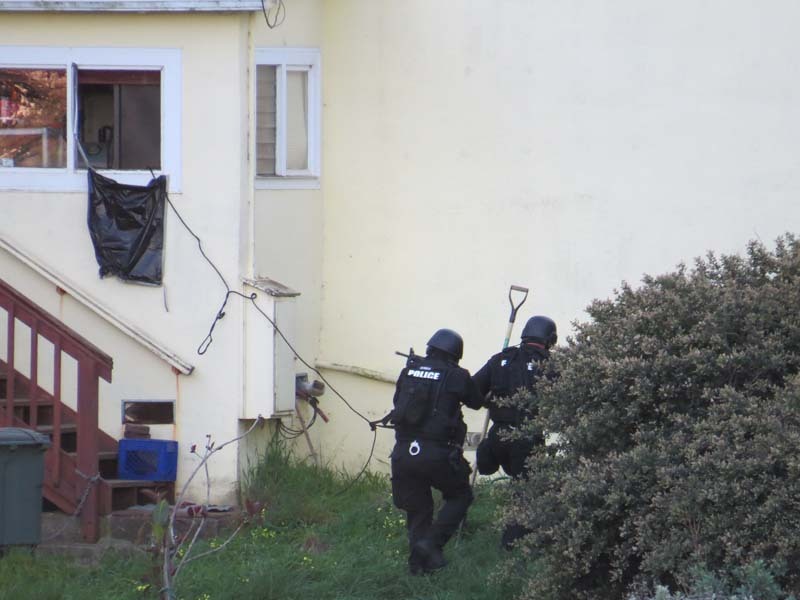 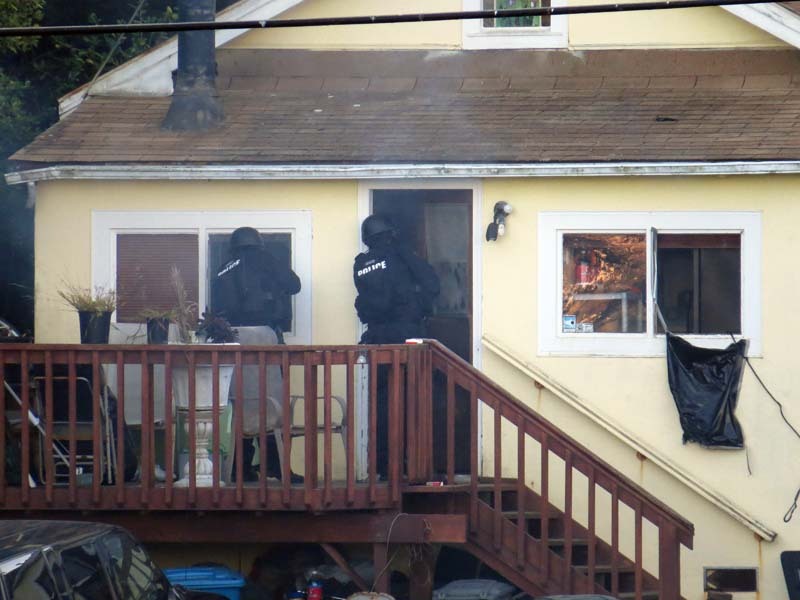 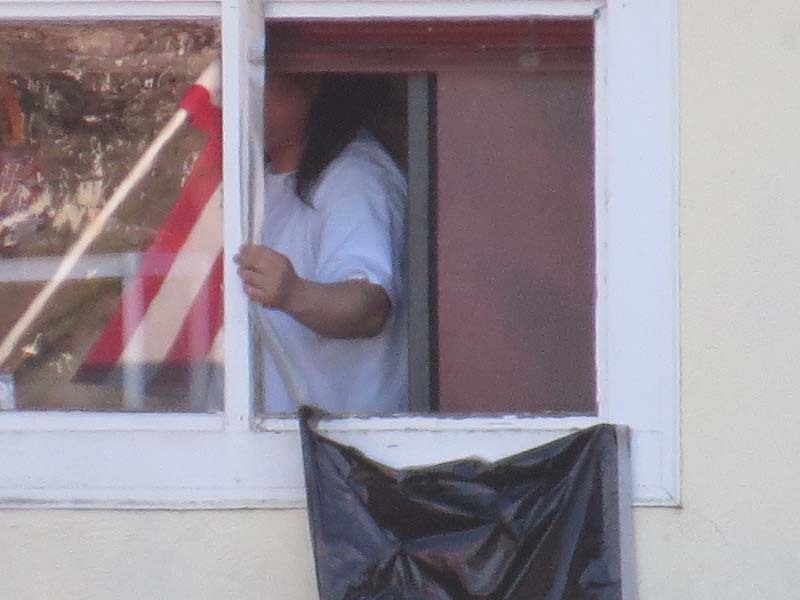 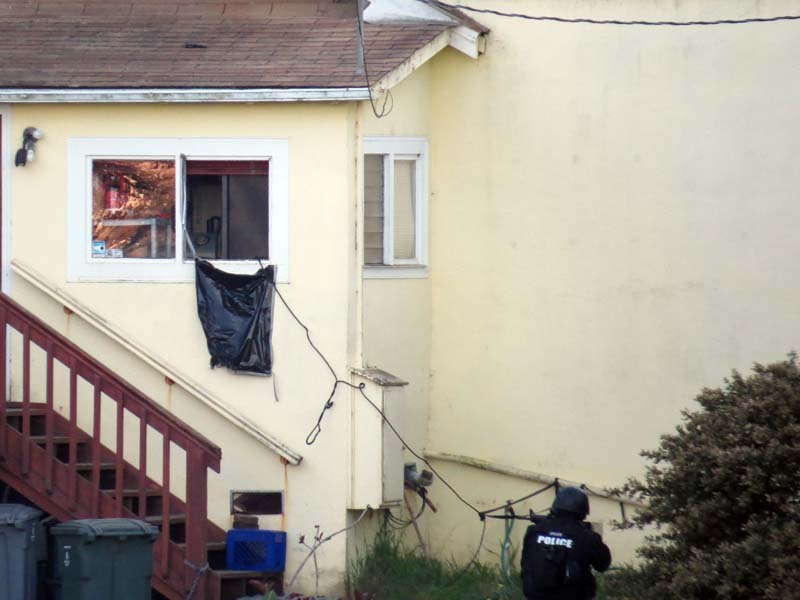 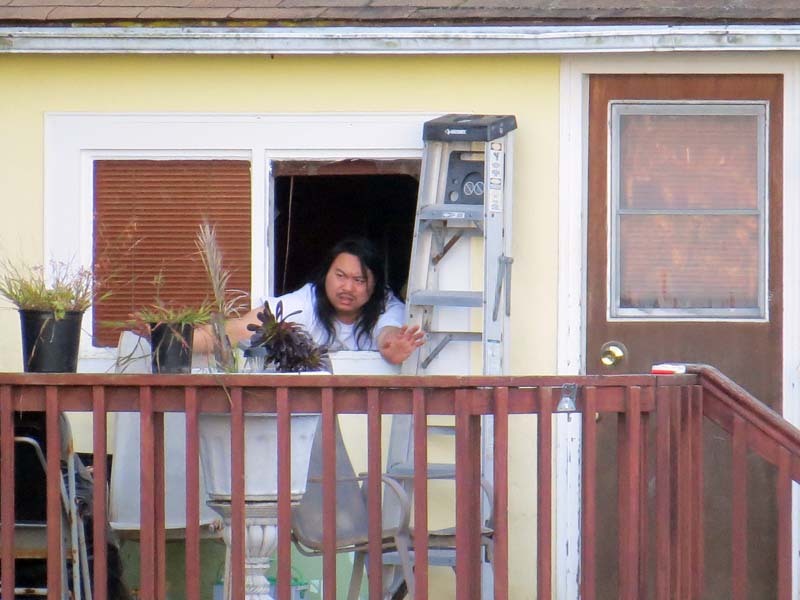 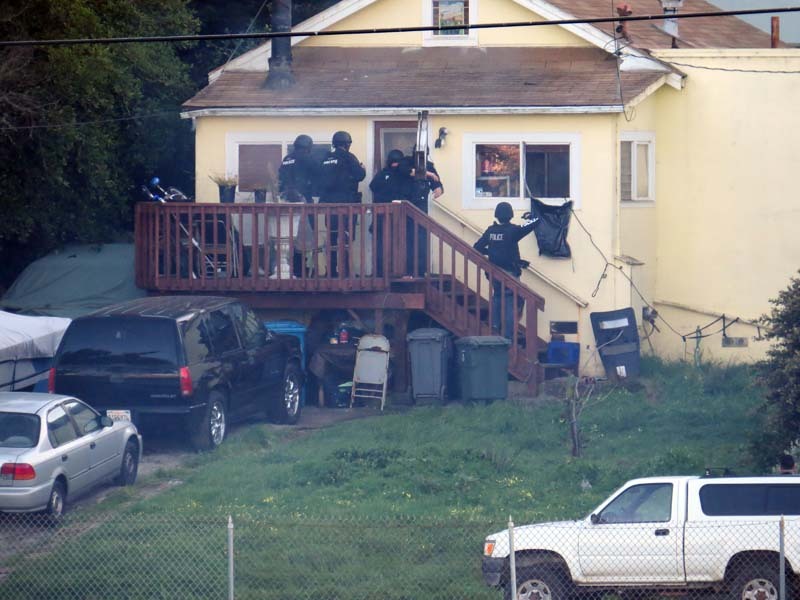 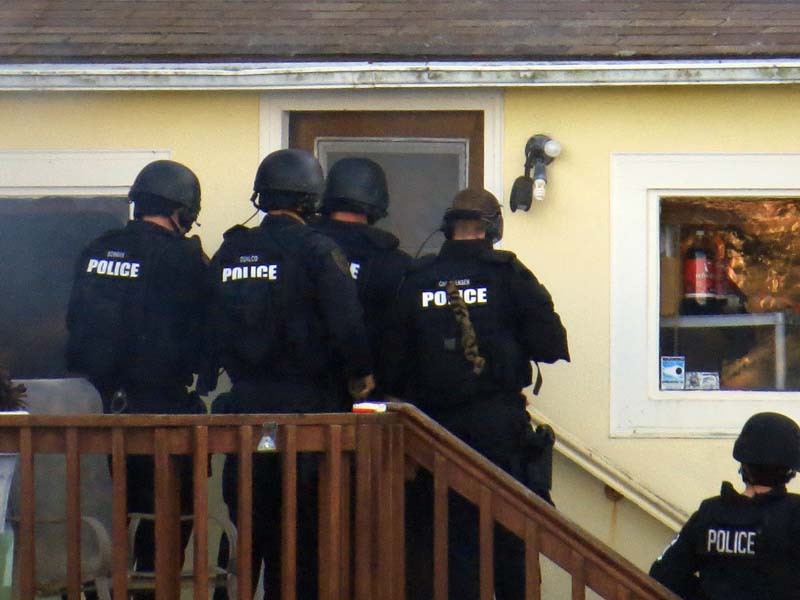 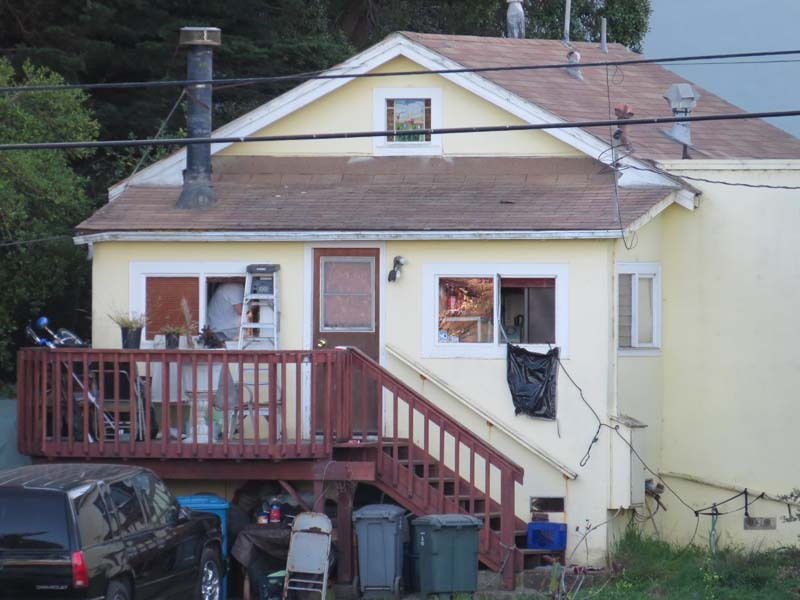 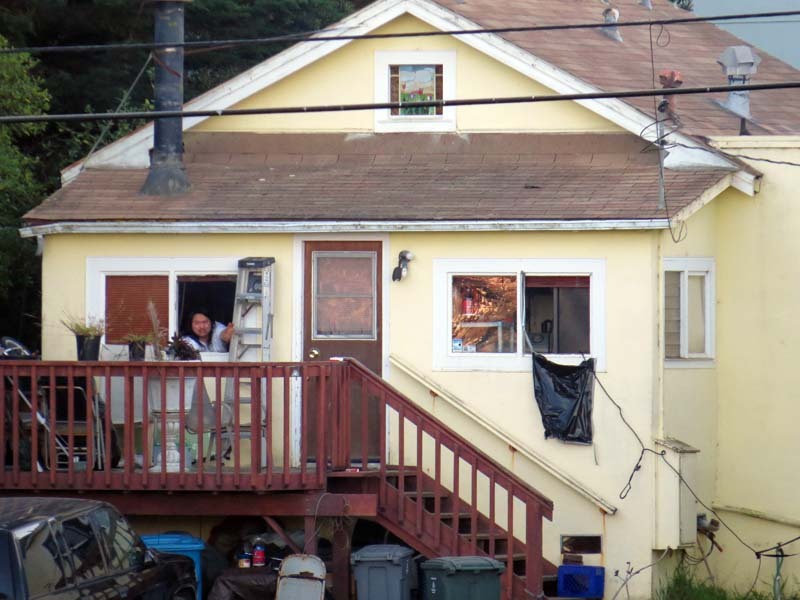 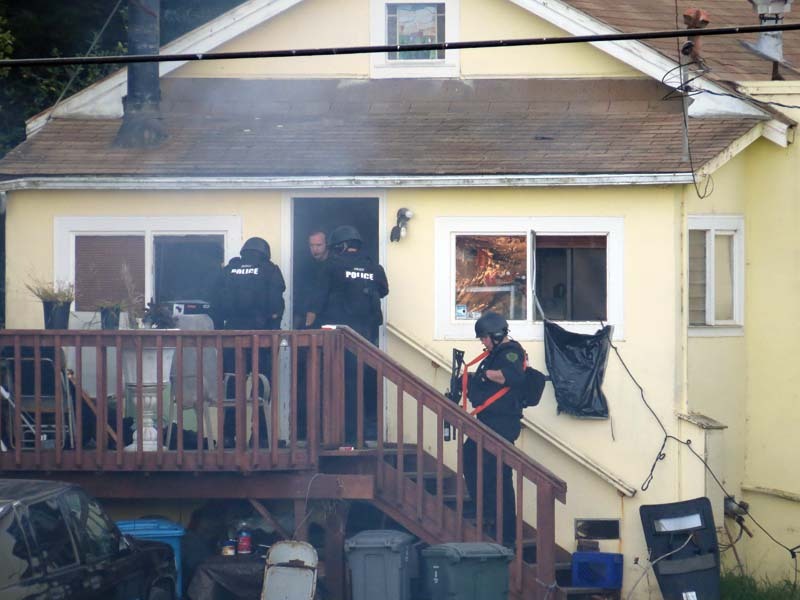 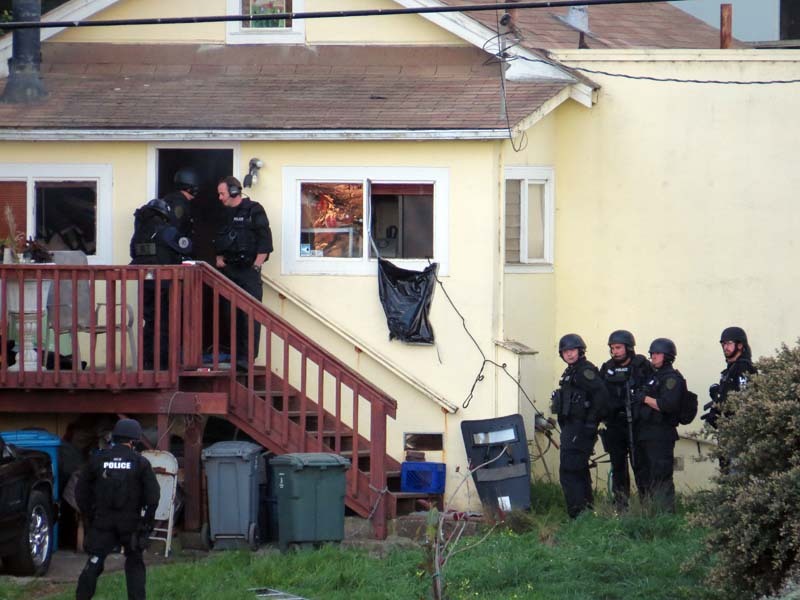 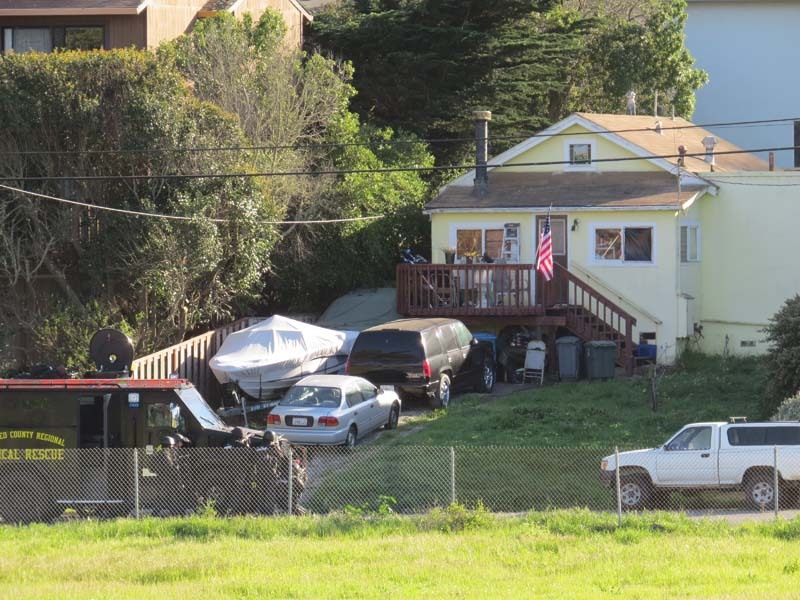 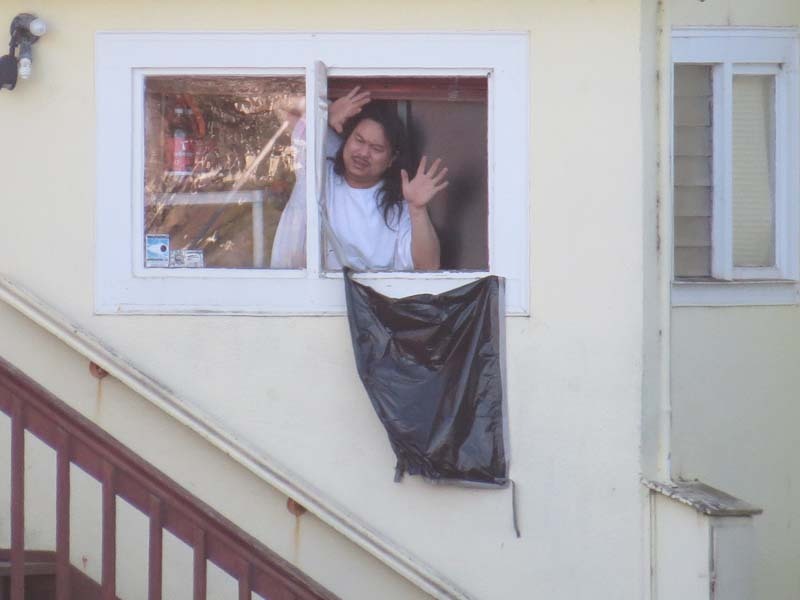 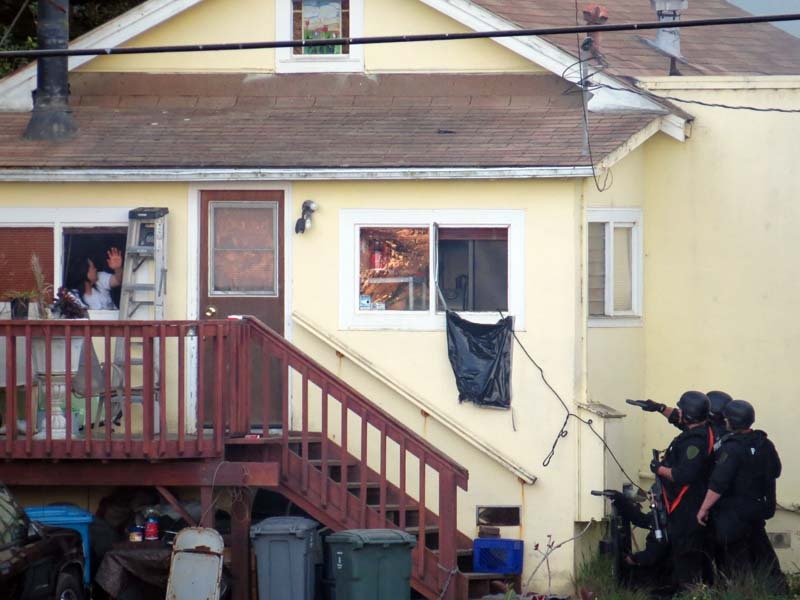 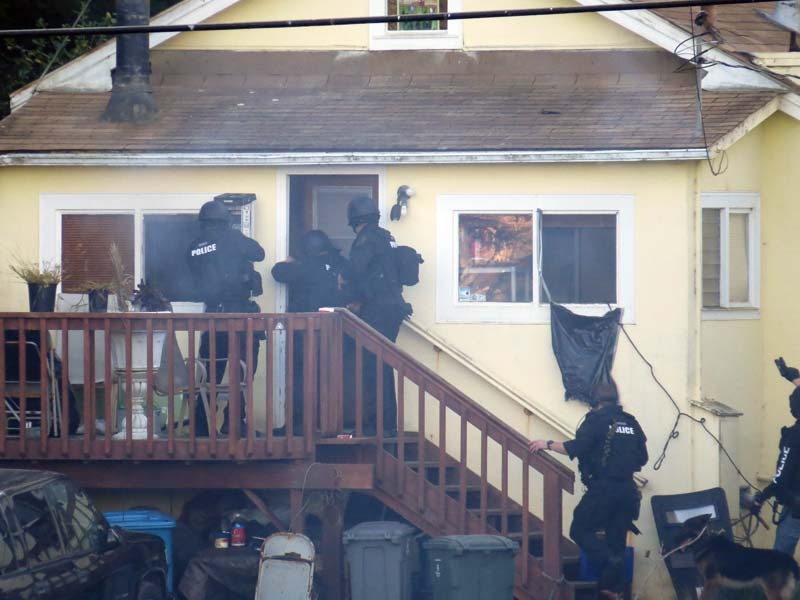 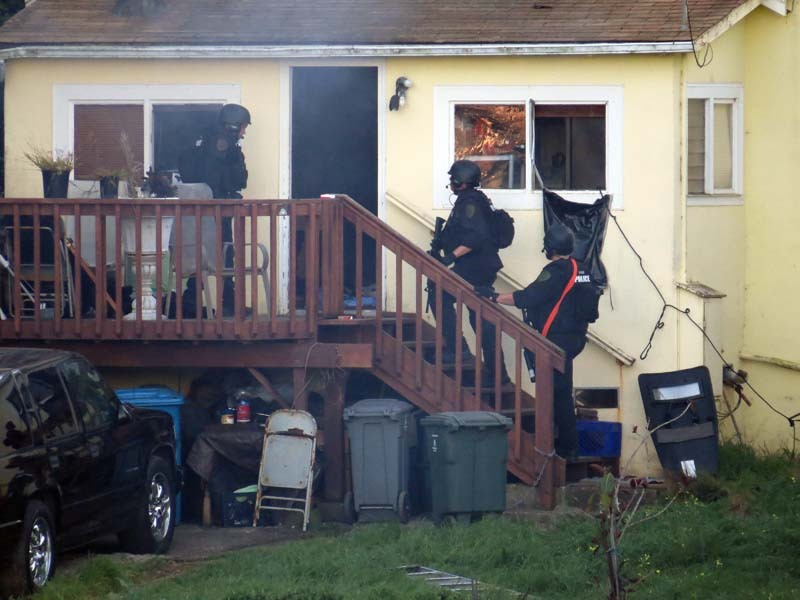 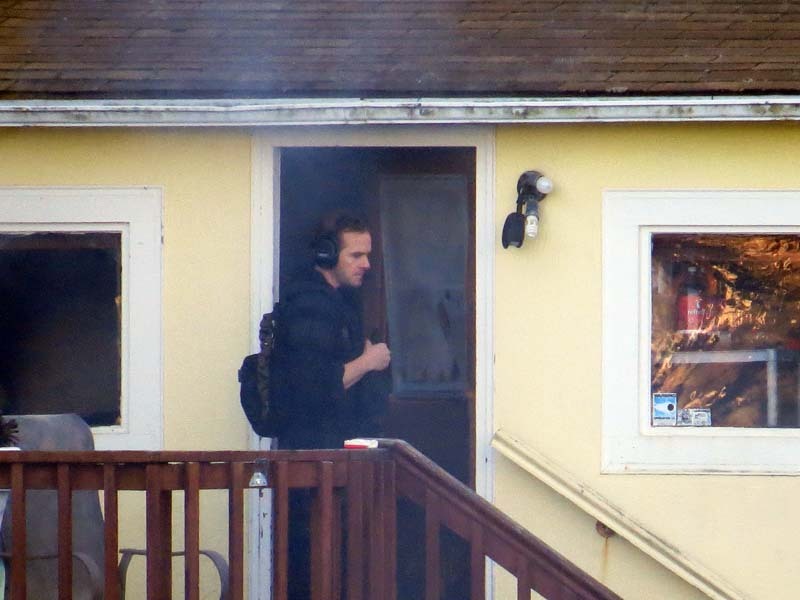 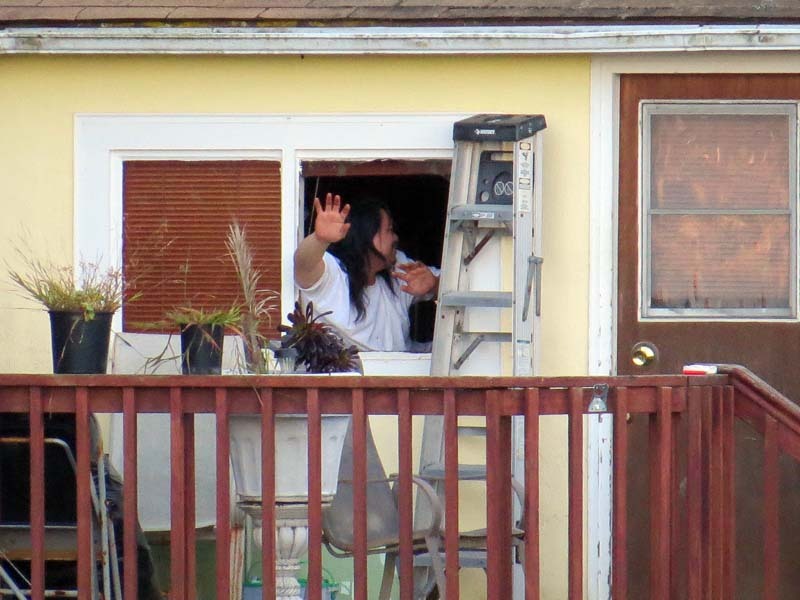 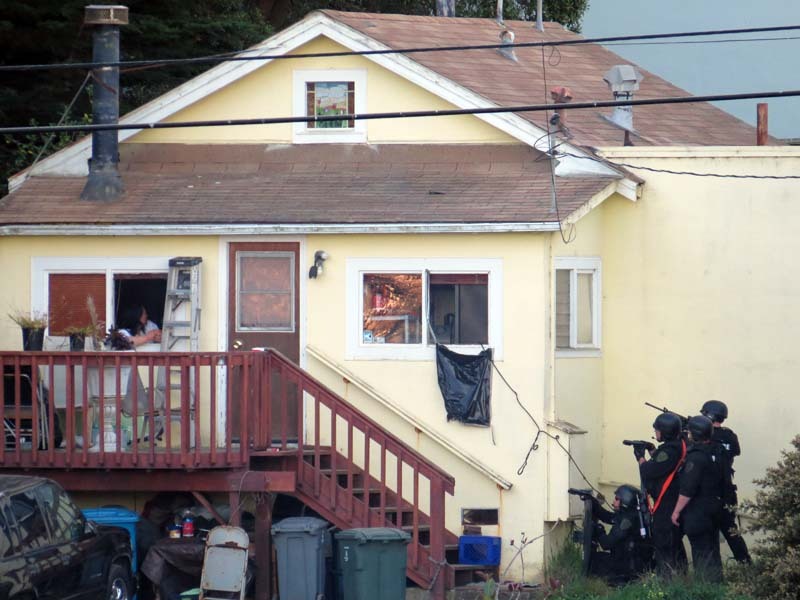 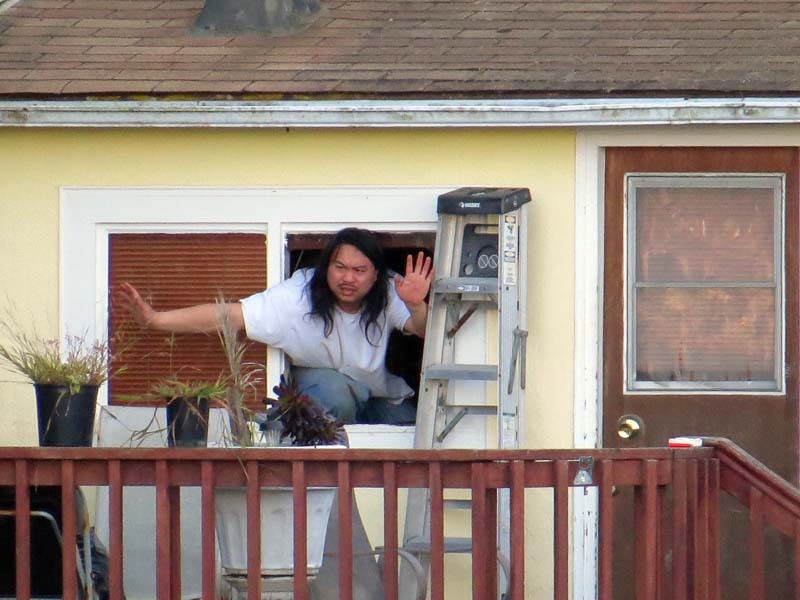 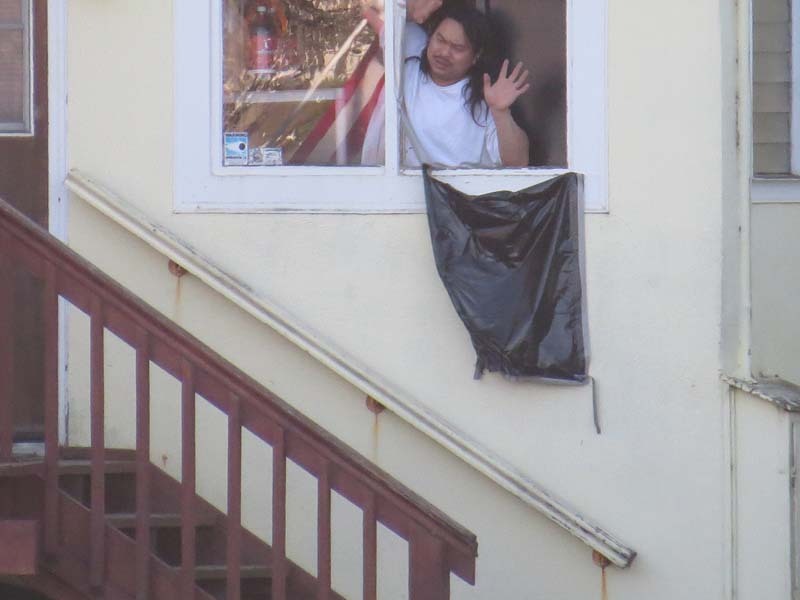 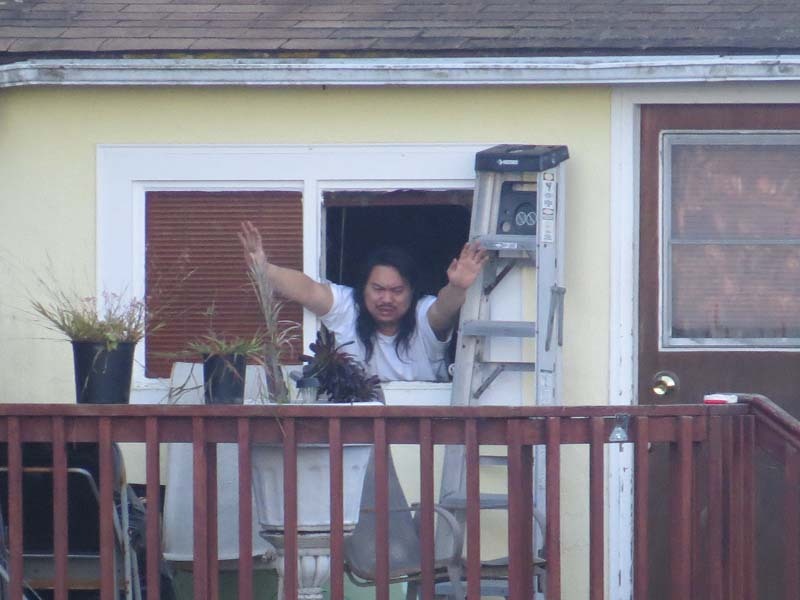 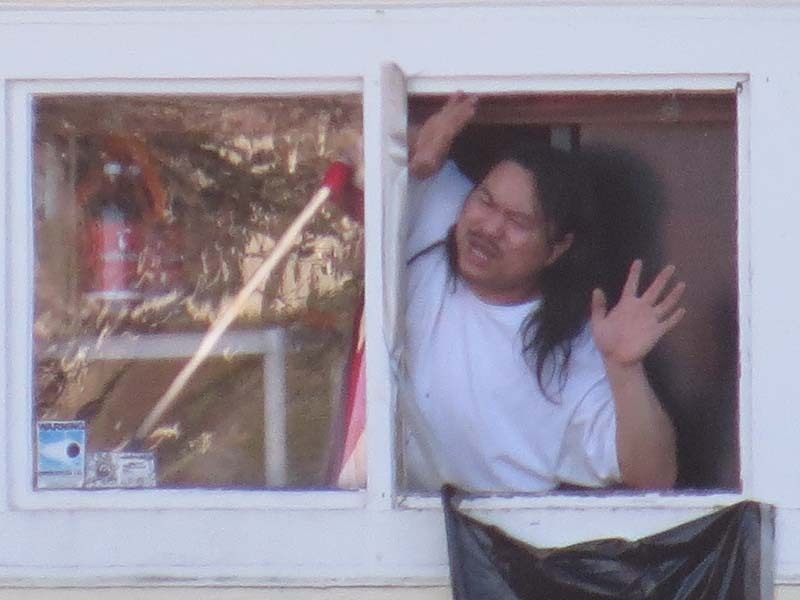 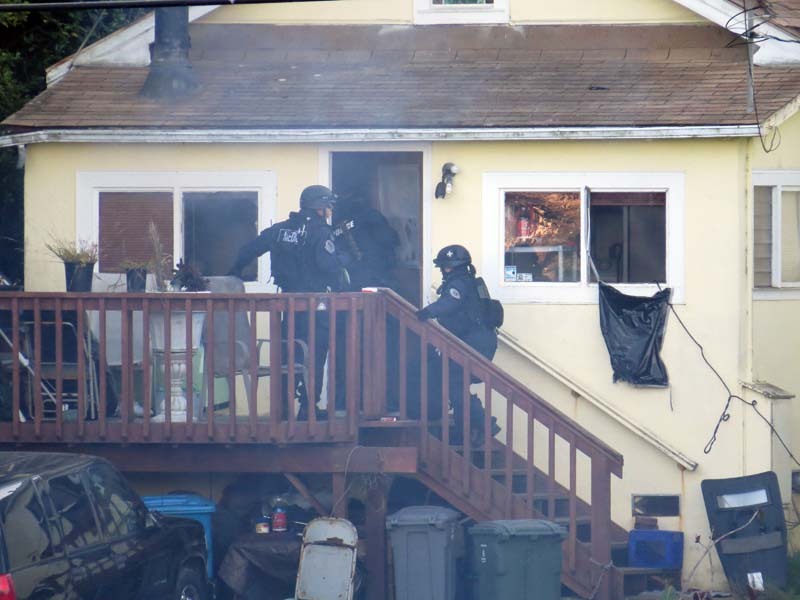 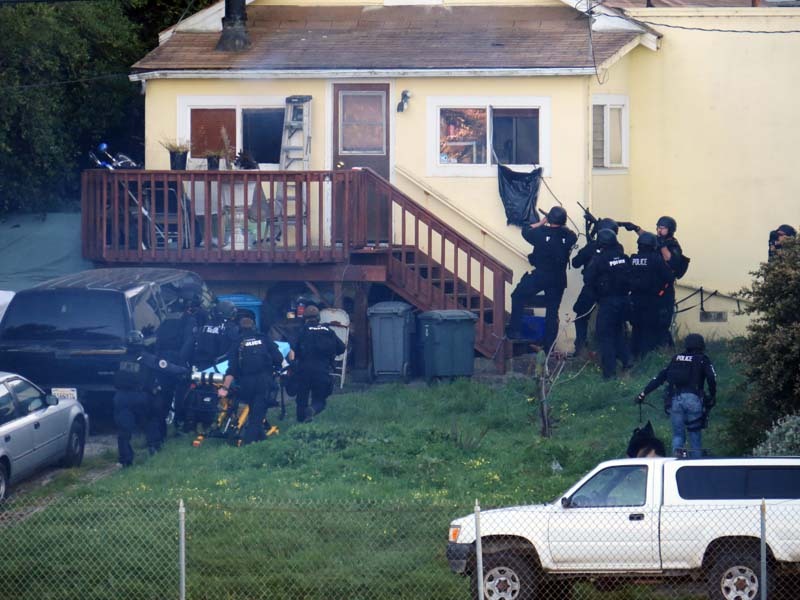 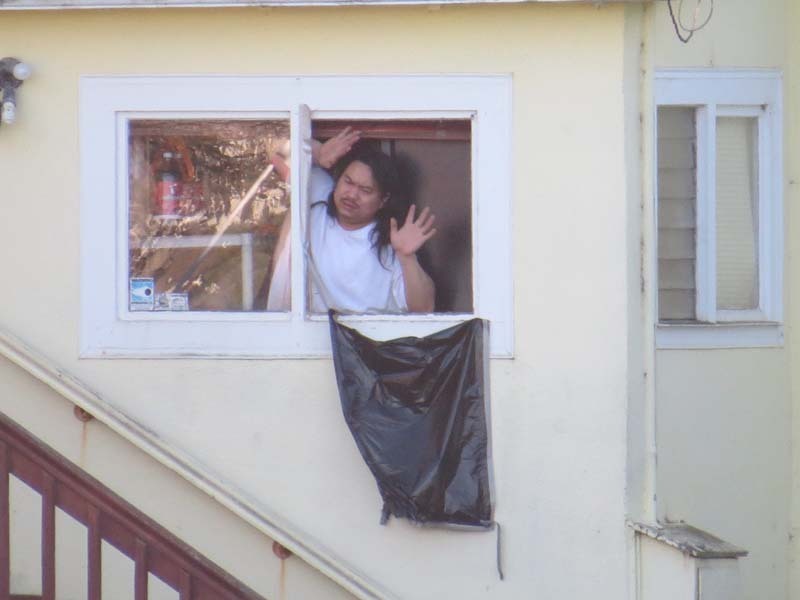 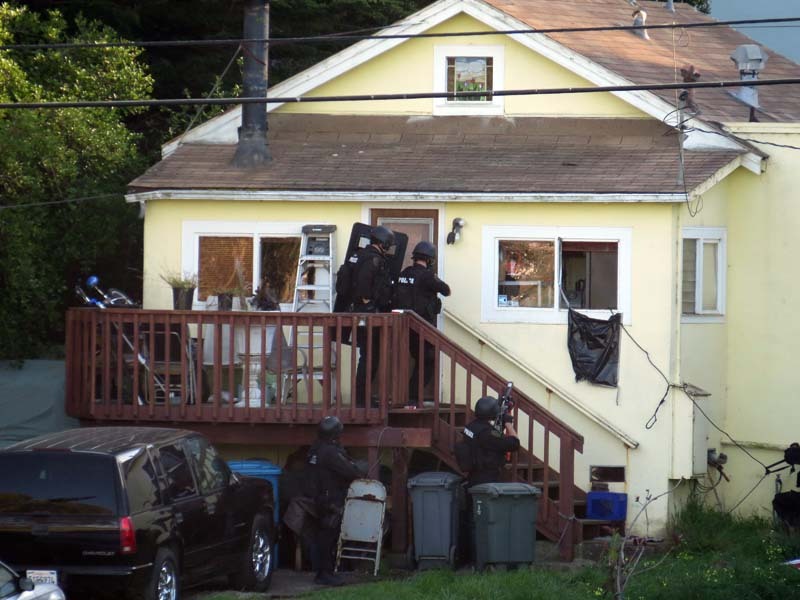 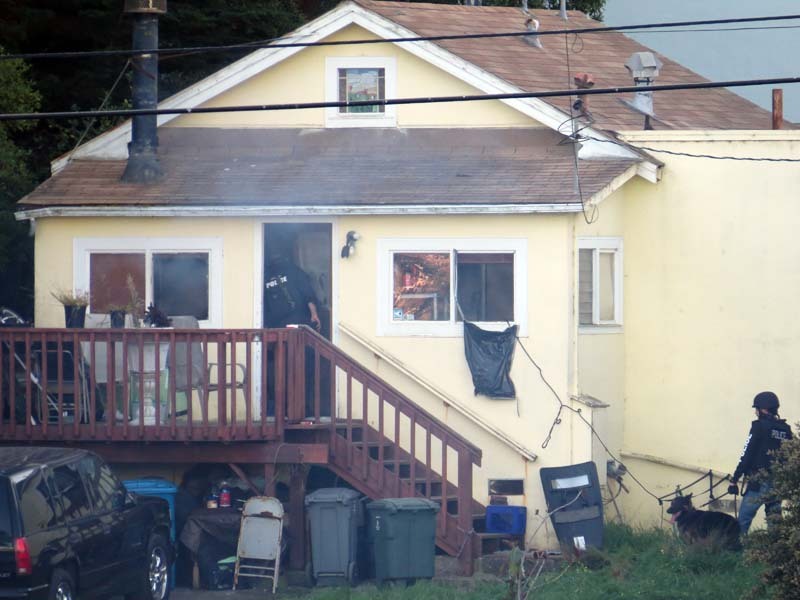 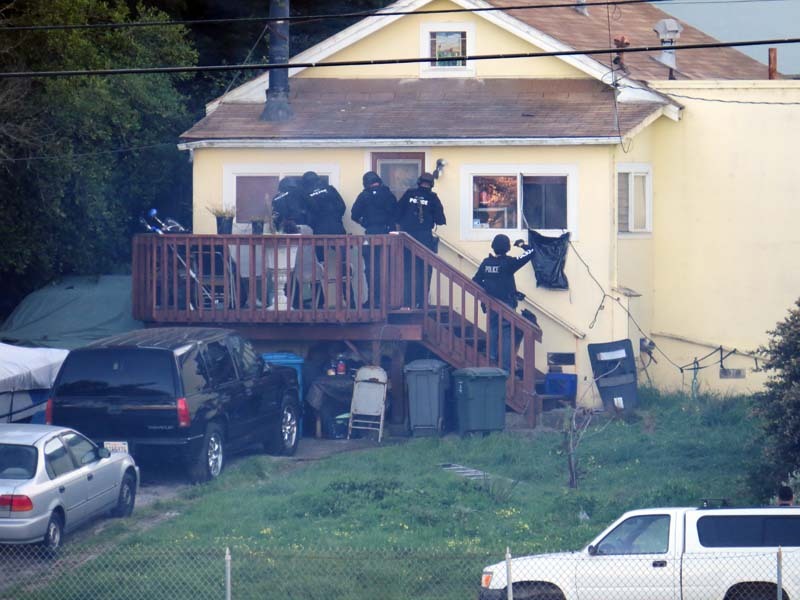 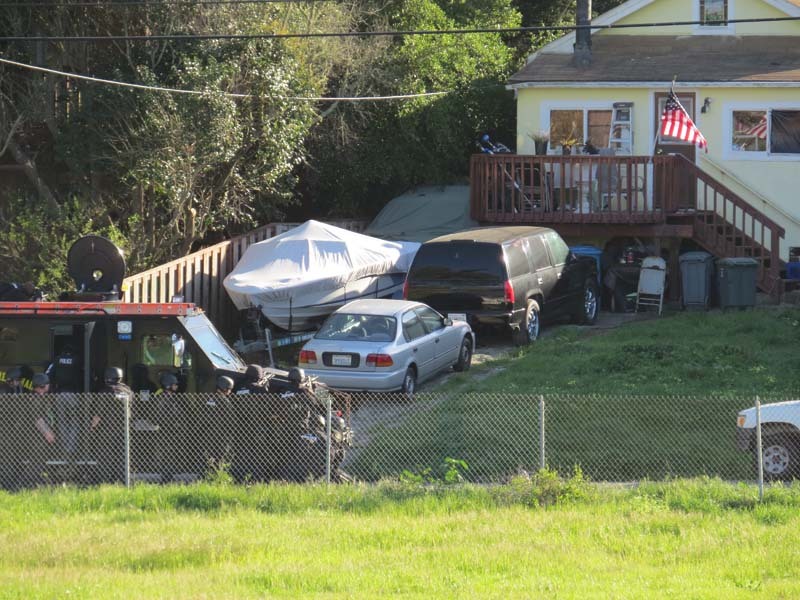 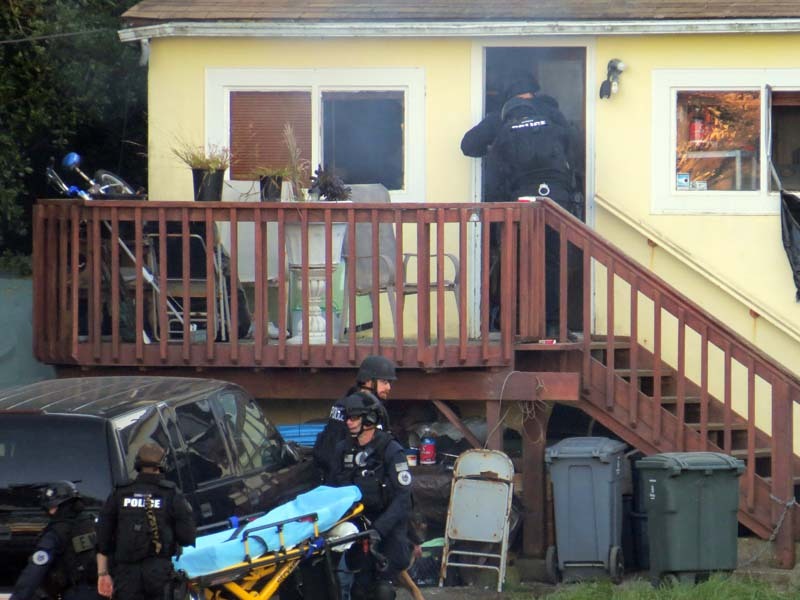 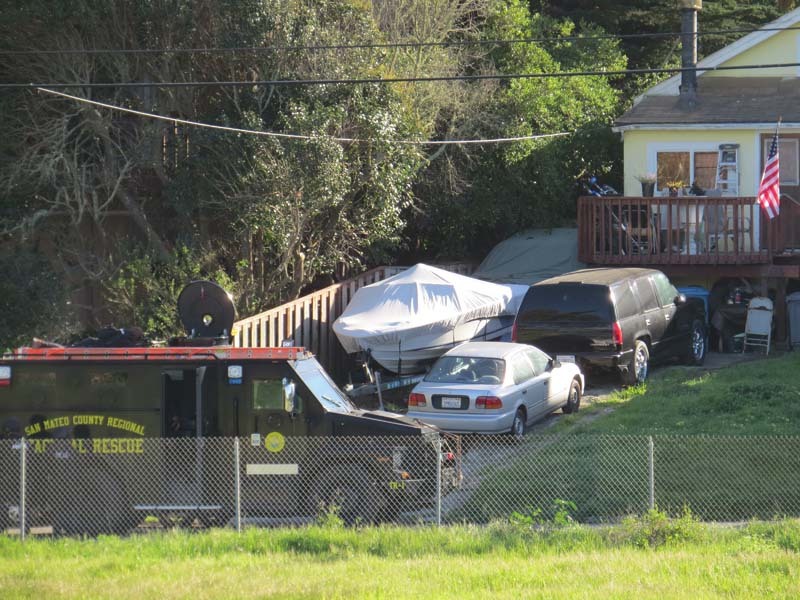 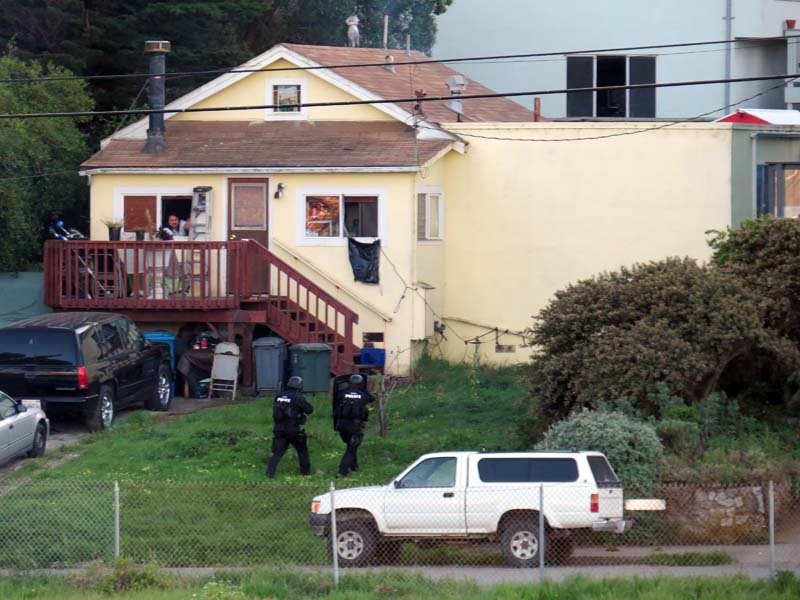 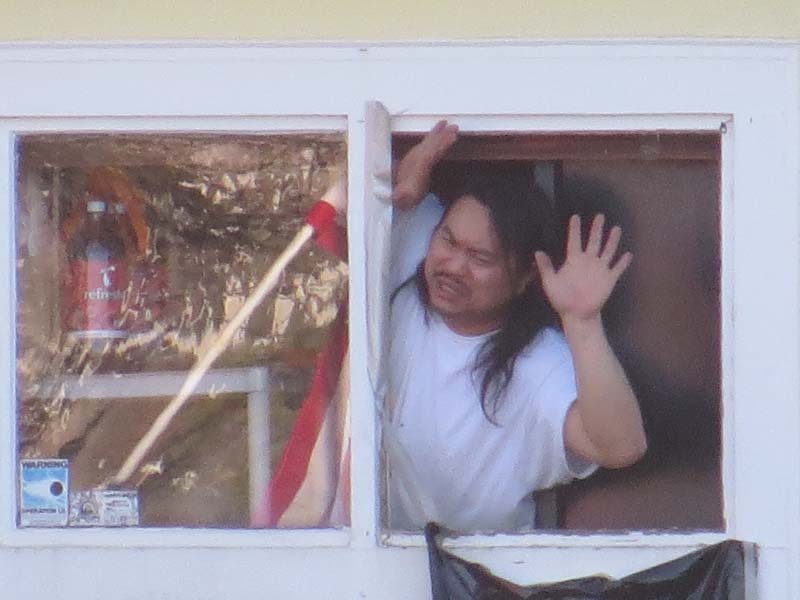 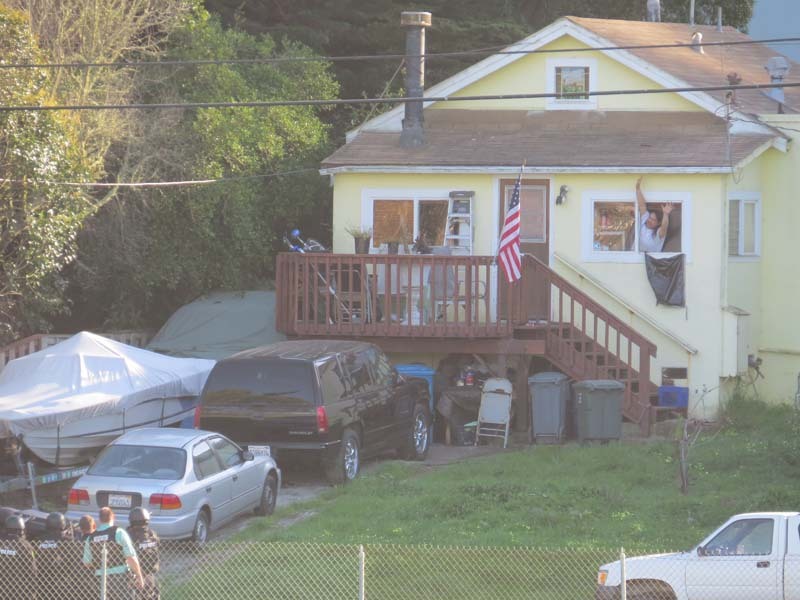 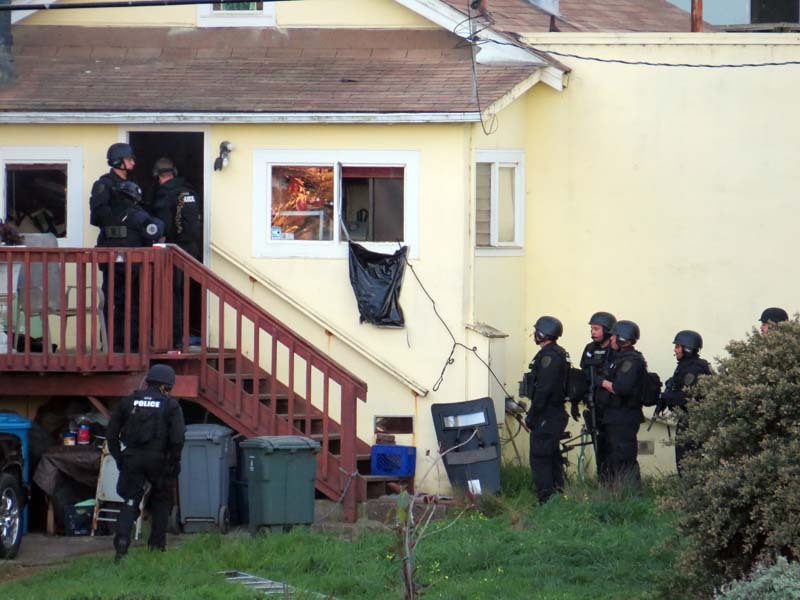 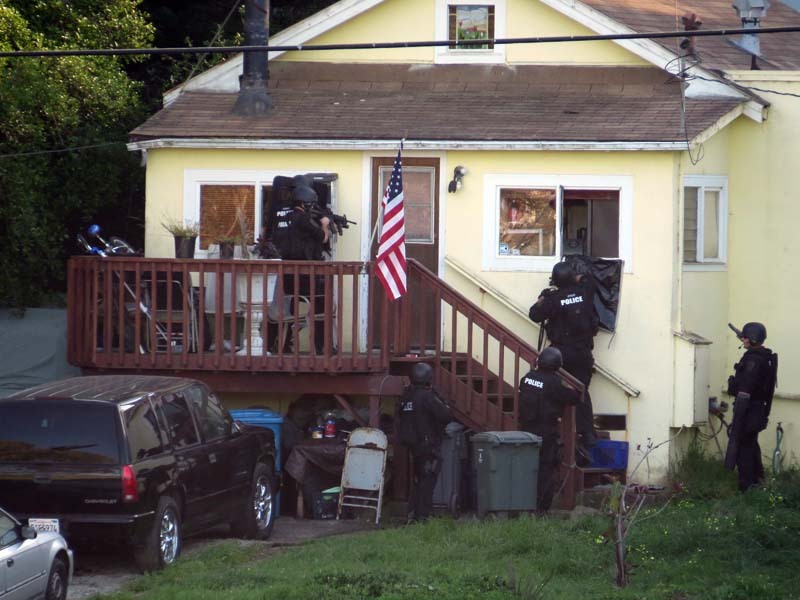 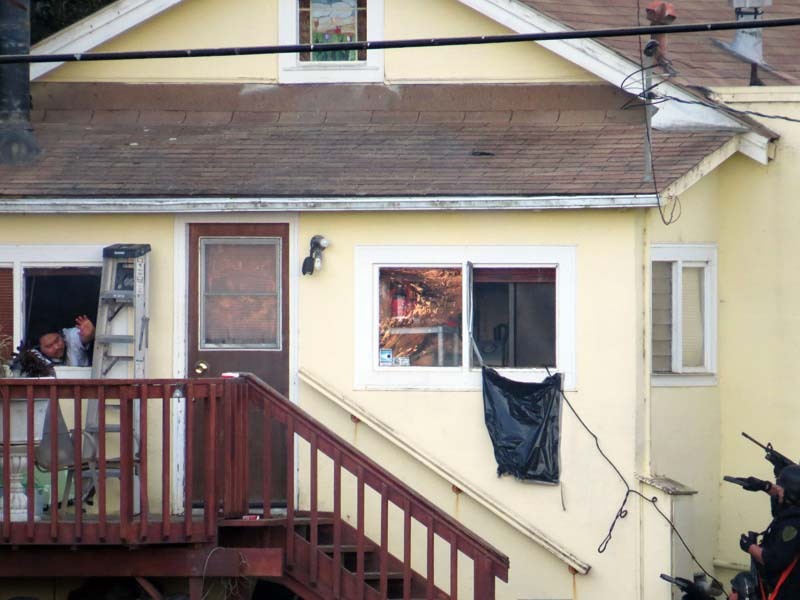 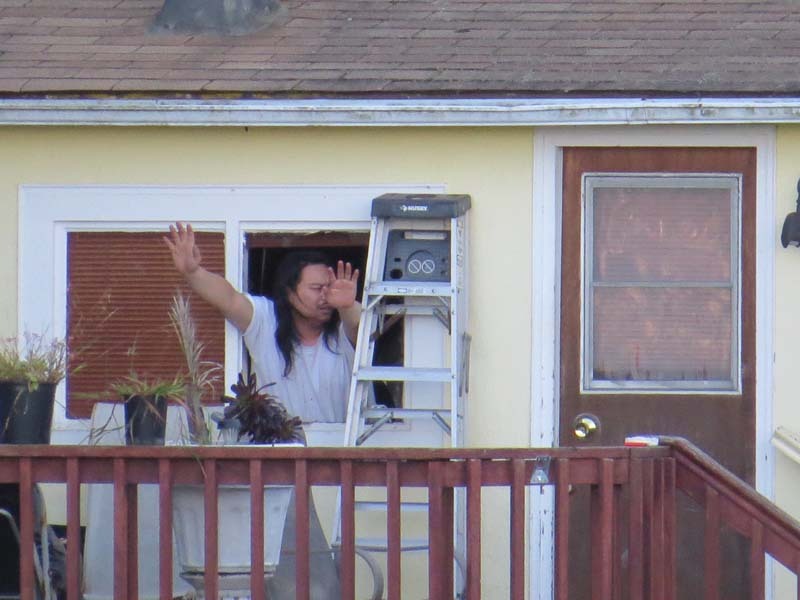 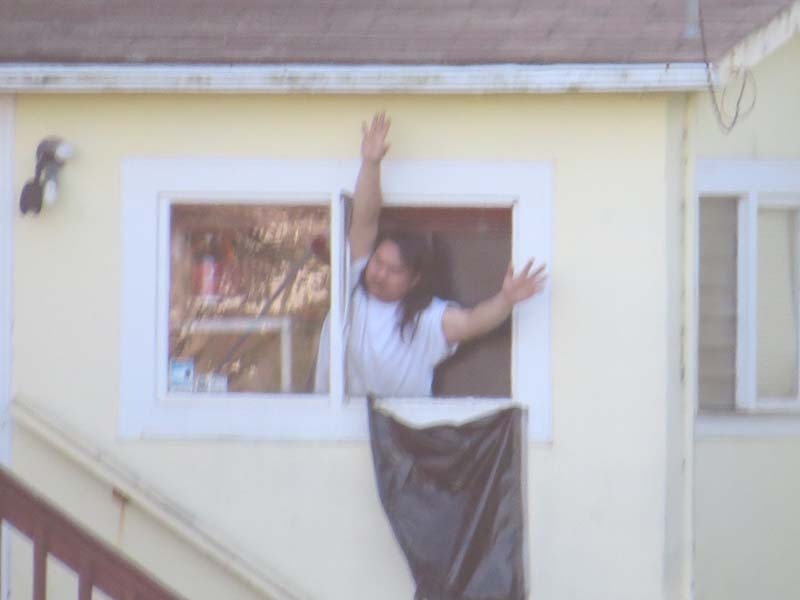 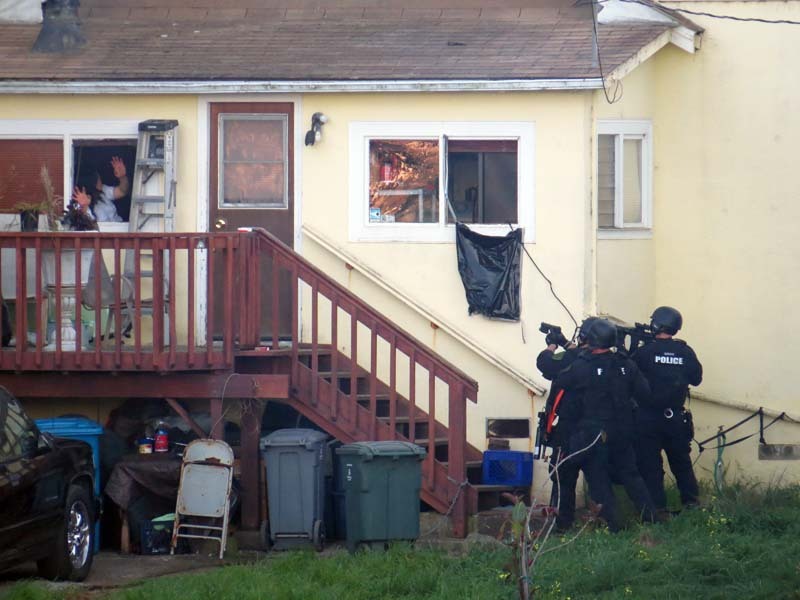 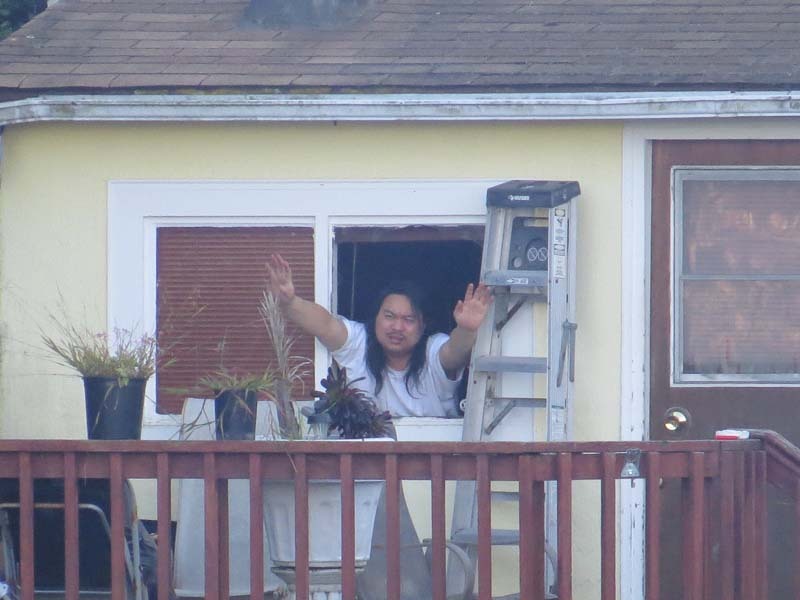 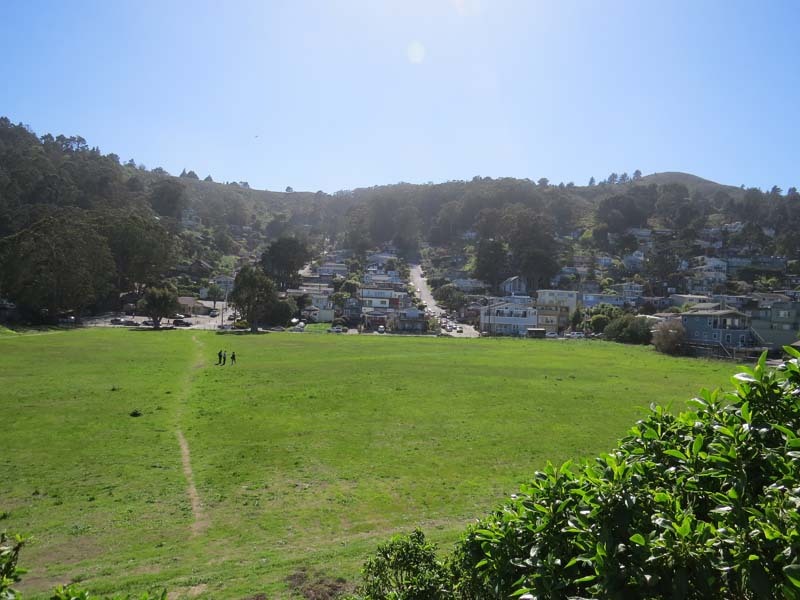 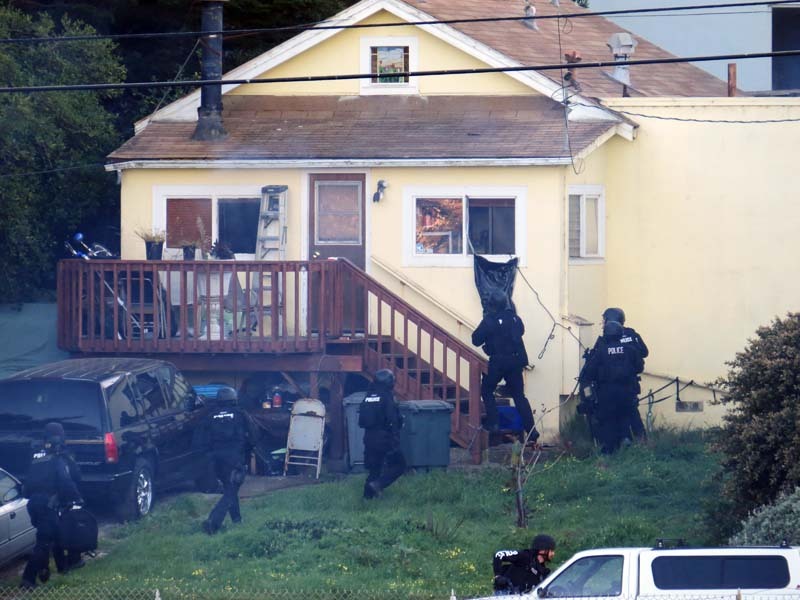 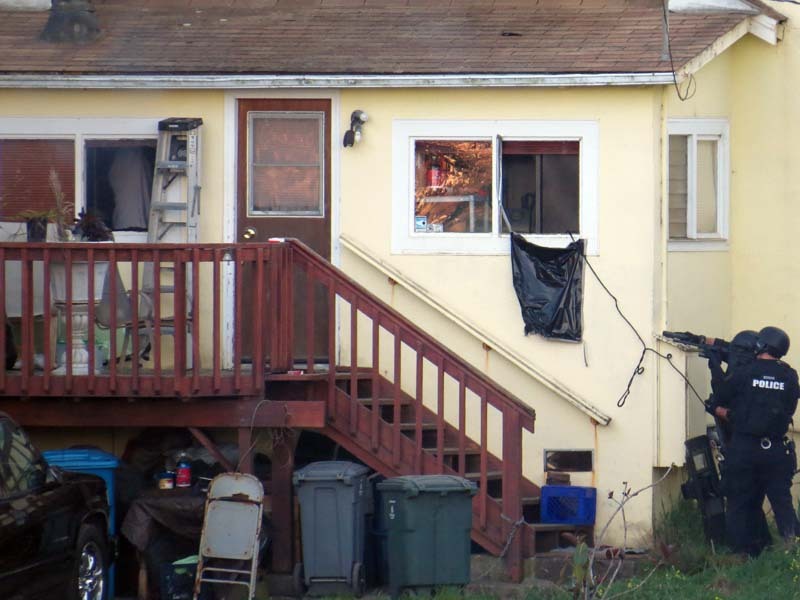 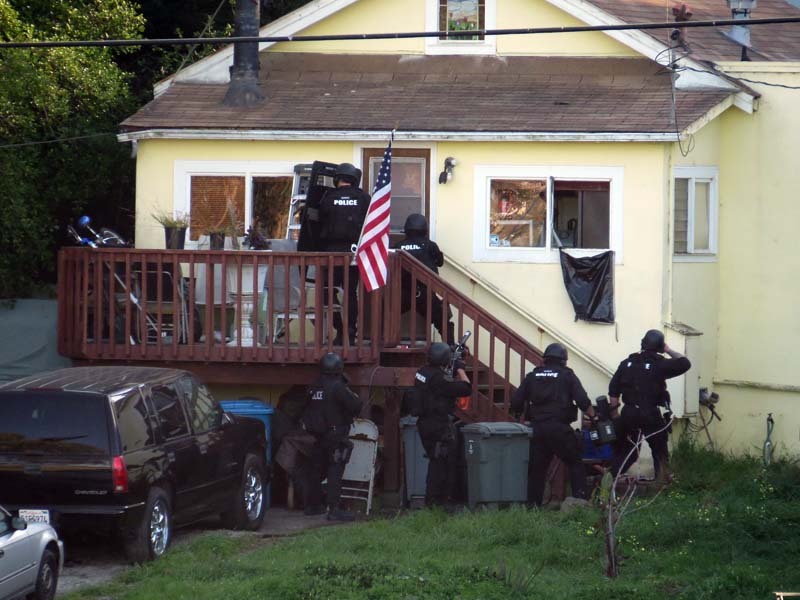 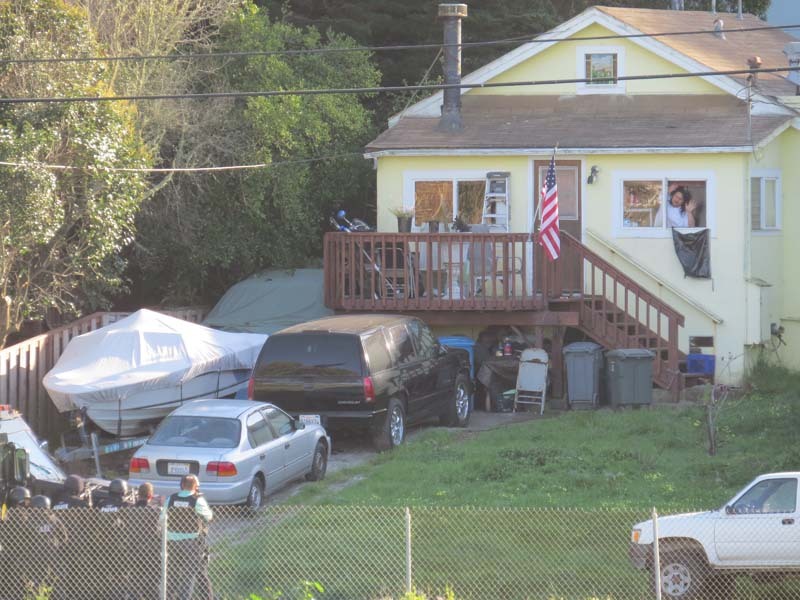 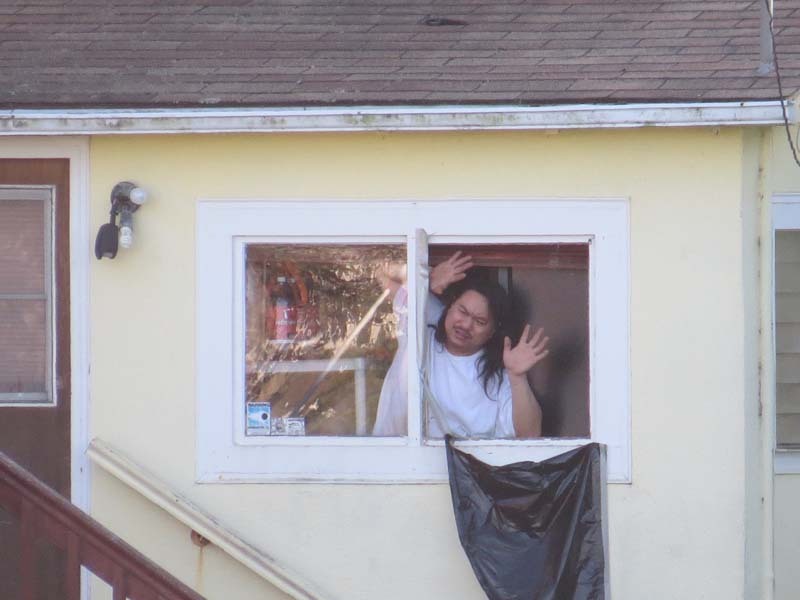 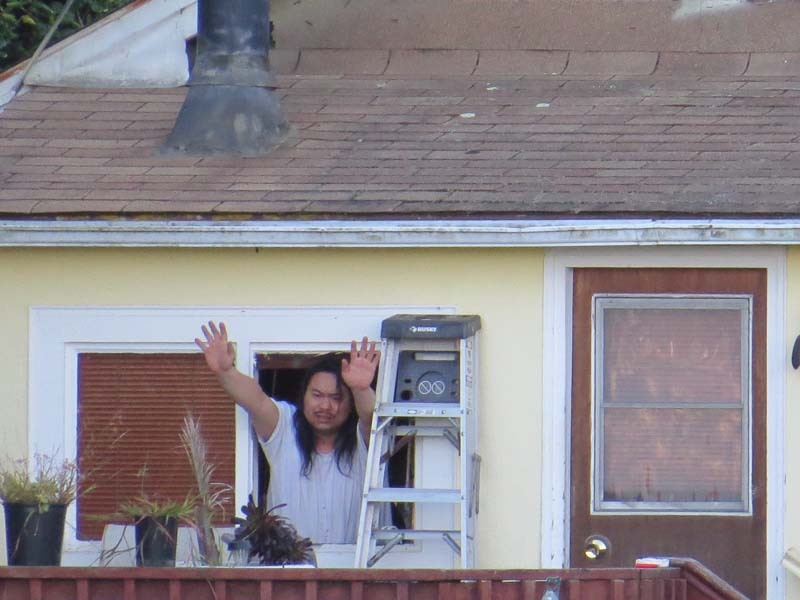 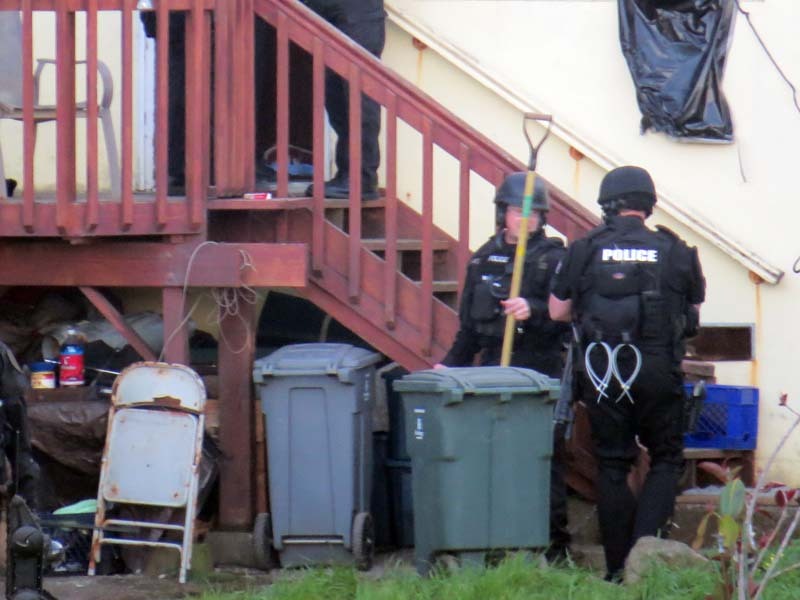 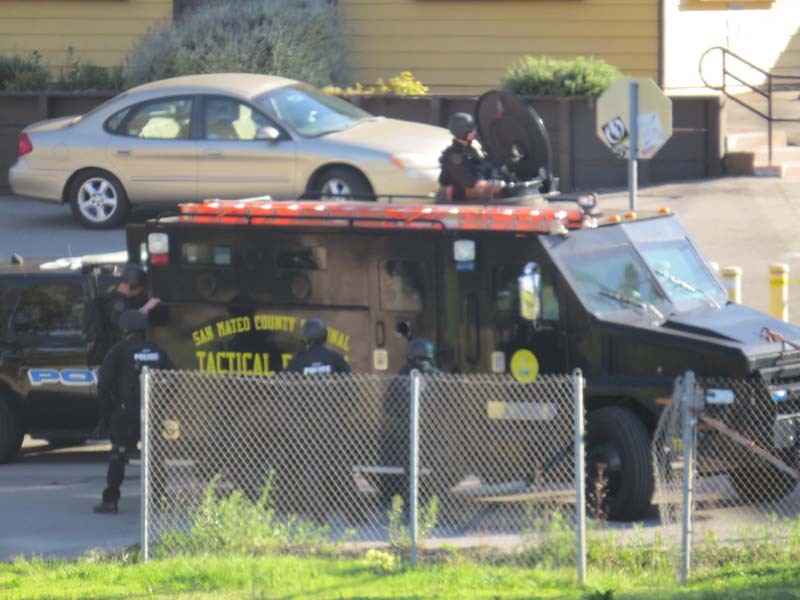 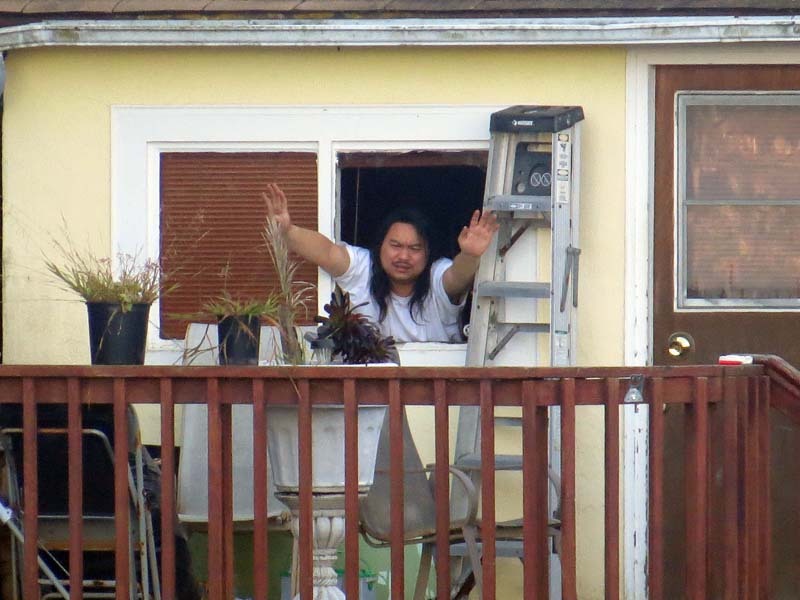 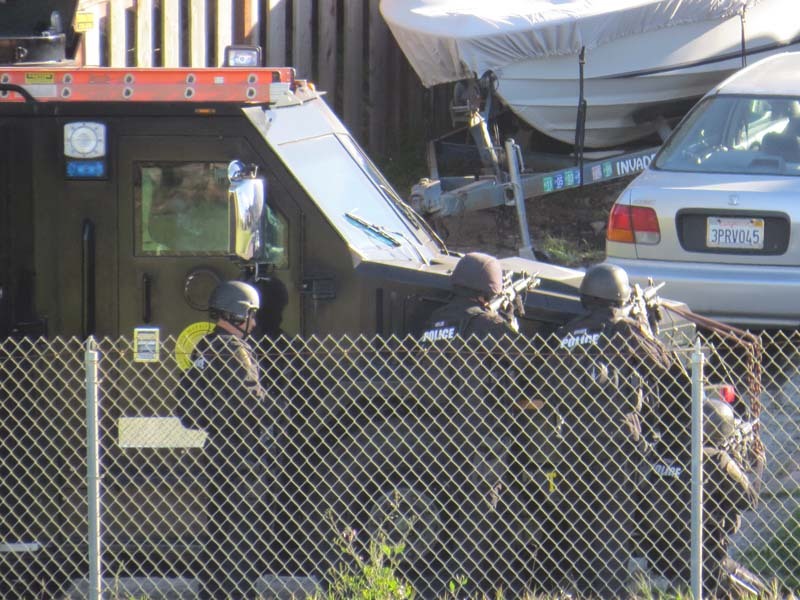 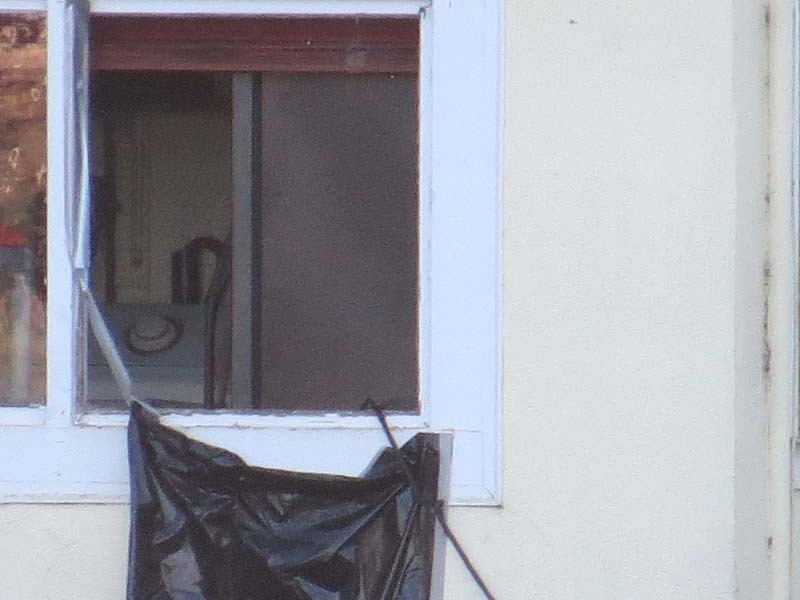 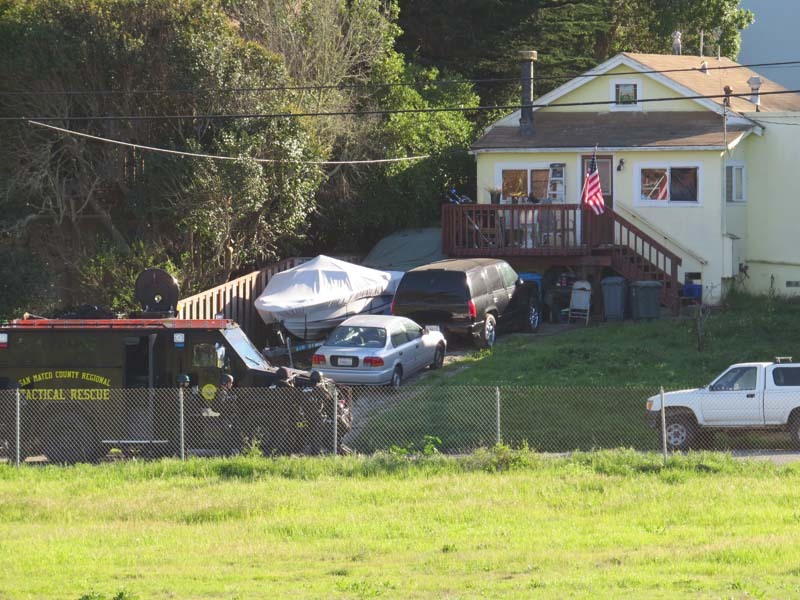 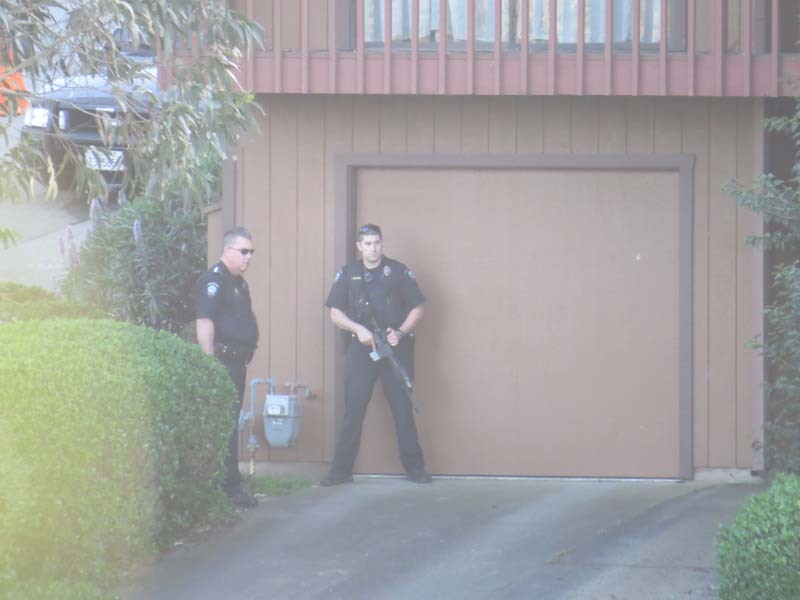 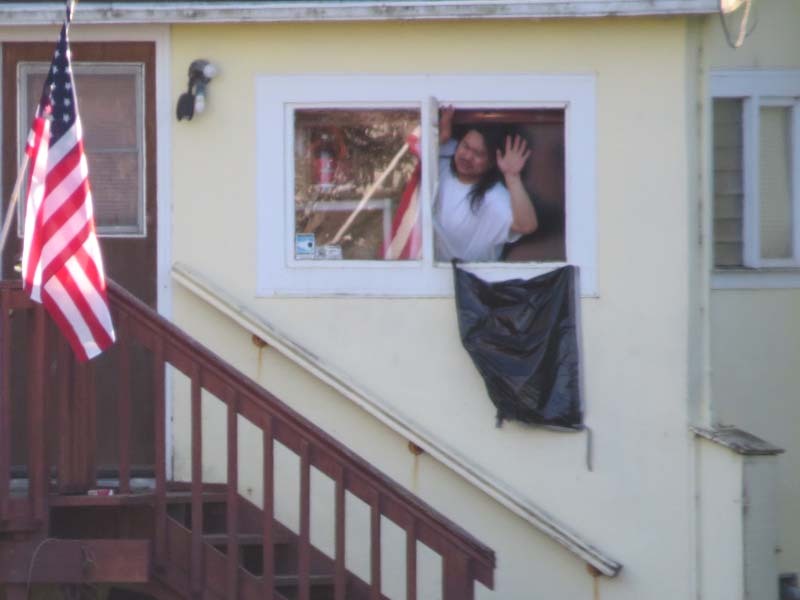 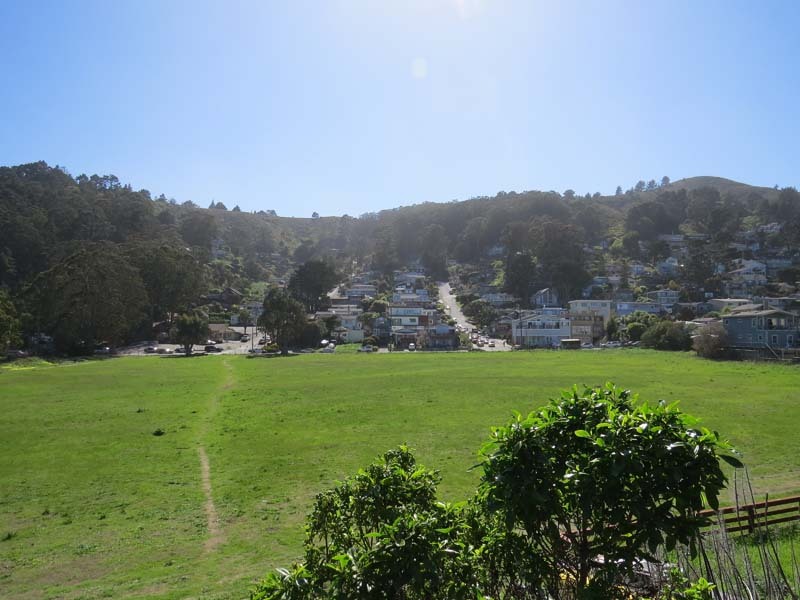 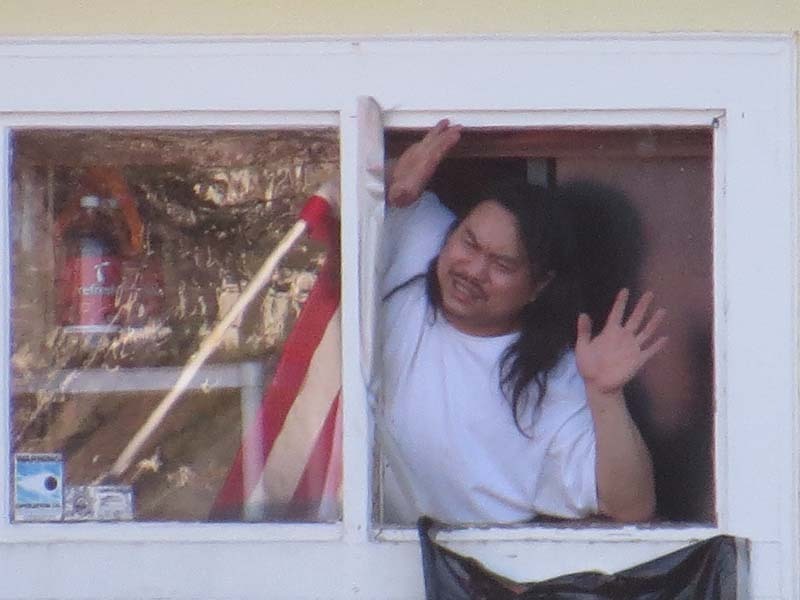 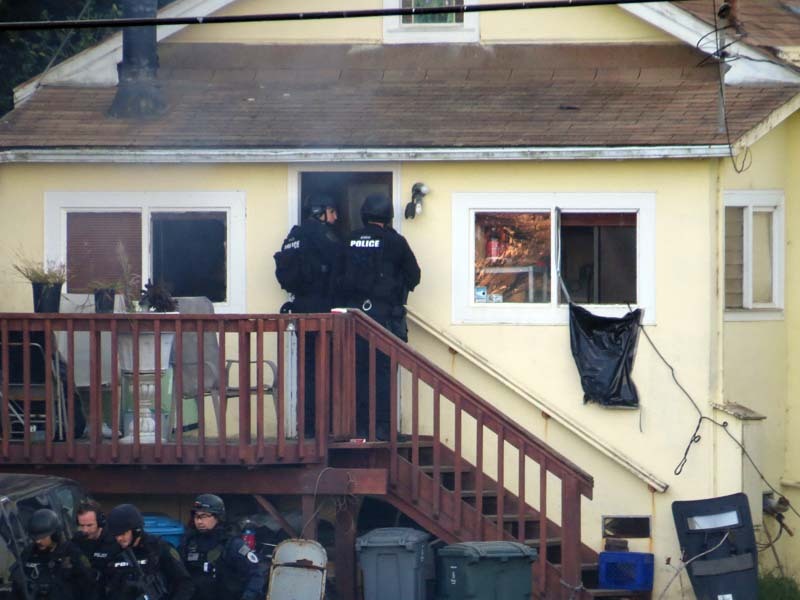 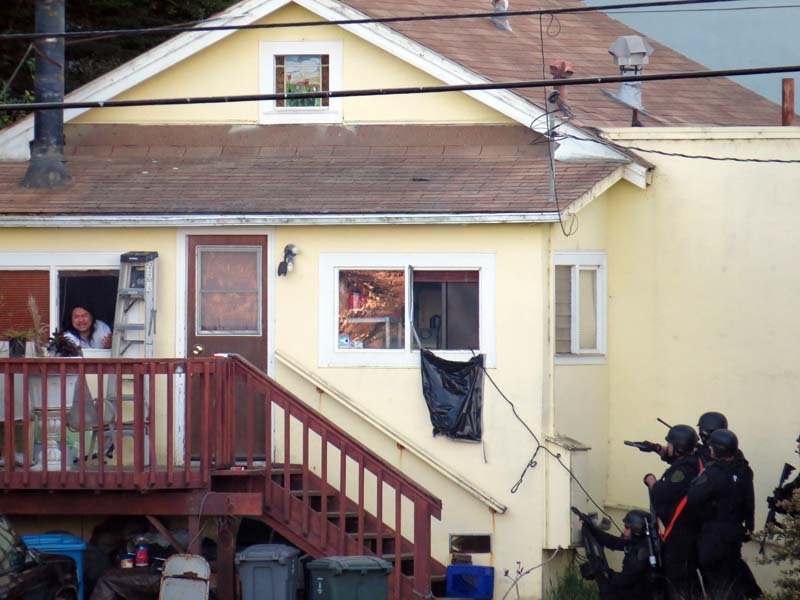 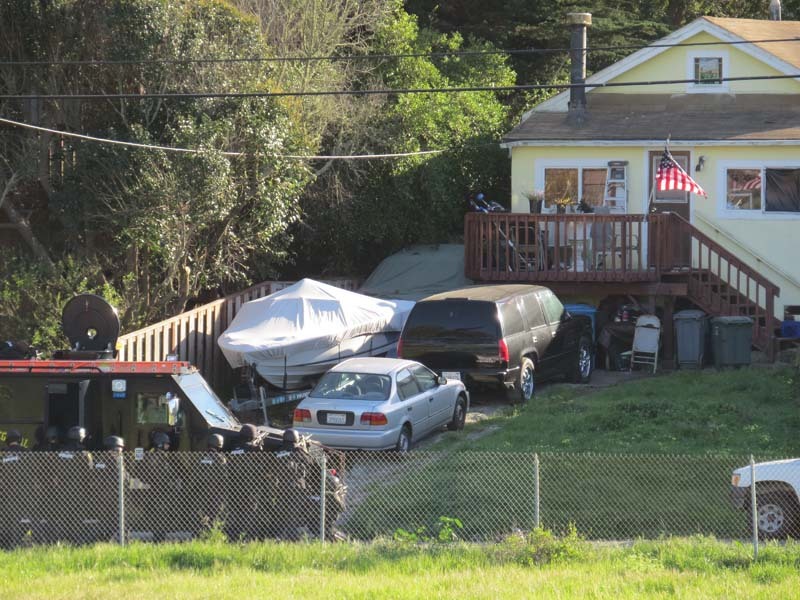 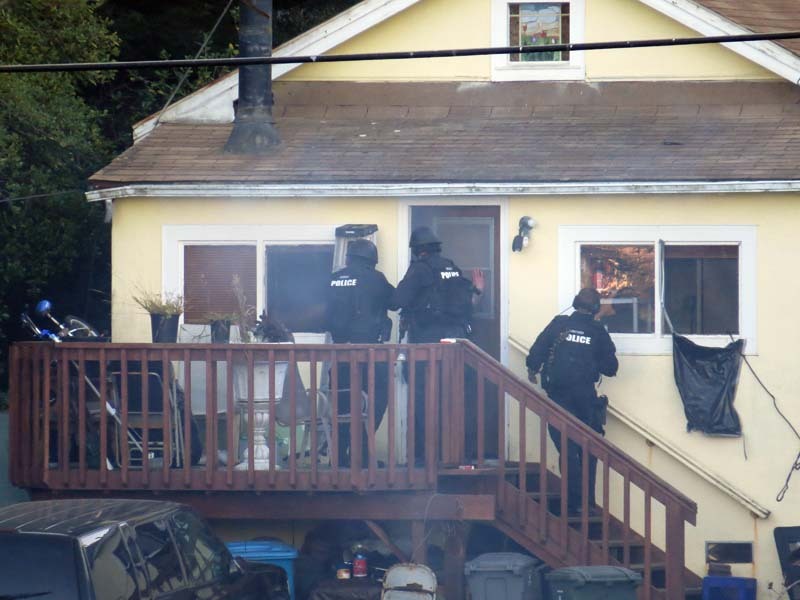 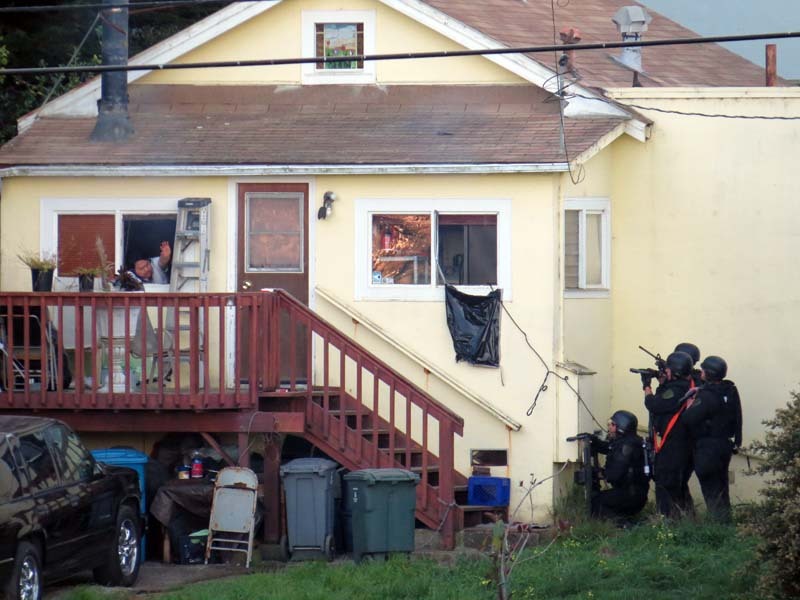 On March 18, 2014 there was a police standoff for more than 6 hours in Pacifica at the 300 block of San Pedro Avenue (on Pedro Point) in Pacifica, California. 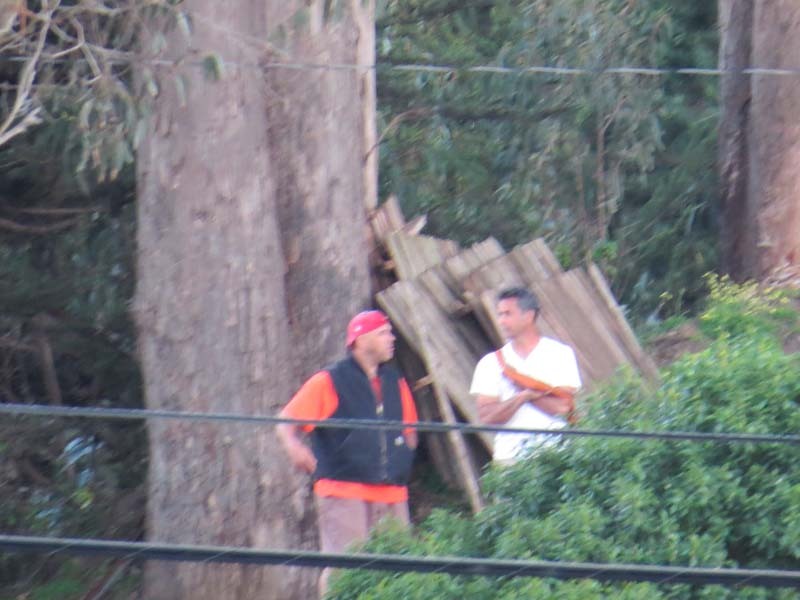 These pictures were taken with the people taking pictures handing the camera around and standing on my property. 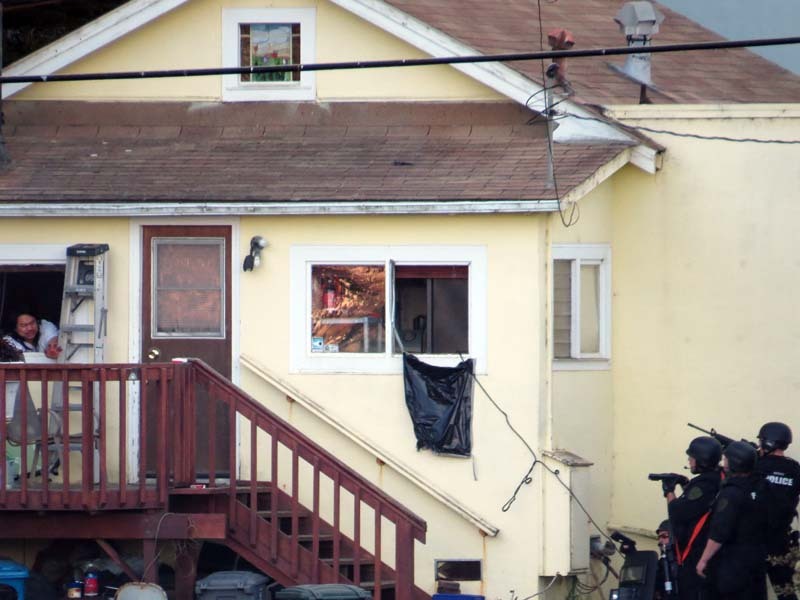 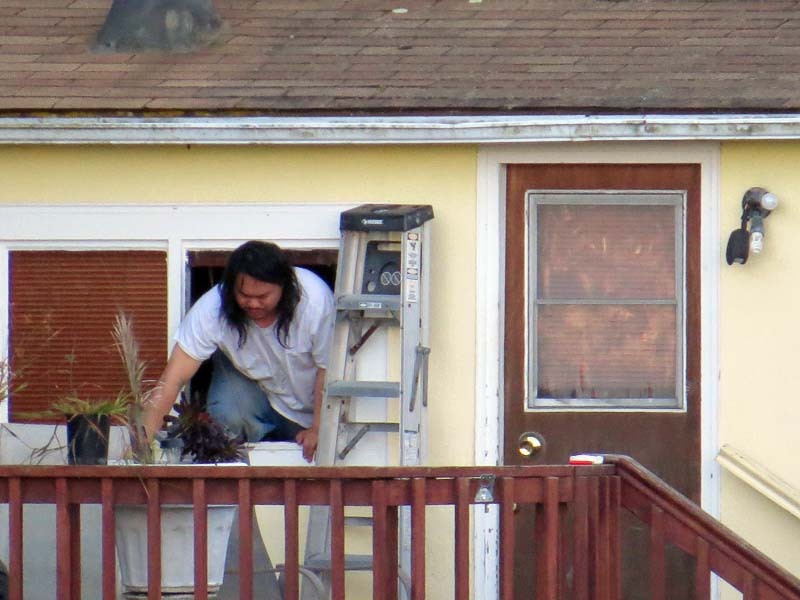 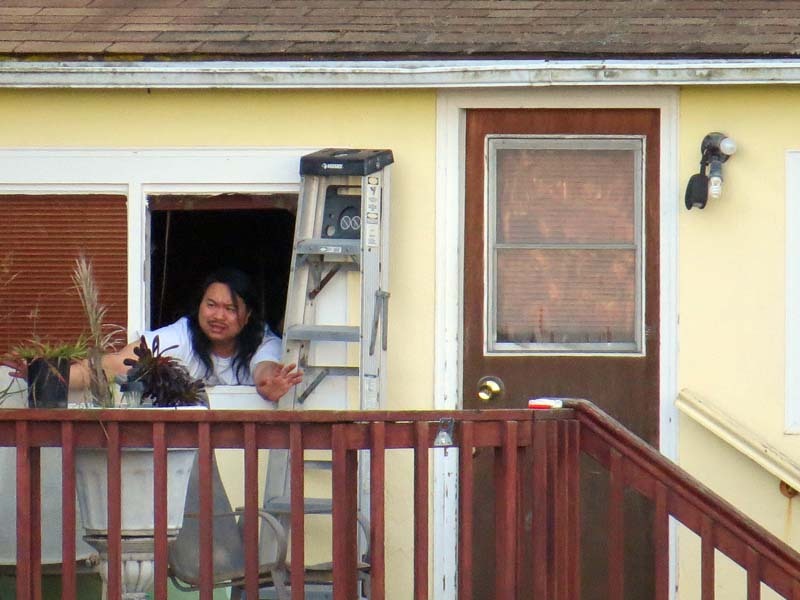 The man barricaded inside had the name of Errol, and his family and police were in front of his house by 12:20pm at least, and it all ended around 7pm when they shot and killed Errol. 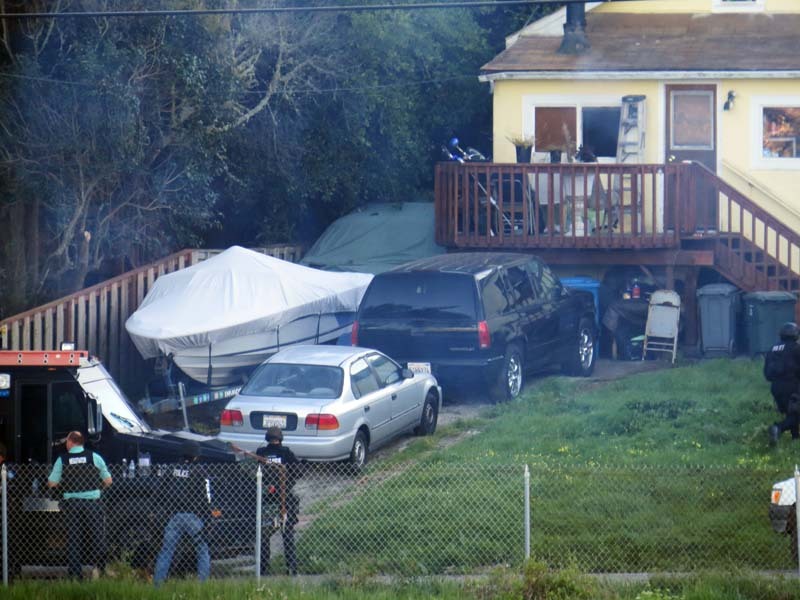 Click Here for a new story about it (sfgate.com). 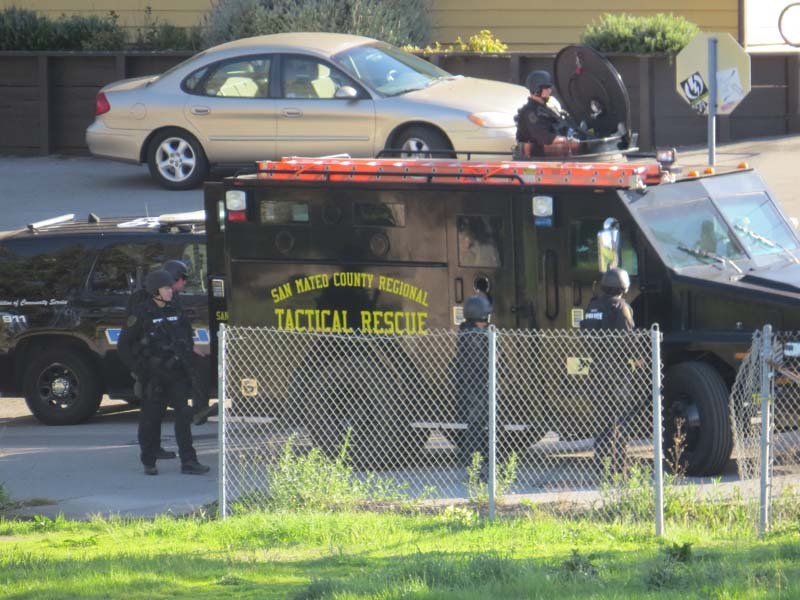 Click here for yet another news story (San Mateo County Times). 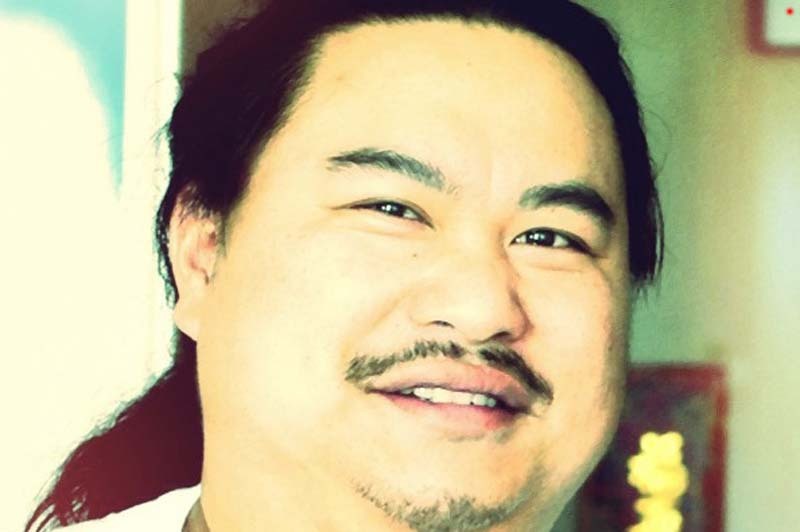 Click here for an interview with Errol's brother (San Jose Mercury News). 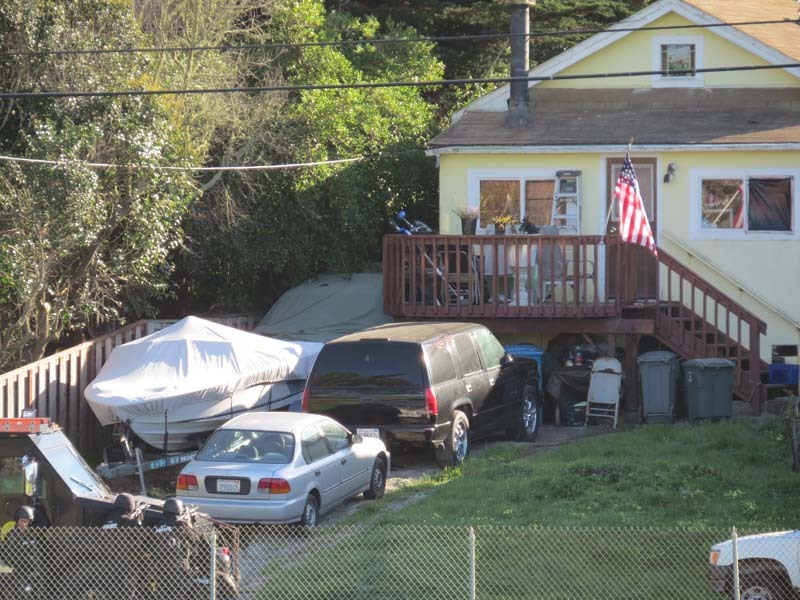 Update on 6/2/2014 - This PDF Report on Errol released by the San Mateo District Attorney's office saying "Officers Acted Lawfully" (the report contains very detailed accounts of what occurred that day according to the police). 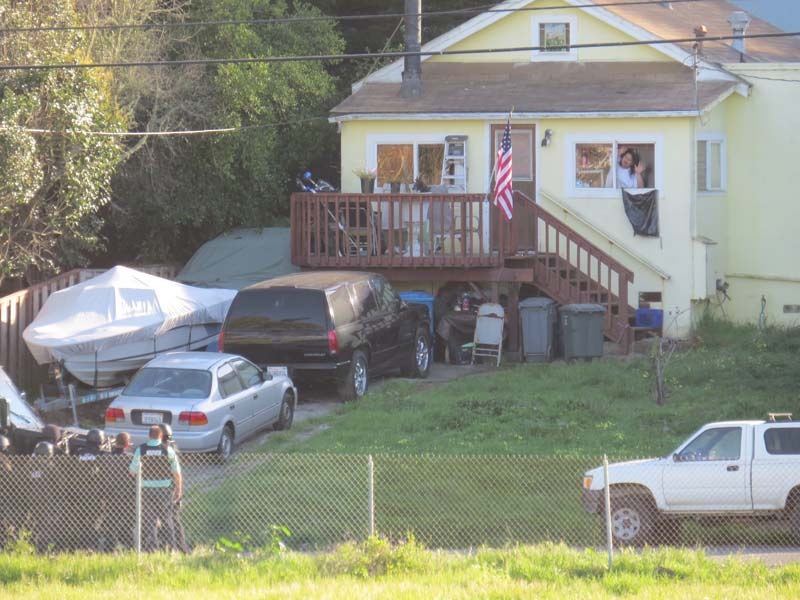 The final line in this report is "The conduct of the officers in this case can only be described as exemplary and the community was well served by their actions." 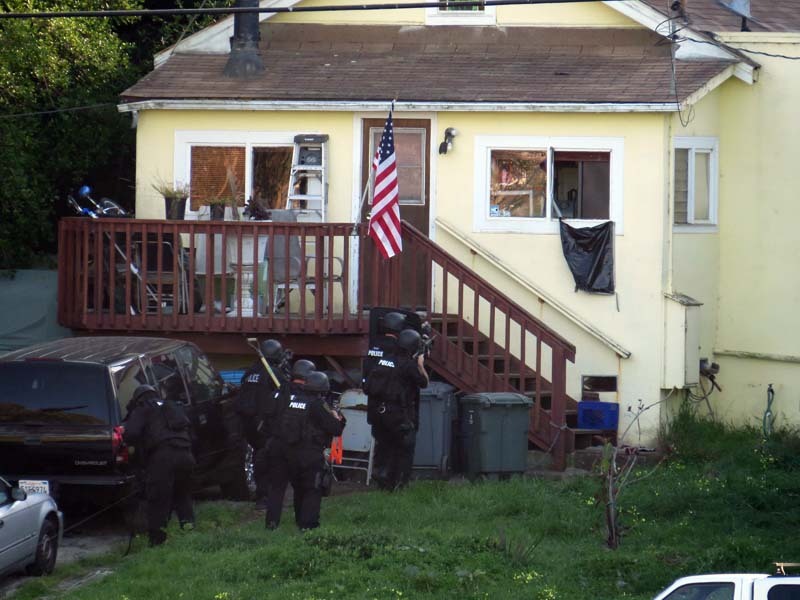 Yeah, I'm going to respectfully disagree with the District Attorney on that. 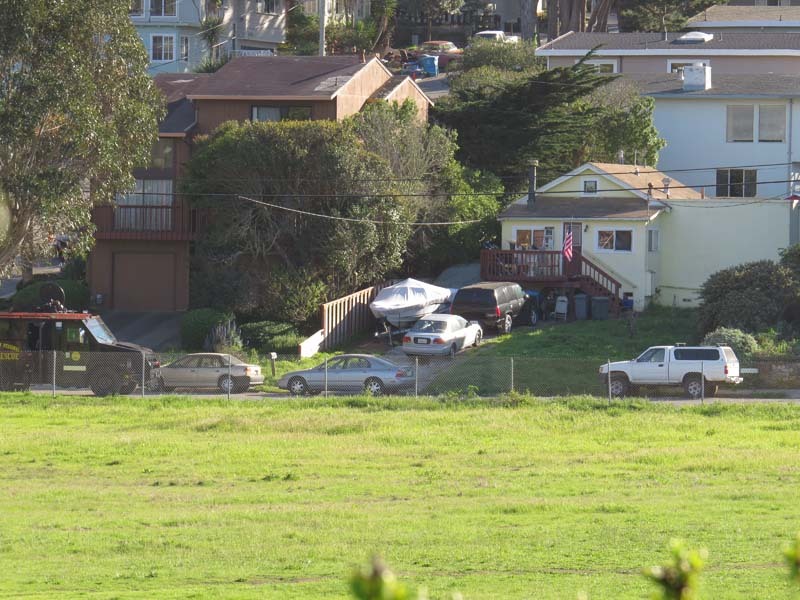 The pictures below here are all taken from my property by various people with the same camera we passed around. 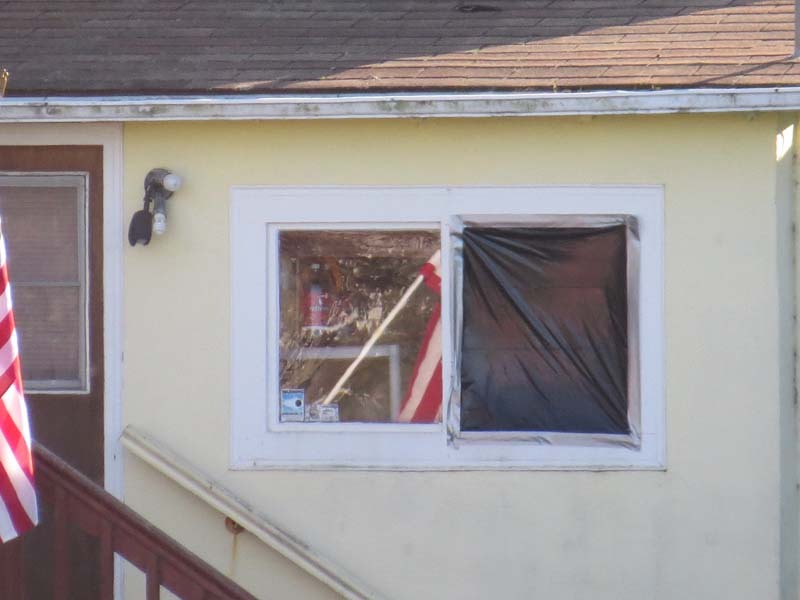 The first picture contains embedded timecode 3/18/2014 - time 2:57pm. 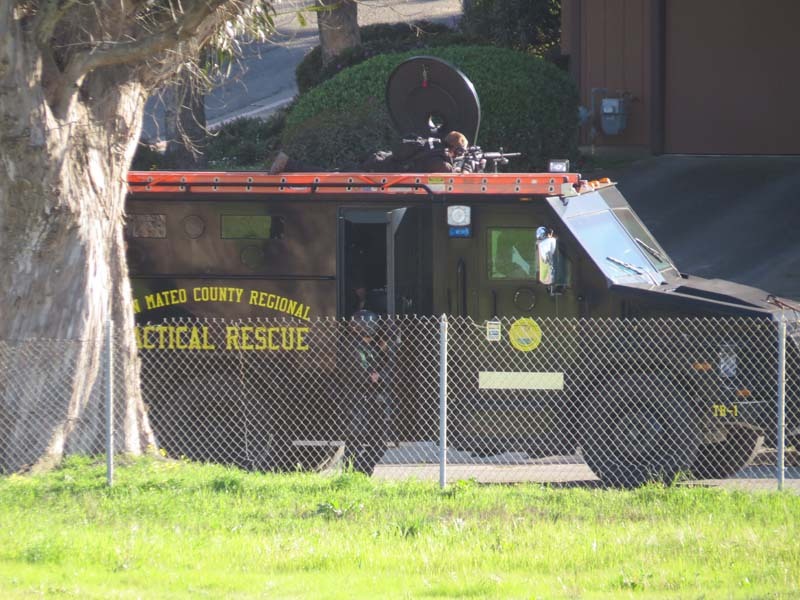 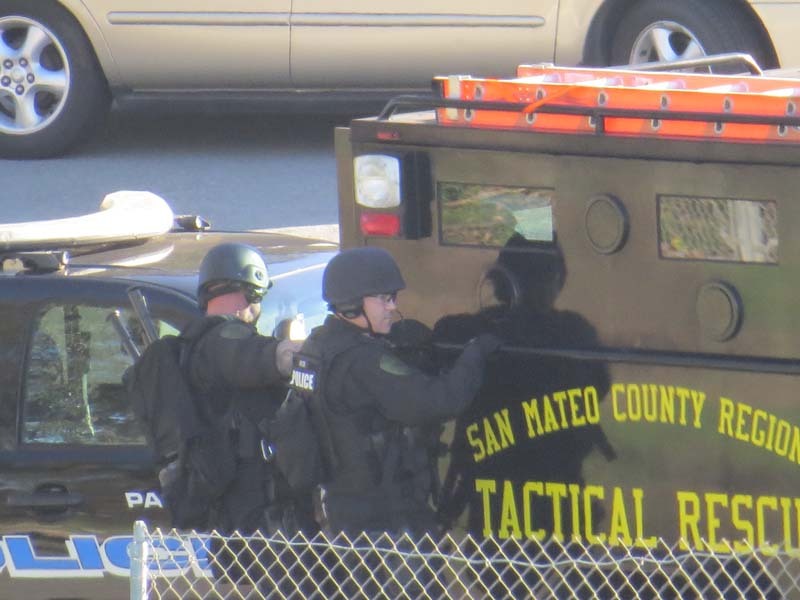 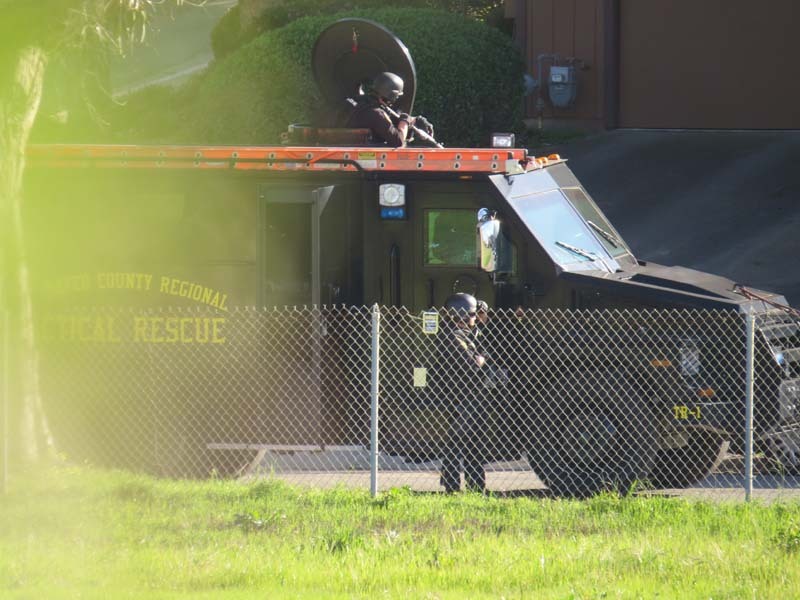 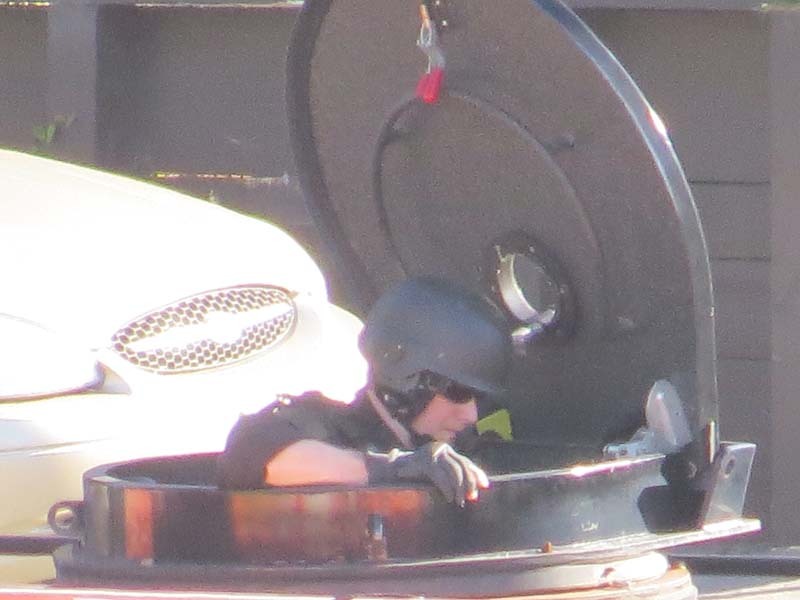 The picture below (San Mateo County Tactical) has embedded timecode 3/18/2014 at 5:05pm. 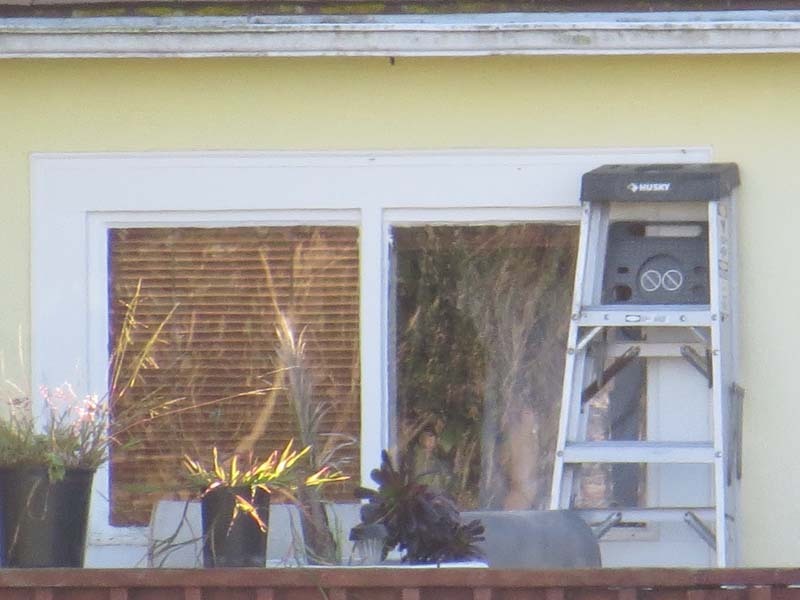 The picture below has embedded timecode 3/18/2014 at 5:07pm. 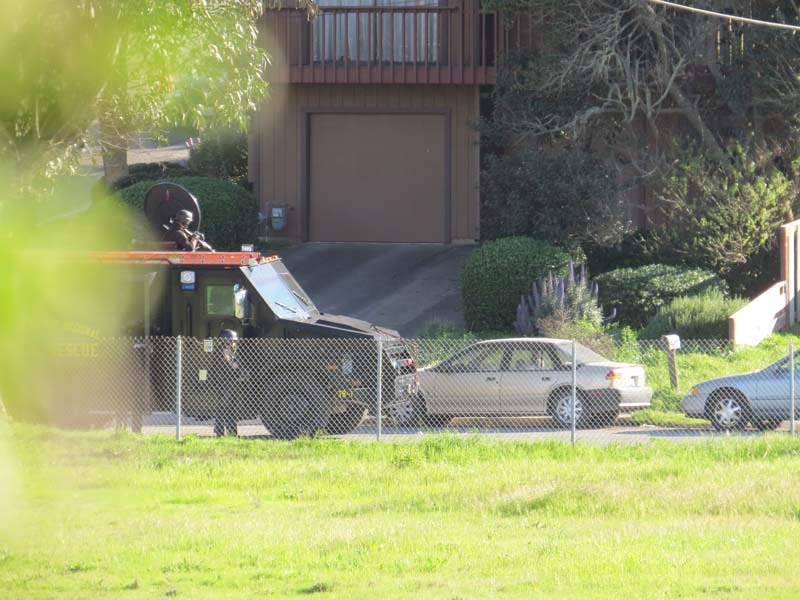 The picture below has embedded timecode 3/18/2014 at 5:20pm. 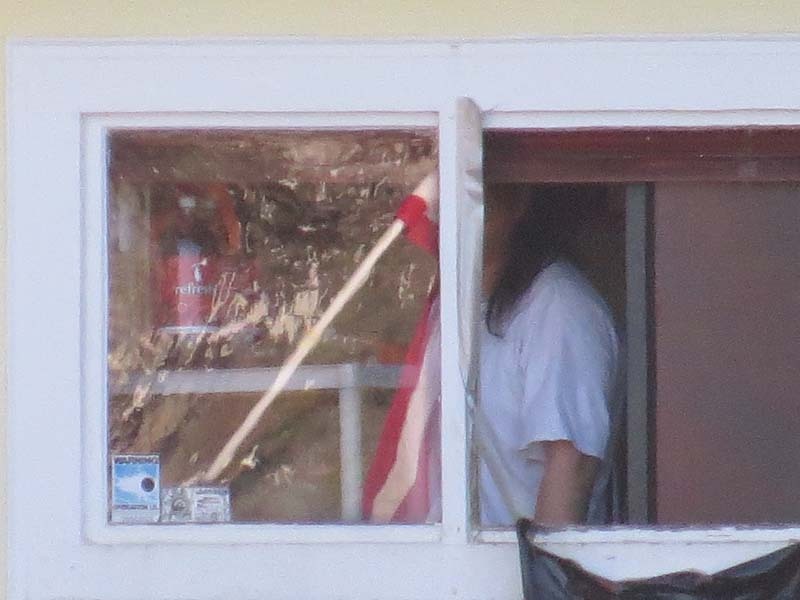 The picture below has embedded timecode 3/18/2014 at 5:29pm. 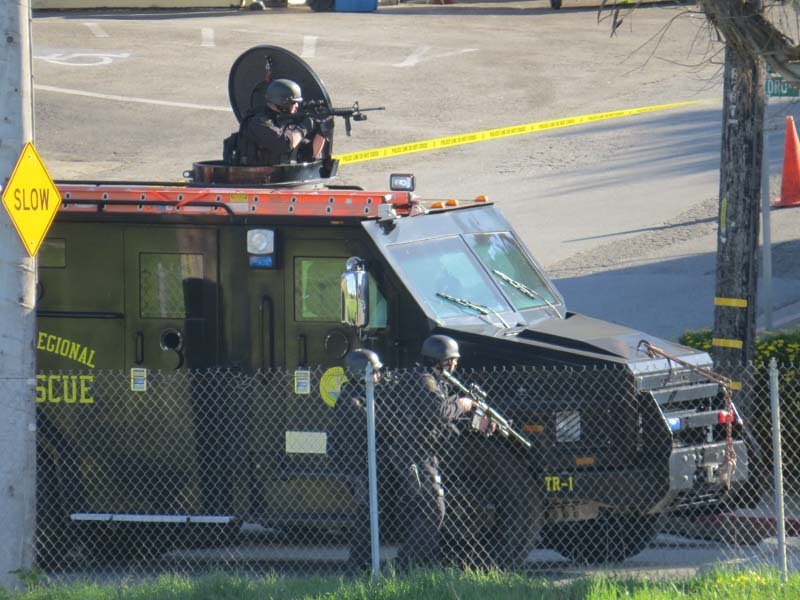 The picture below has embedded timecode 3/18/2014 at 6:17pm. 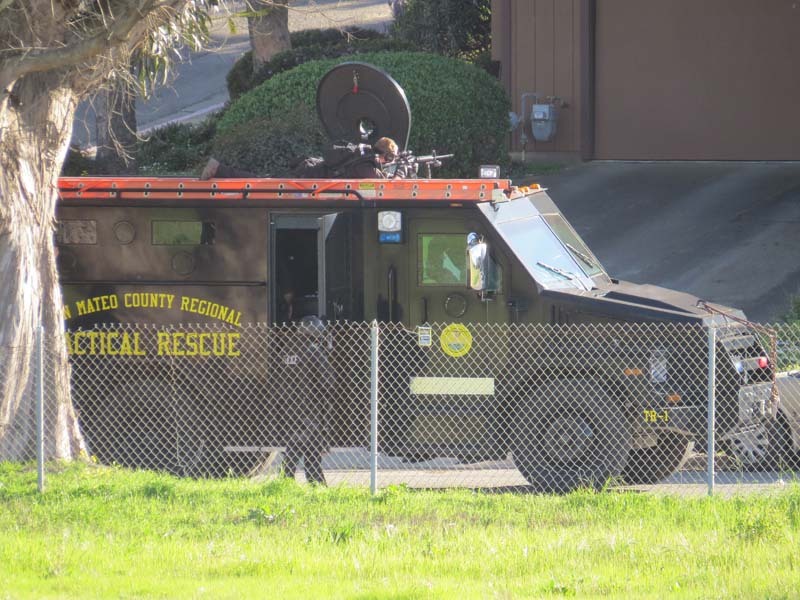 The picture below has embedded timecode 3/18/2014 at 6:18pm. 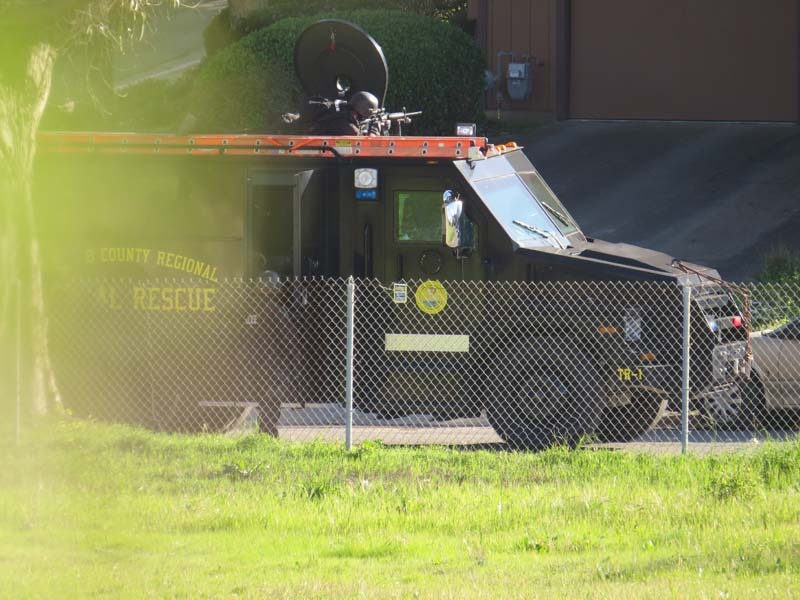 The picture below has embedded timecode 3/18/2014 at 6:20pm. 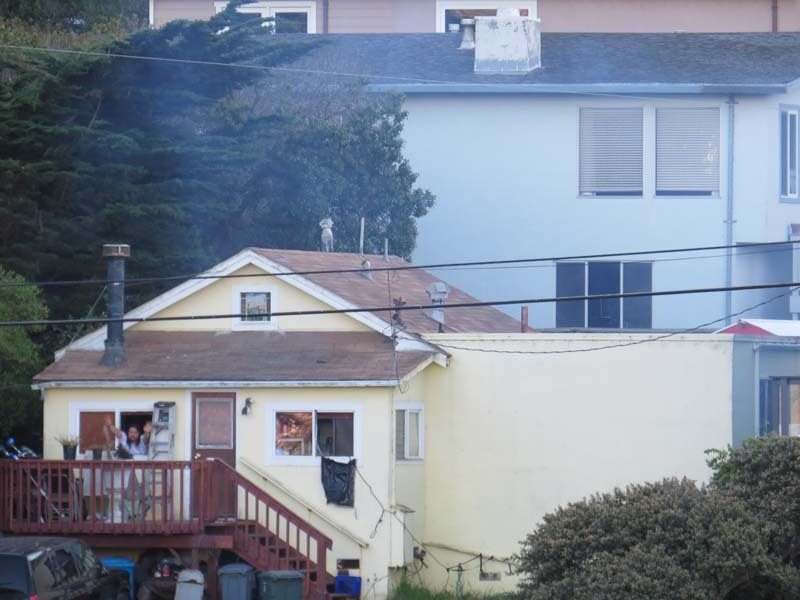 The picture below has embedded timecode 3/18/2014 at 6:24pm. 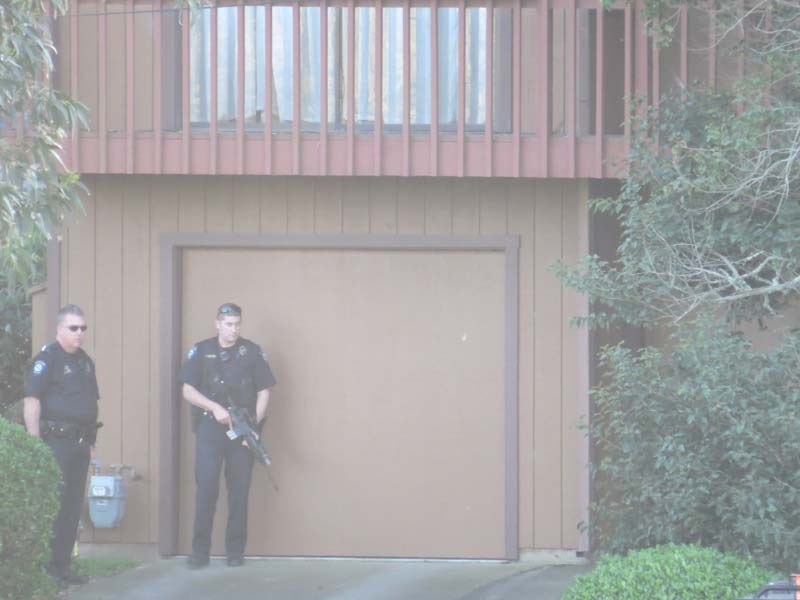 The picture below has embedded timecode 3/18/2014 at 6:25pm. 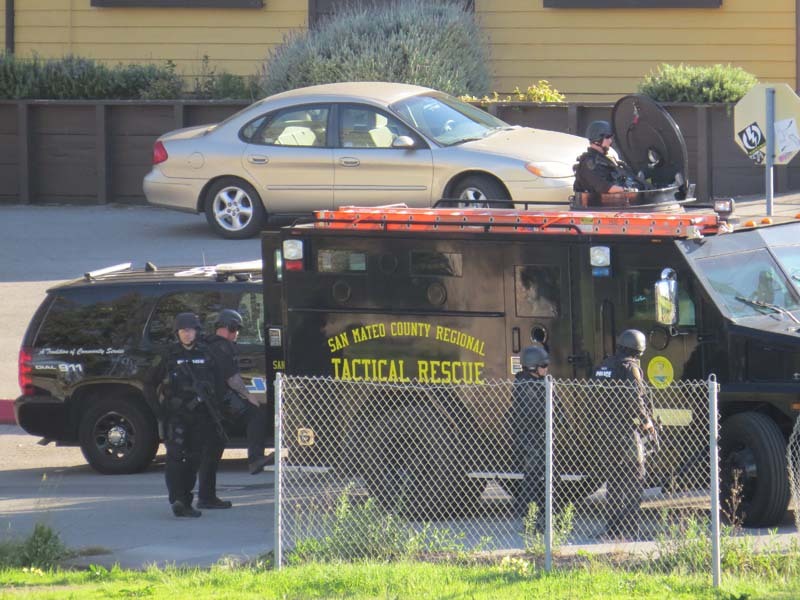 The picture below has embedded timecode 3/18/2014 at 6:27pm. 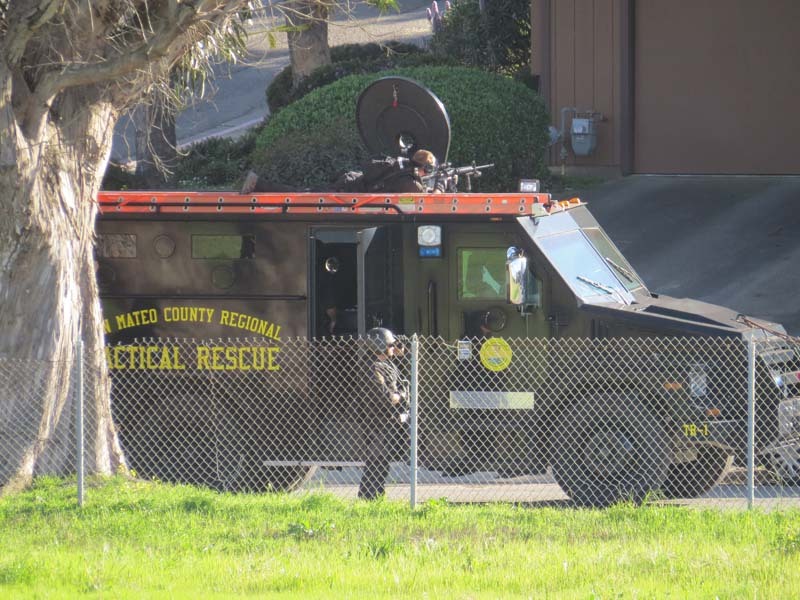 The picture below has embedded timecode 3/18/2014 at 6:28pm. 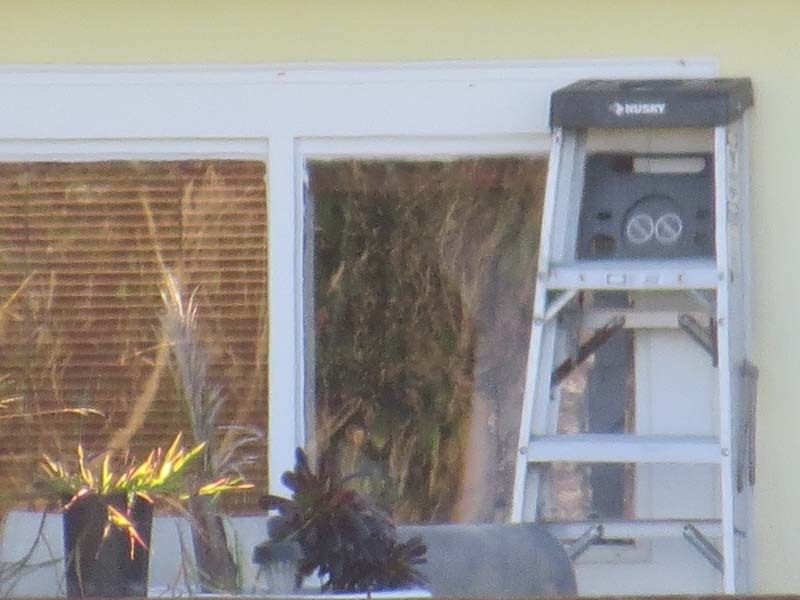 The picture below has embedded timecode 3/18/2014 at 6:29pm. 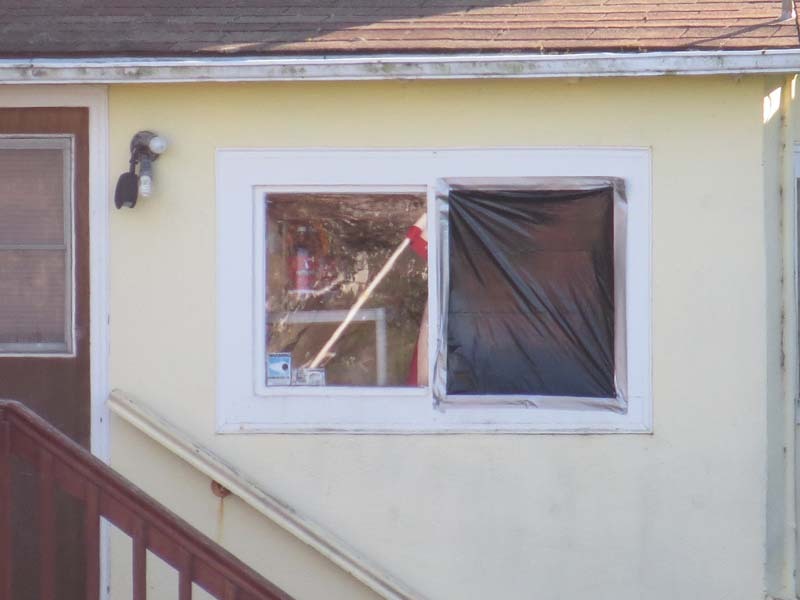 The picture below has embedded timecode 3/18/2014 at 6:30pm - I believe somewhere in the 6:28pm - 6:30pm Errol was shot, but all that was inside the house so nobody knows for sure what occurred (other than Errol did not survive). 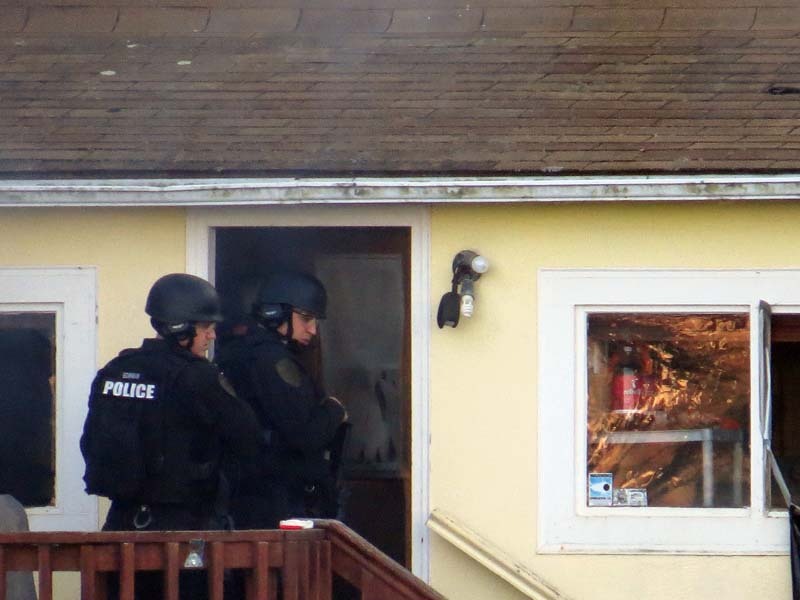 Bystanders said they heard many (7 or more?) 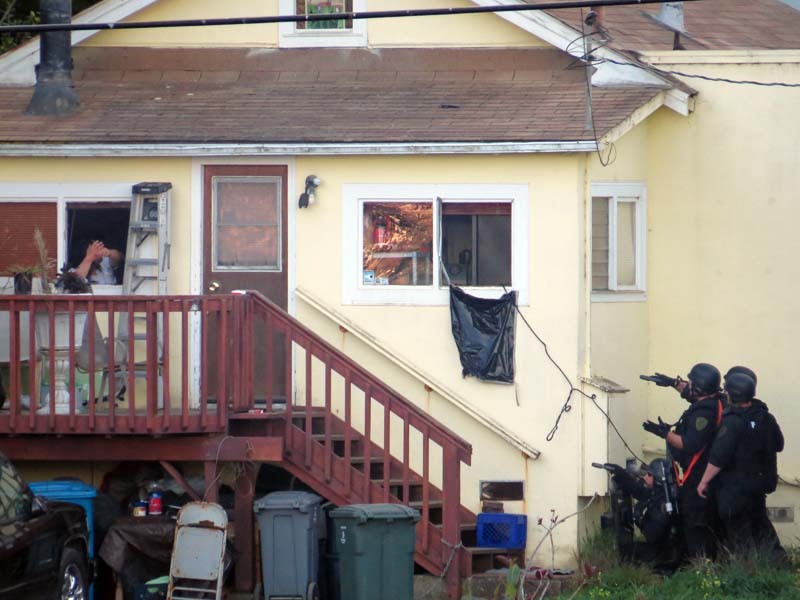 shots BEFORE the police entered the front of the house, it was assumed by the bystanders that a second group of police (not pictured here) entered in the back of the house and that set of police shot Errol. 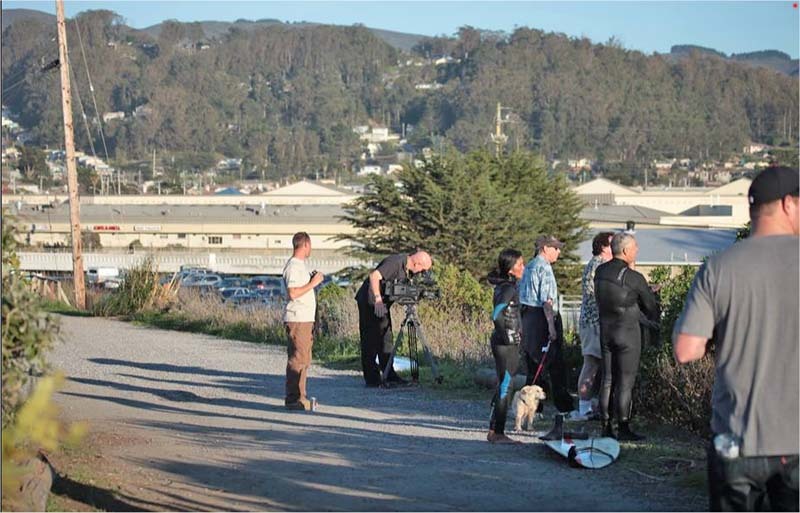 The picture below has embedded timecode 3/18/2014 at 6:30pm. 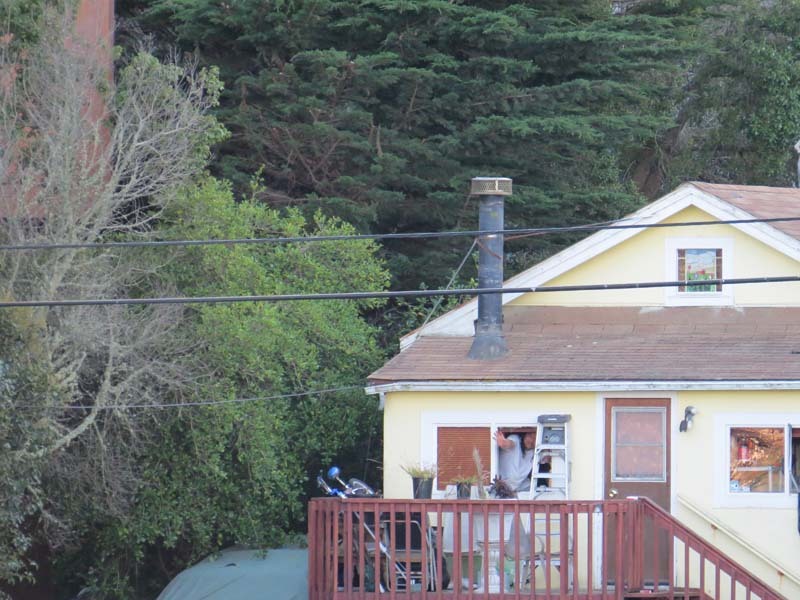 The picture below has embedded timecode 3/18/2014 at 6:35pm. 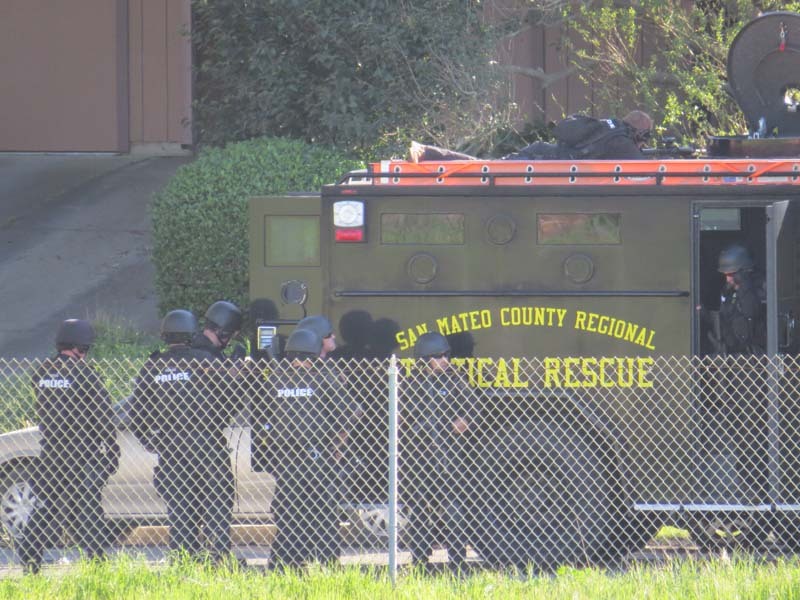 The picture below has embedded timecode 3/18/2014 at 6:41pm. 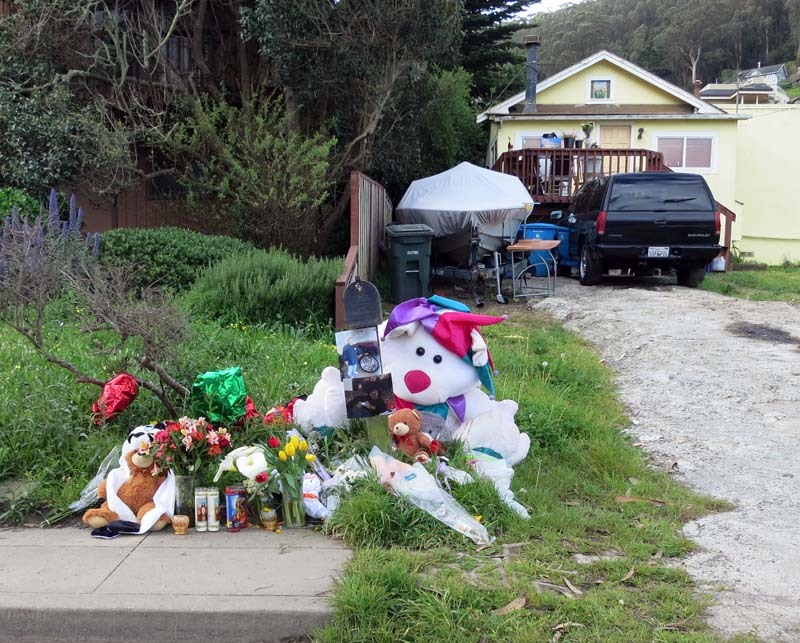 Over the next few days, neighbors dropped off stuffed animals and flowers quietly out of respect. 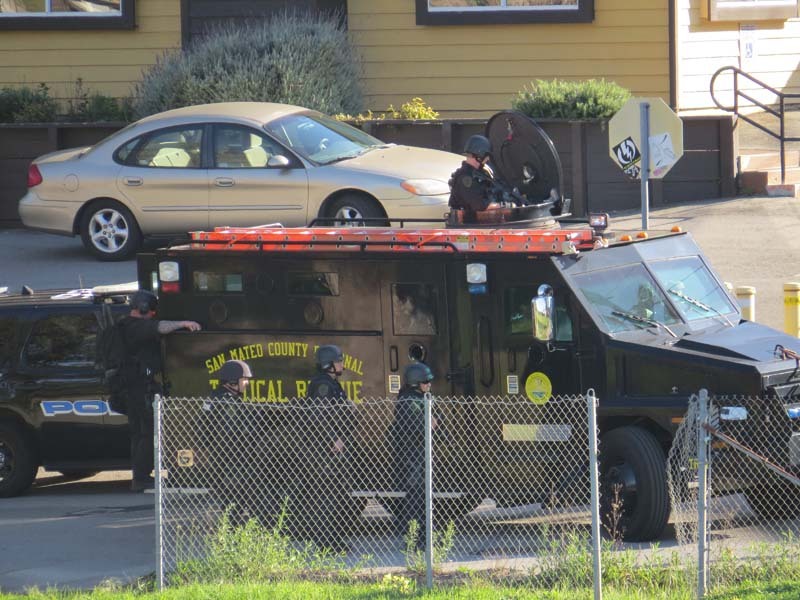 "A special note and commendation for the conduct of Officers Busalacchi and Woelkers must be made. 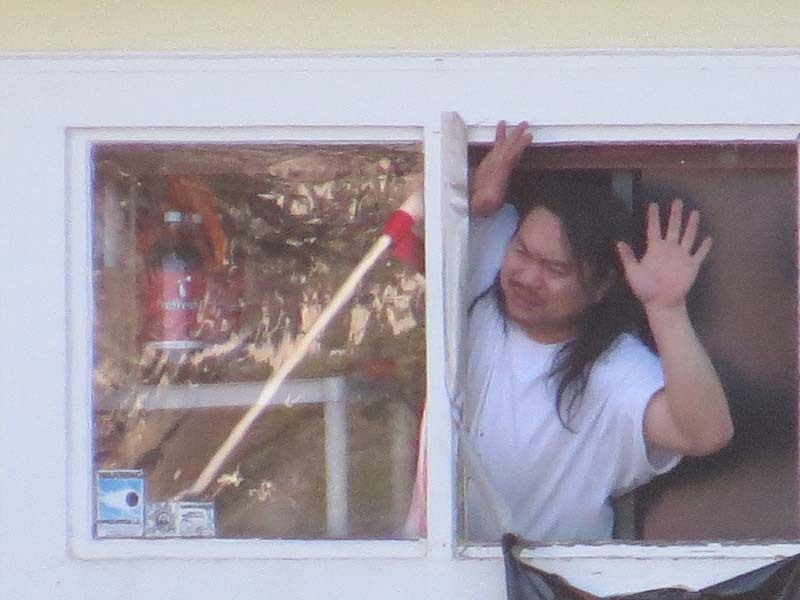 It is our belief that both officers conducted themselves in a professional, reasonable and proper manner and to the last moment sought to avoid the very result demanded by the conduct of Errol Chang. 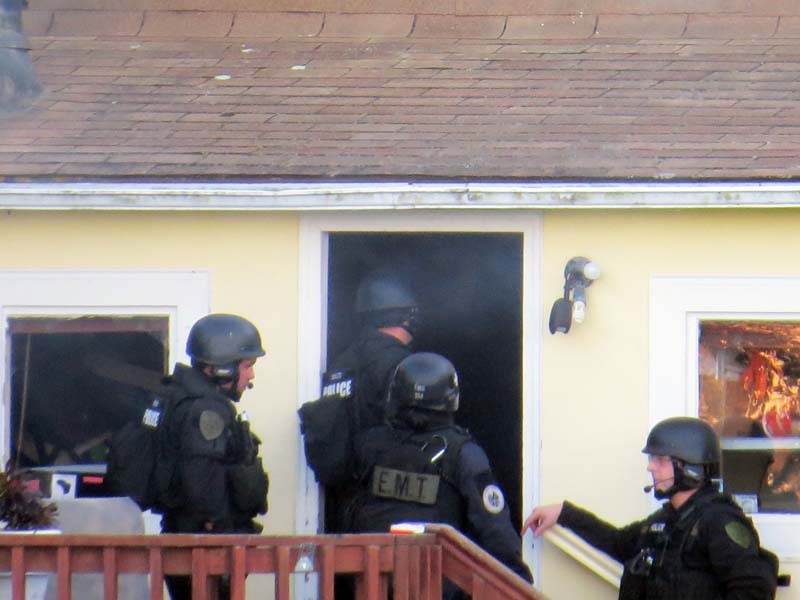 The reaction of both officers to the thread of imminent death to Ofr. 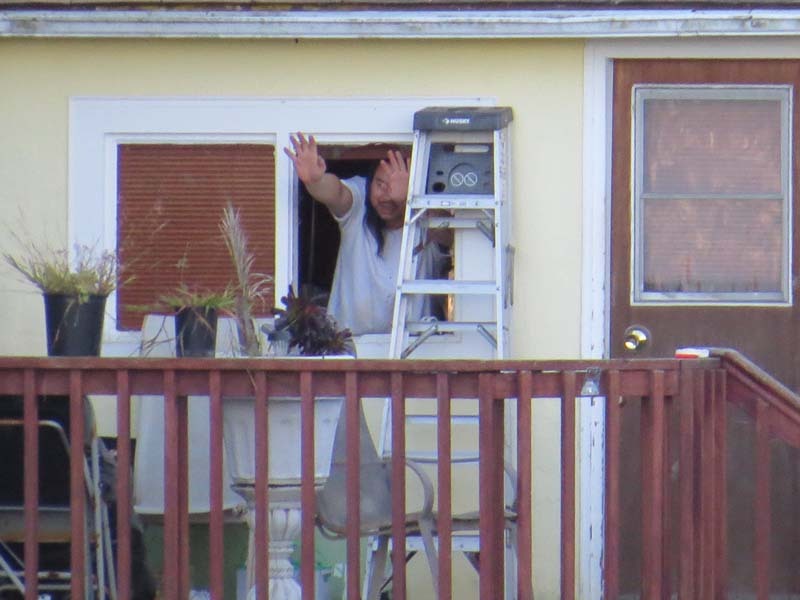 Busalacchi is to be commended. 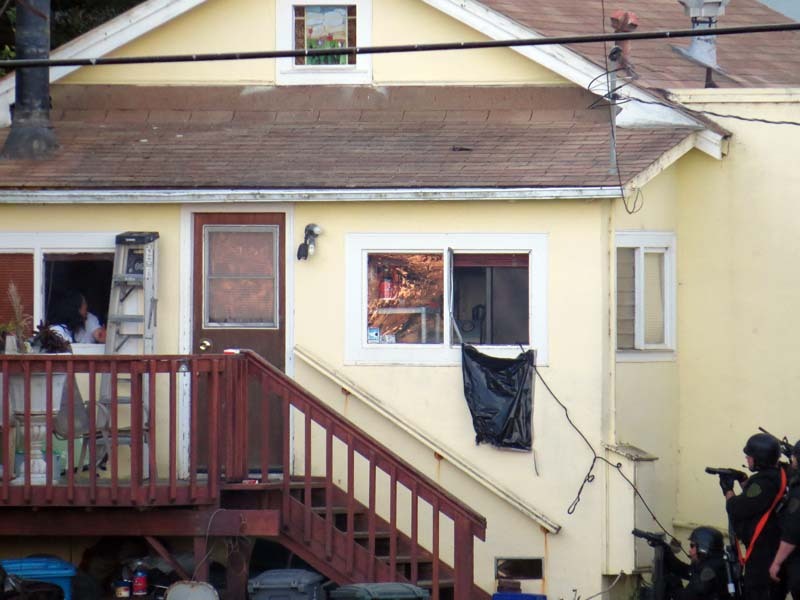 Officer Busalacchi faced a remarkably dangerous situation, knowing that an angry, irrational and armed man was now raising the knife to stab him again. 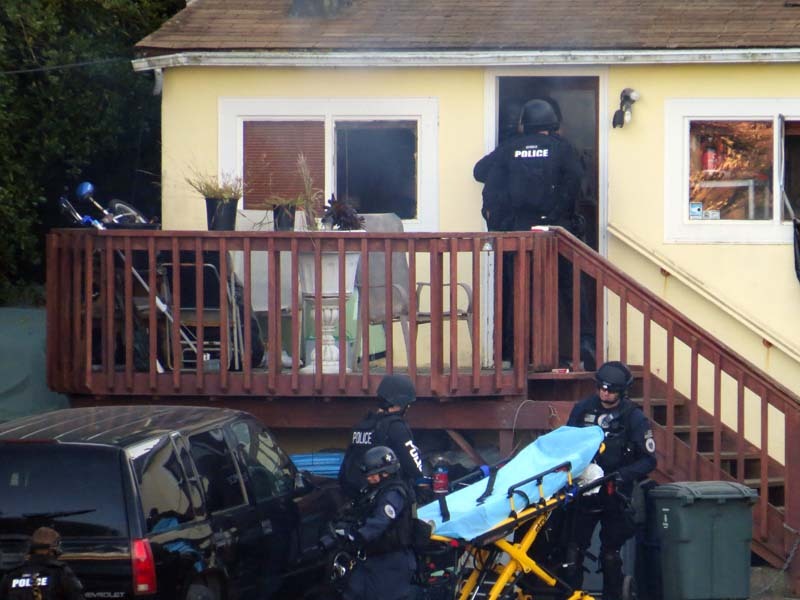 When he found it necessary to resort to lethal force, he did so in a manner that probably saved his own life. 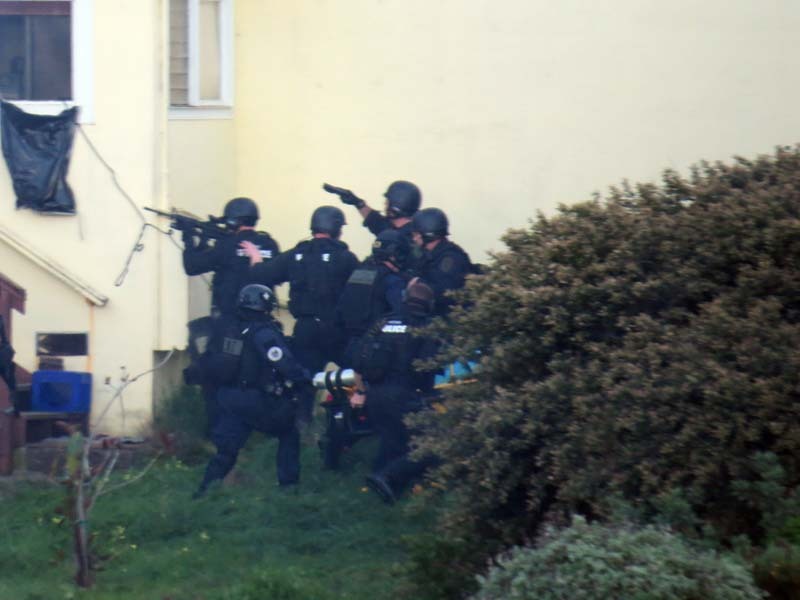 Ofr. 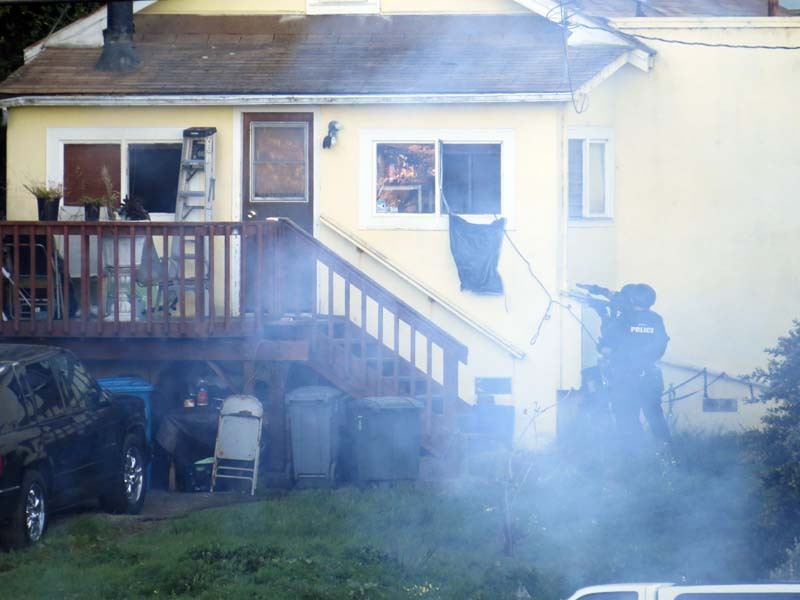 Woelker's conduct in seeking to prevent further attack and the likely death of his fellow officer was equally commendable. 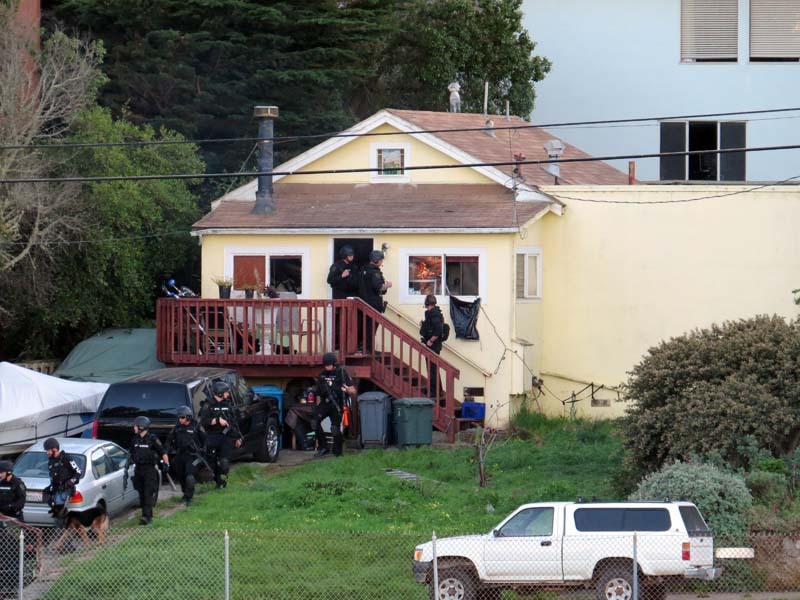 The conduct of the officers in this case can only be eescribed as exemplary and the community was well served by their actions. 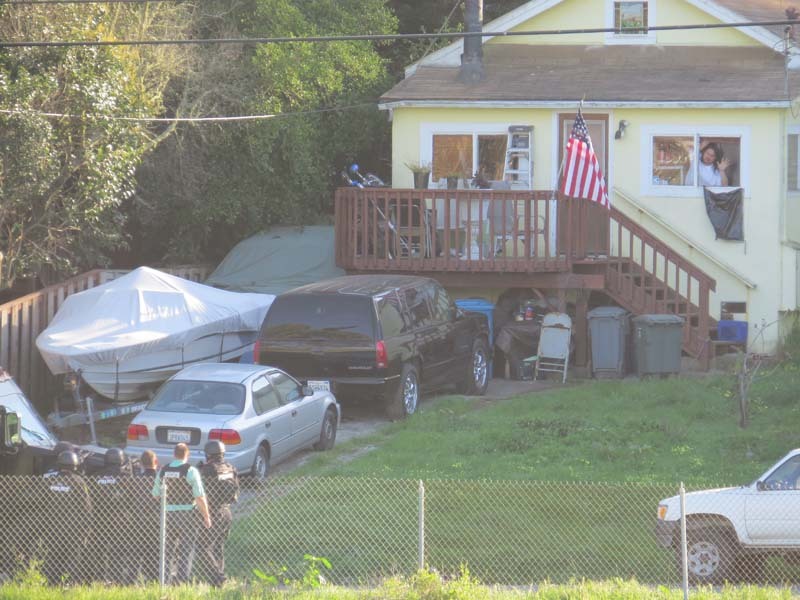 Very truly yours, STEPHEN M. WAGSTAFFE, DISTRICT ATTORNEY." 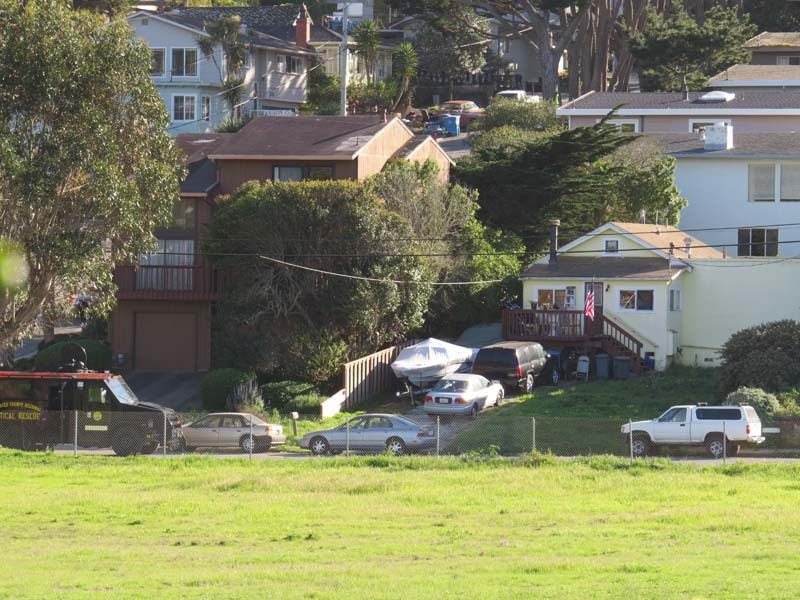 Editor Brian here, author of this webpage: I really very firmly disagree with Mr. Wagstaffe in his final conclusion. 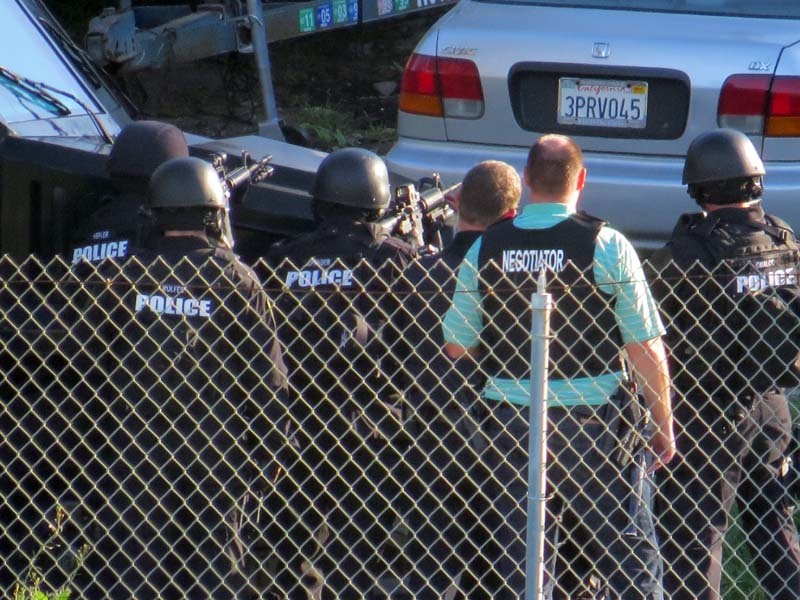 Even if all those events unfolded exactly as they say, in the FINAL SECOND the officers may not have had a choice. 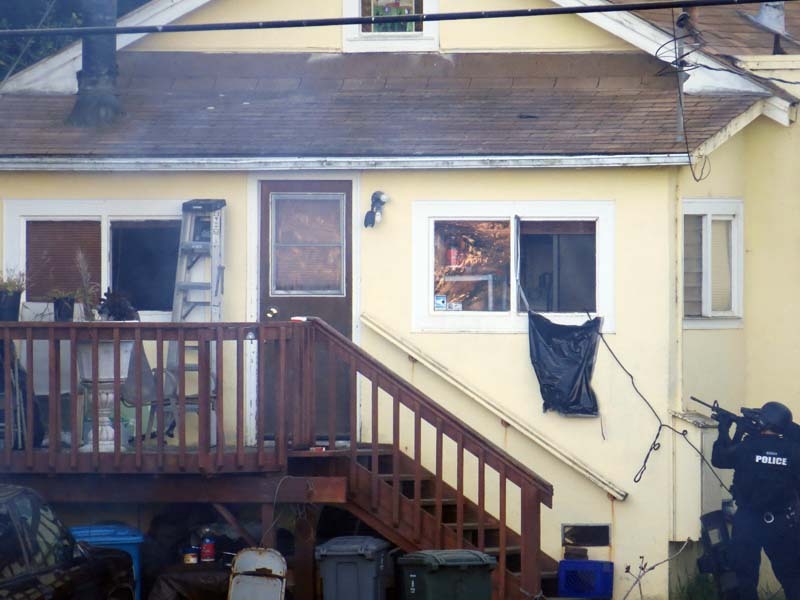 But everything leading up to that final second was a train wreck of bad decisions that leads up to that final second being a "bad situation". 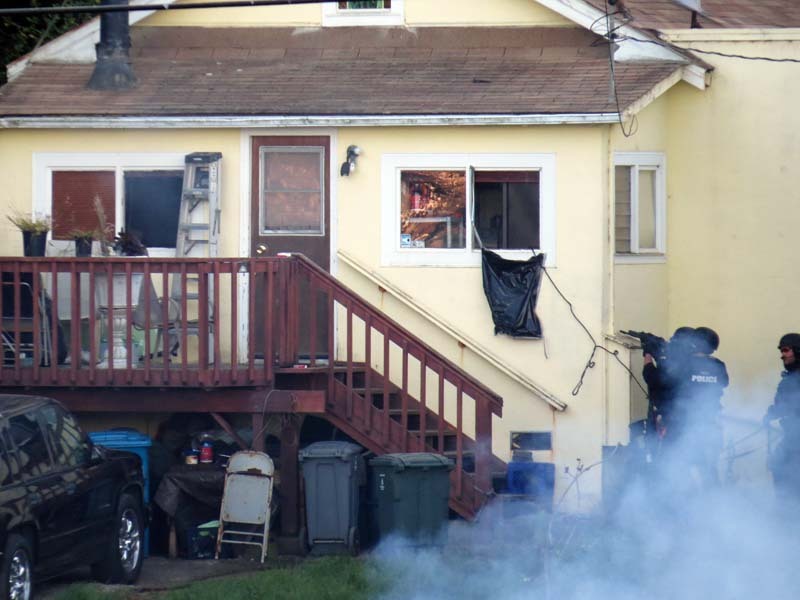 In hindsight, maybe they should not have charged in, but instead lobbed in smoke until Error simply had to come out? 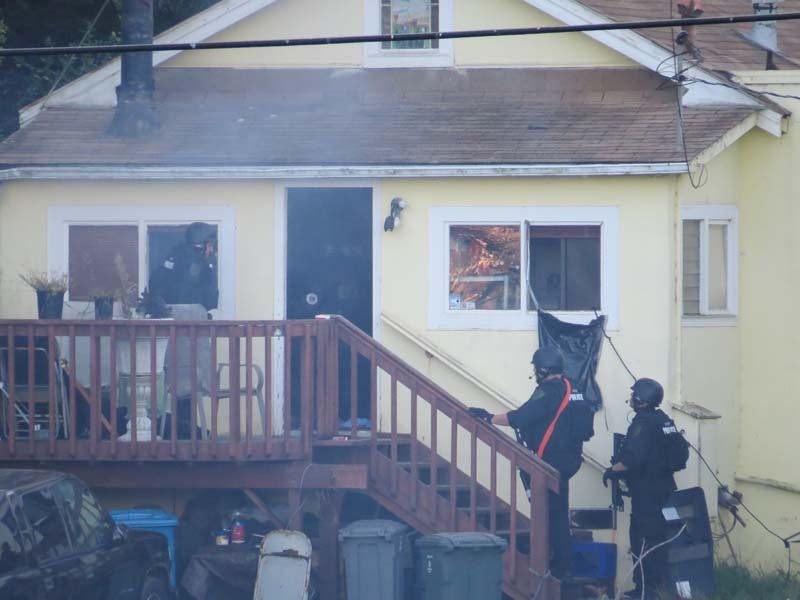 And even after they decided not to "smoke him out", they ran into a bad situation and then confronted with the barricade they could have retreated now knowing more information? 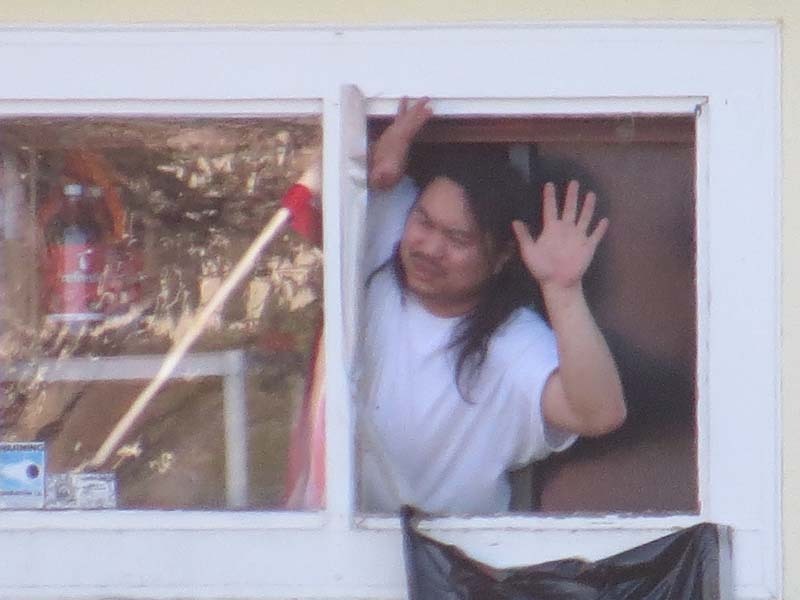 But then Officer Busalacchi made yet ANOTHER mistake (one heck of a bad judgment call that turned out to be fatal to Errol) attempting to climb over the barricade Errol setup, and then getting caught snagged up there (so it turns out he miss judged whether he make it over the barricade, right?) 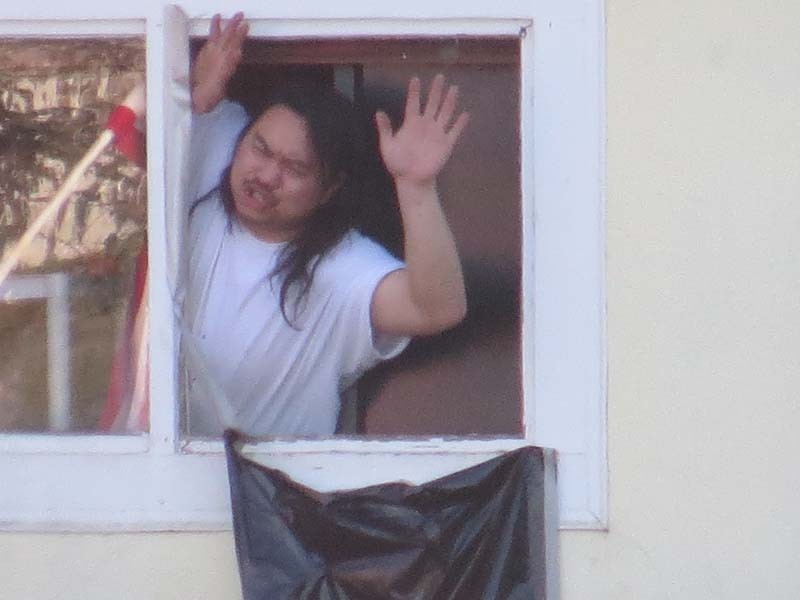 and being in a terrible place where he couldn't retreat (which is all Errol probably wanted him to do) and he couldn't go forward and that one officer was then all alone exposed instead of in the safety of a group of officers and that one officer was incapacitated entirely due to his own actions. 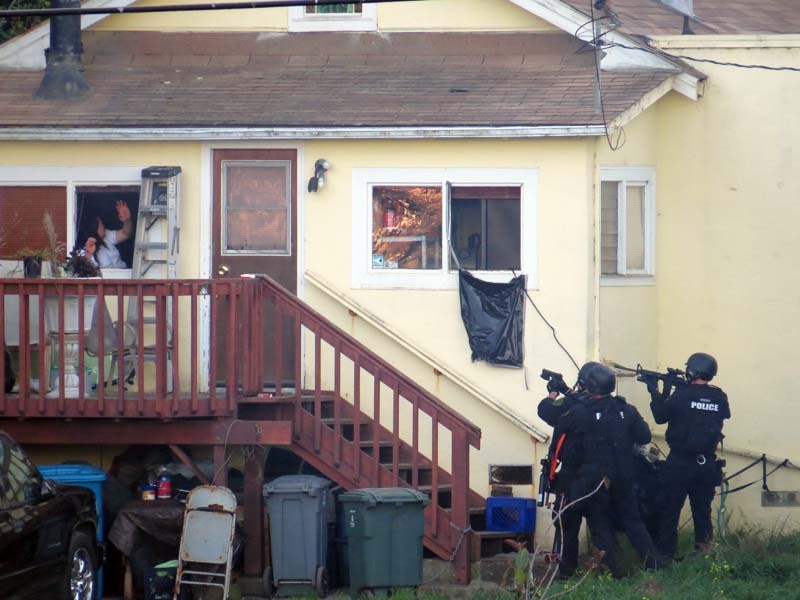 I do understand it was a high pressure situation, and hindsight is 20/20, and I'm not saying the officers should be punished. 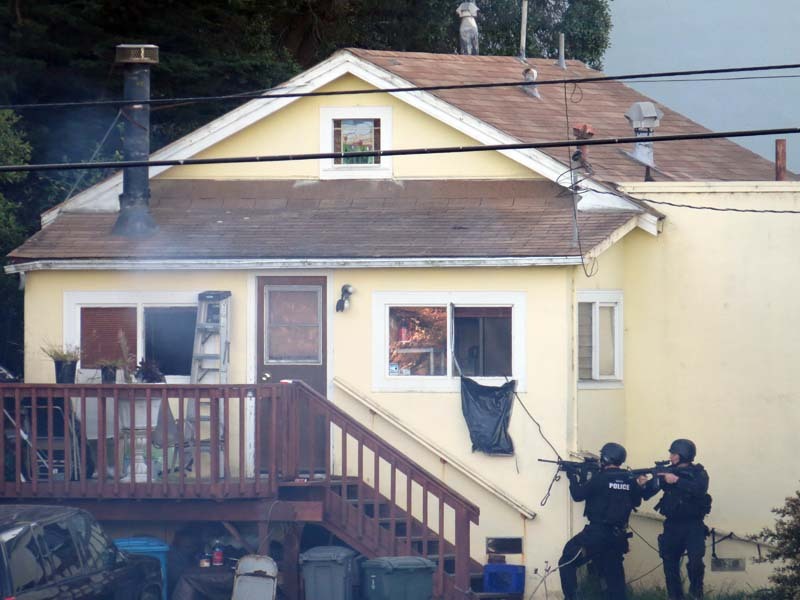 But hindsight is 20/20 and it is really hard to justify saying "the officers made every decision that day correctly" when the end result is Errol is dead. 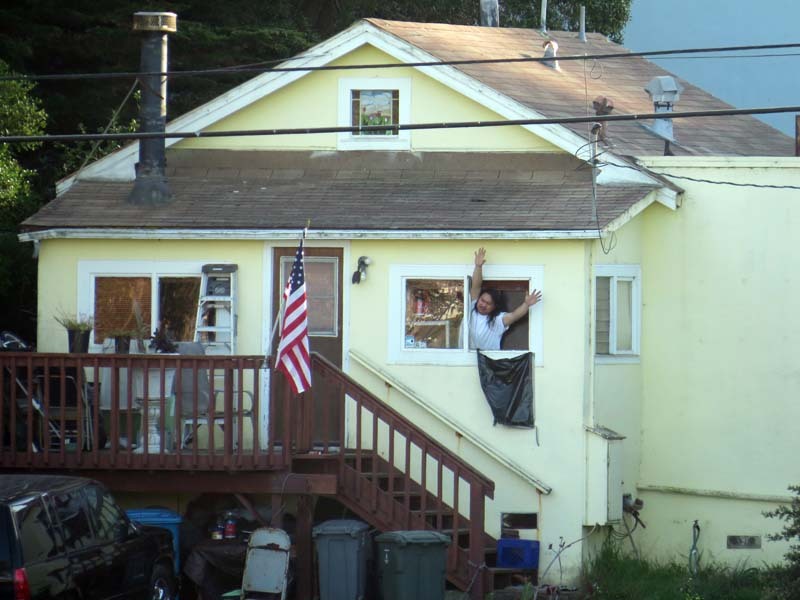 If we say that, we don't improve, we don't learn from the tragedy, and next time the same set of bad decisions will happen again.